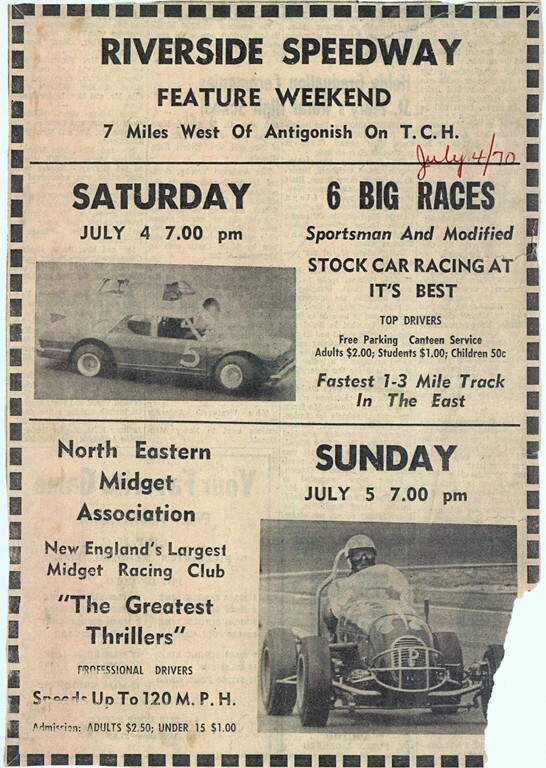 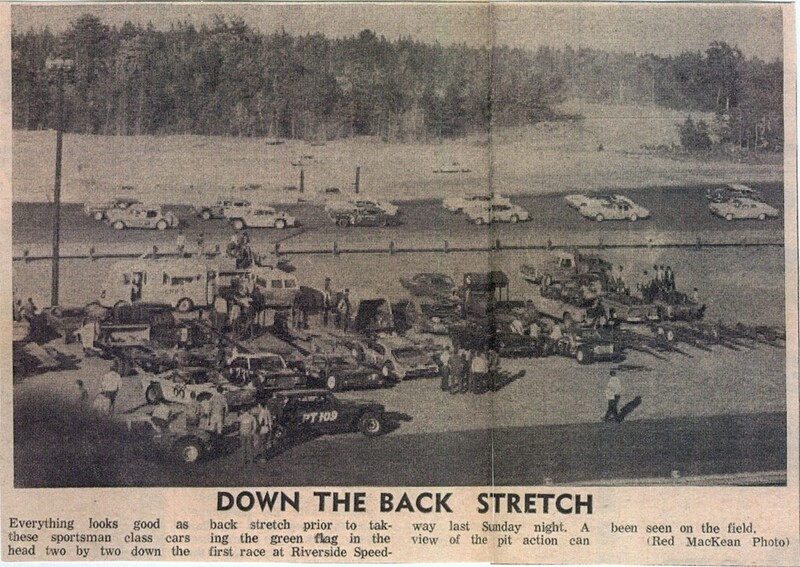 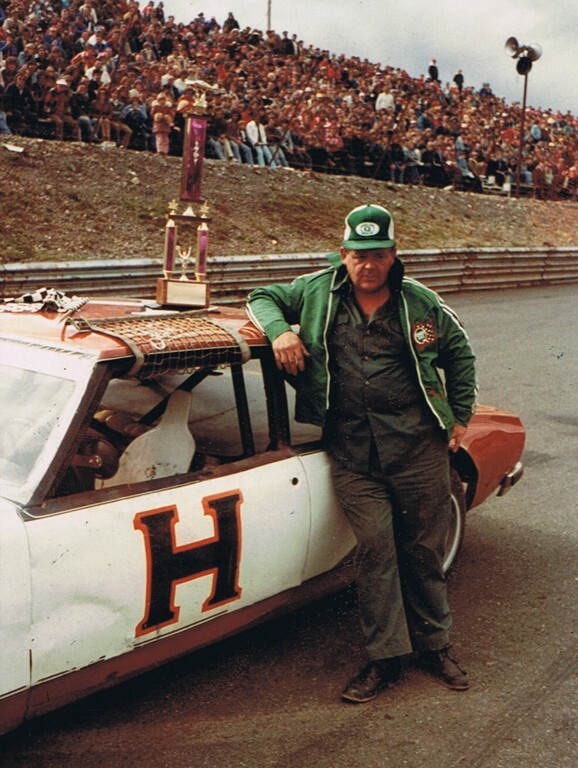 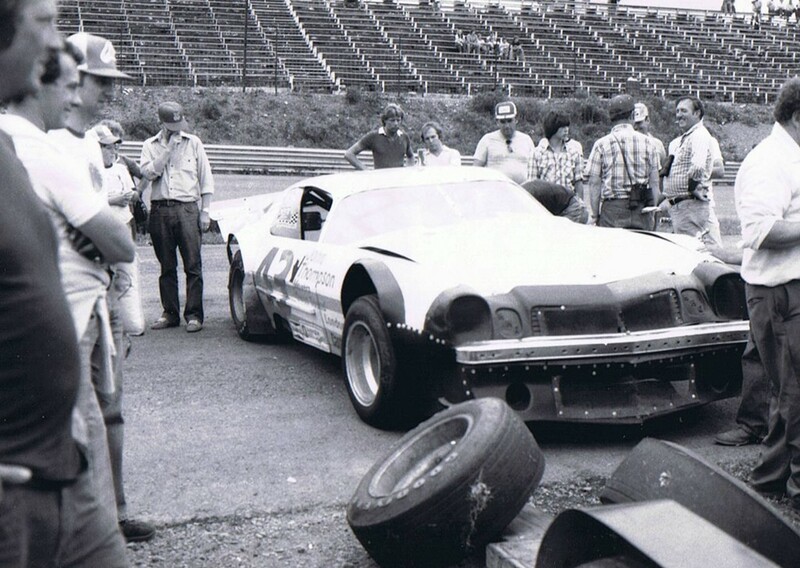 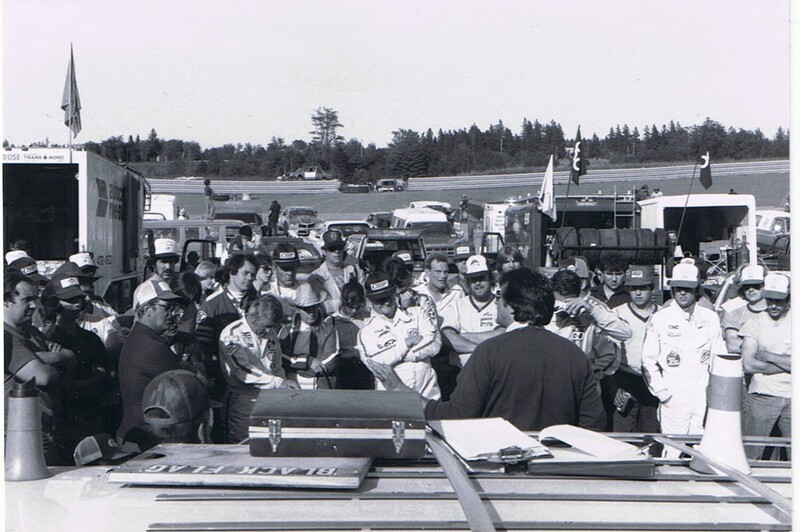 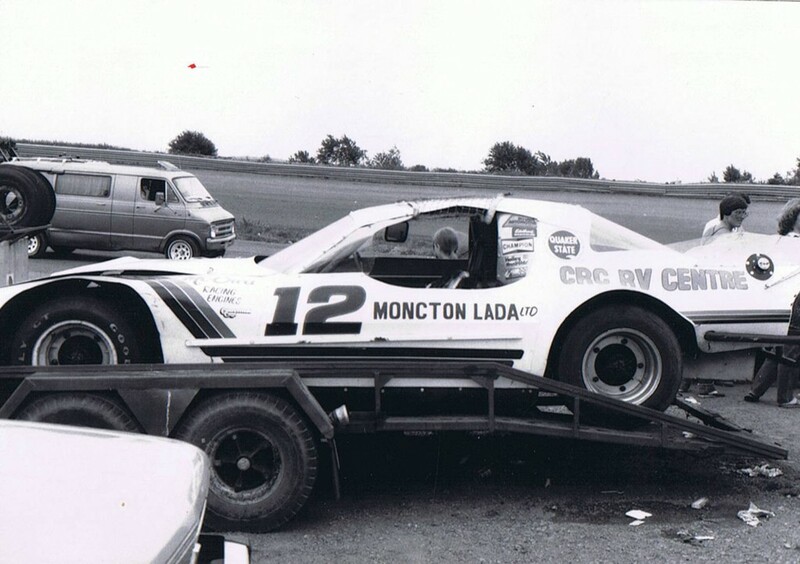 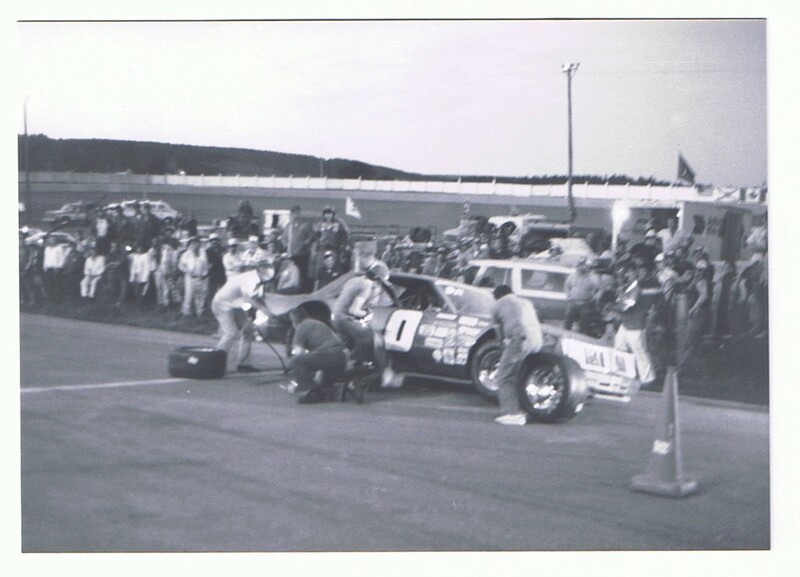 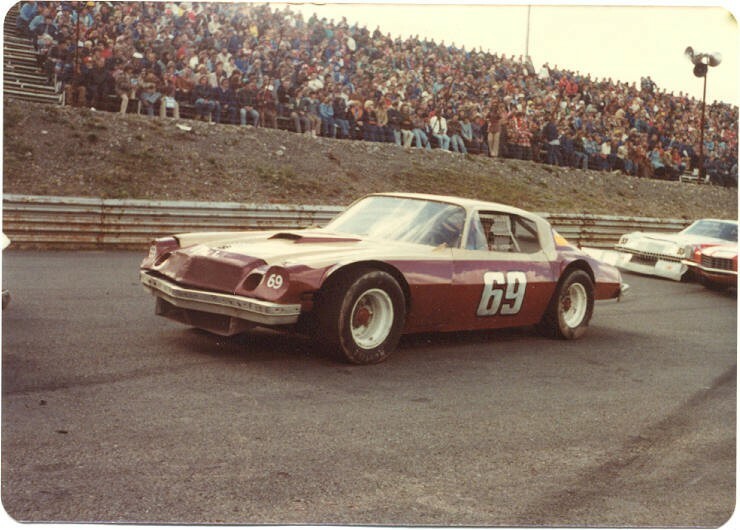 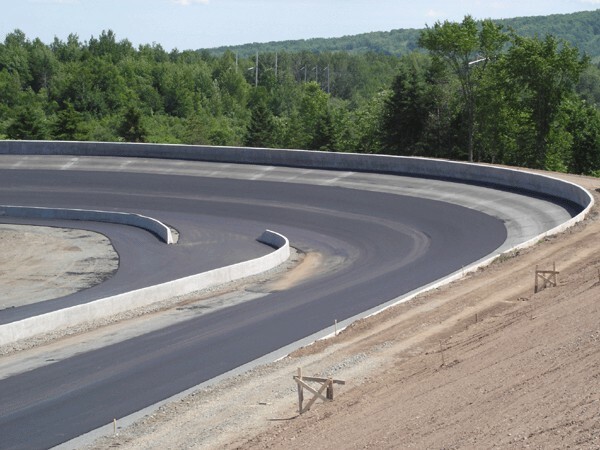 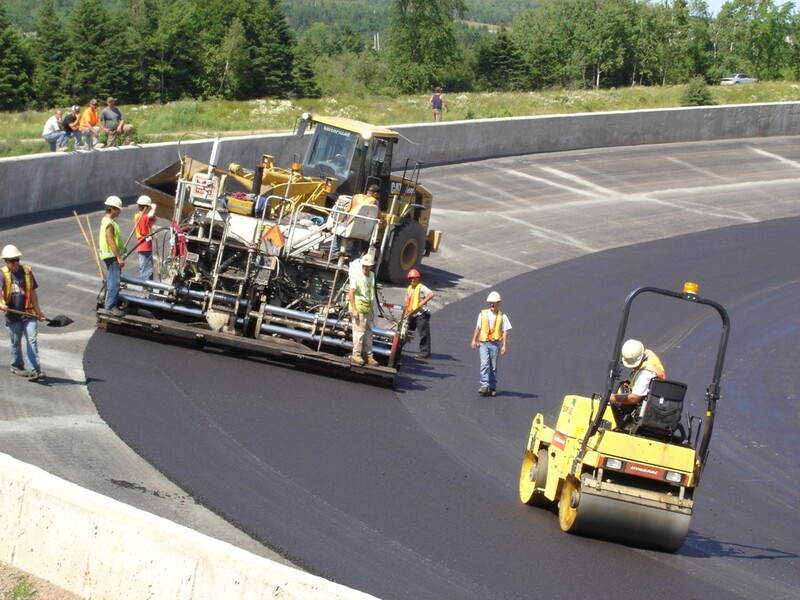 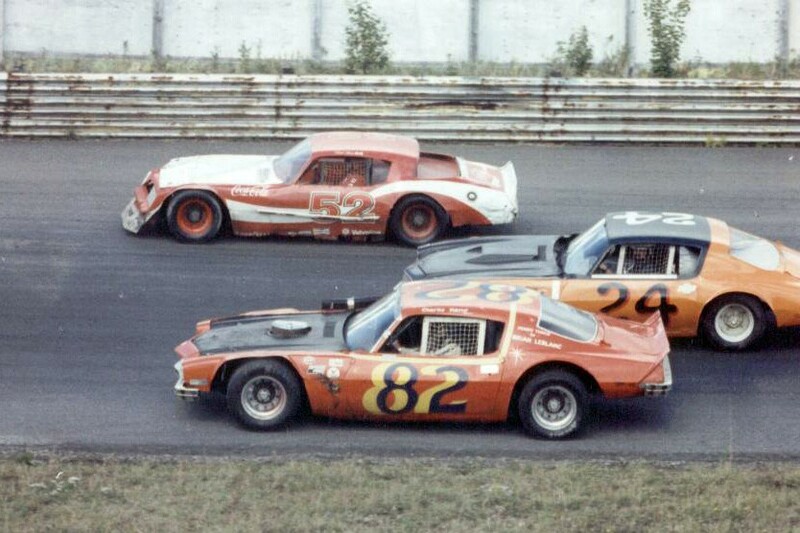 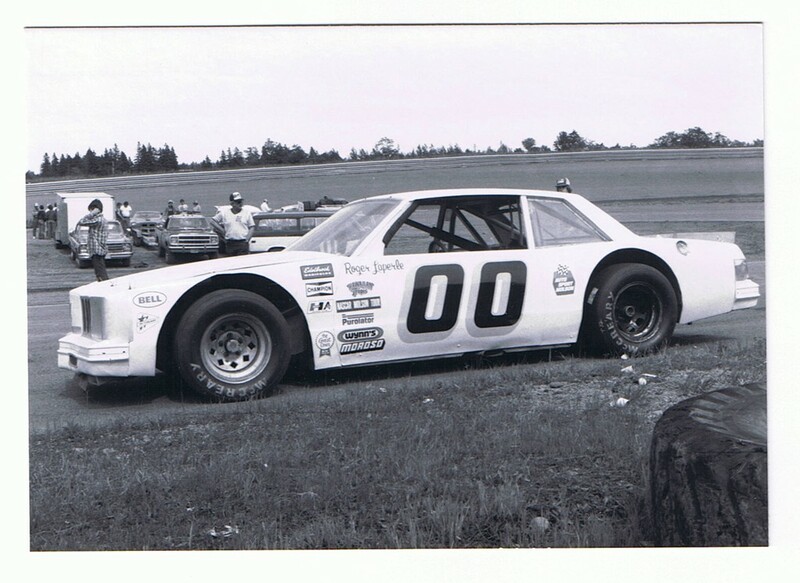 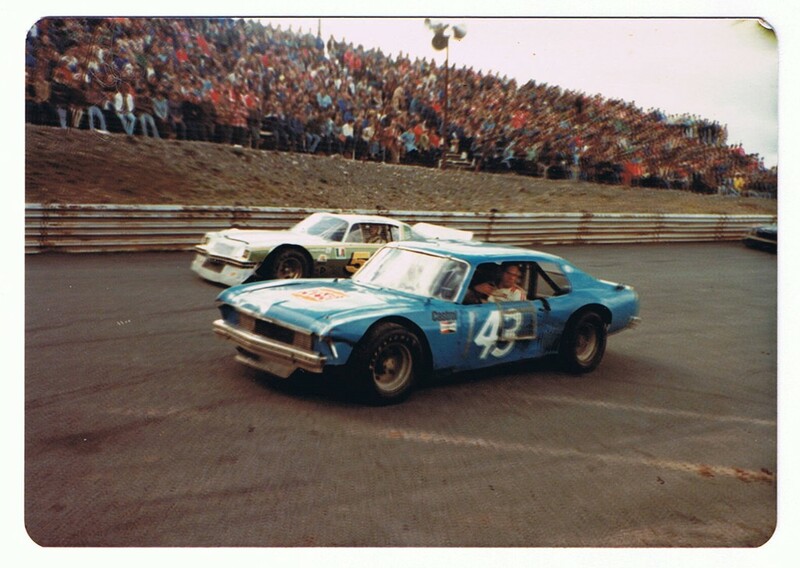 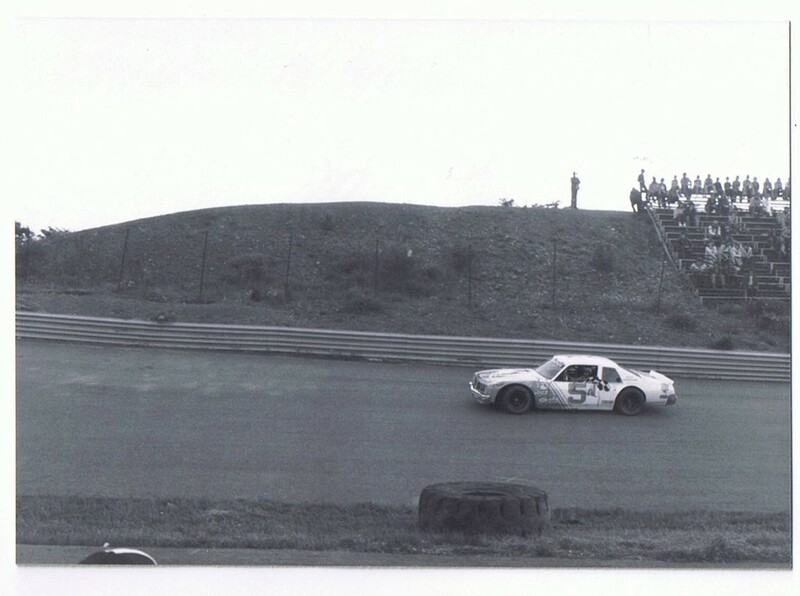 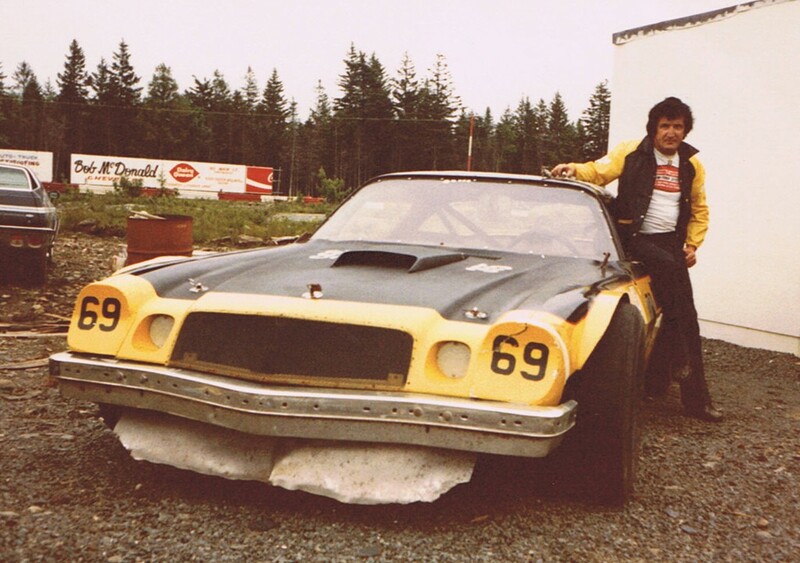 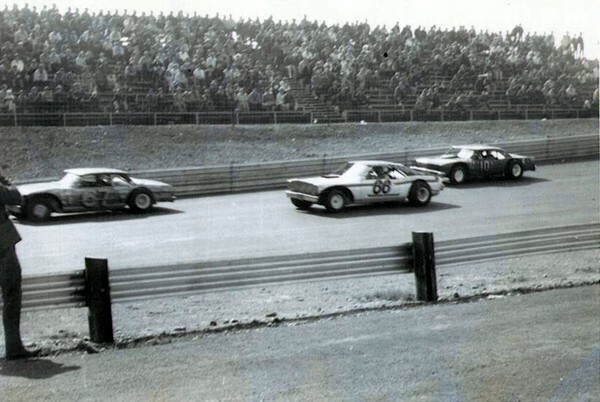 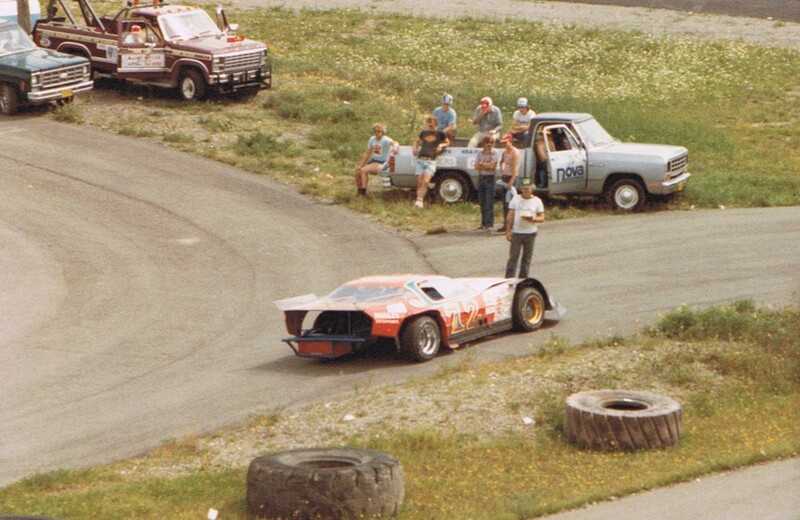 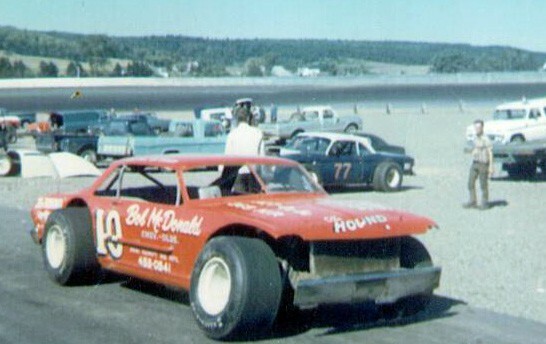 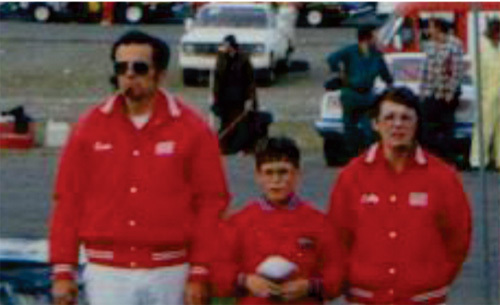 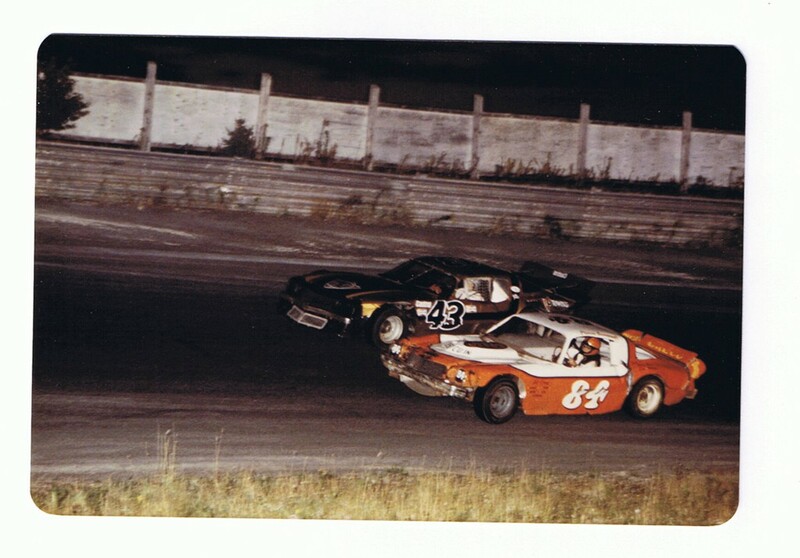 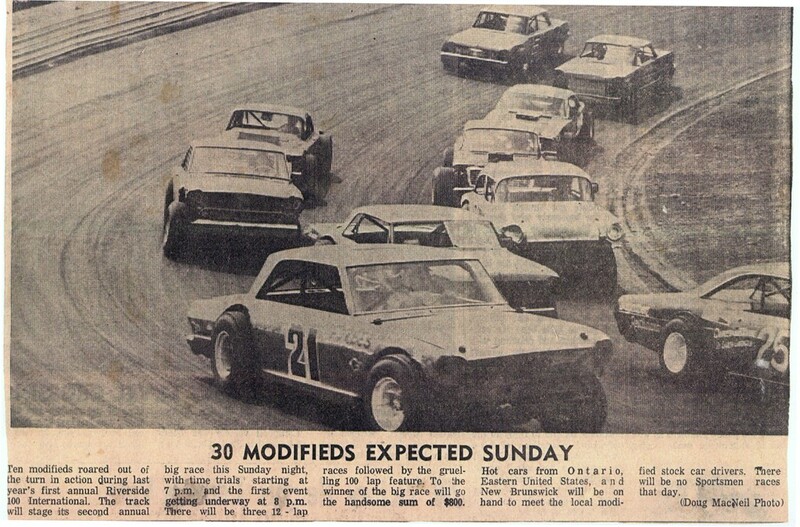 Riverside International Speedway was built and opened in 1969 under the helm of Antigonish businessman, the late John Chisholm. 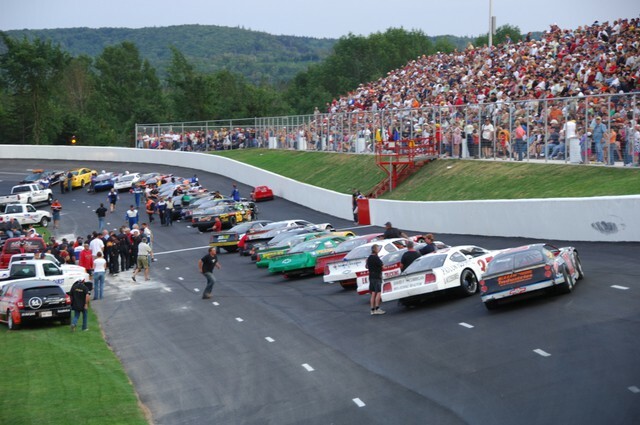 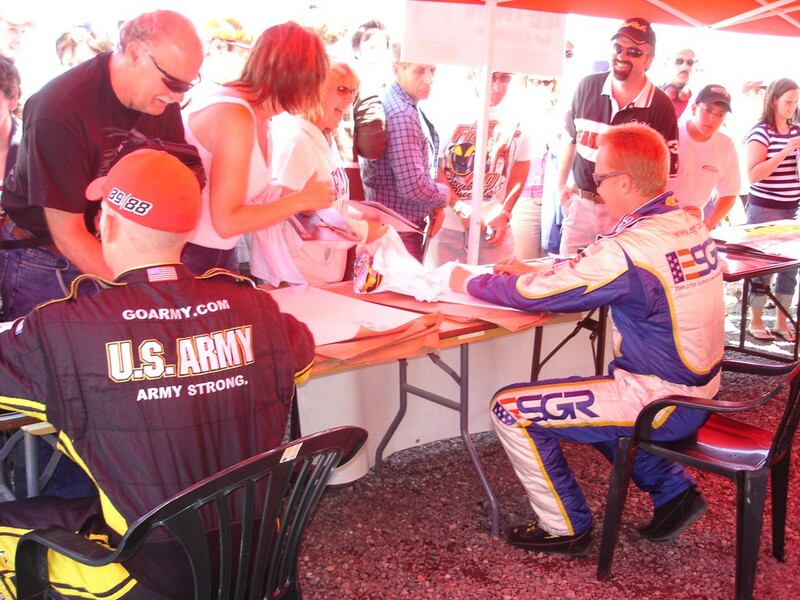 The venue has consistently attracted big shows, big crowds, and big names – including NASCAR’s Benny Parsons, Kevin Lepage, Ricky Craven, Aric Almirola, Marcos Ambrose, David Reutimann, Regan Smith, Joey Logano, Brad Keselowksi, Austin Theriault, Matt Crafton, Mark Martin, and for 2018, Kenny Wallace. 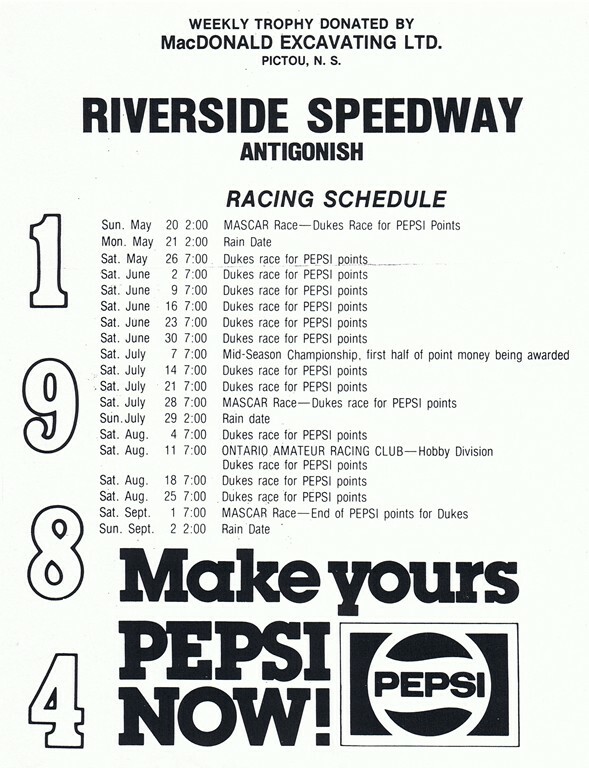 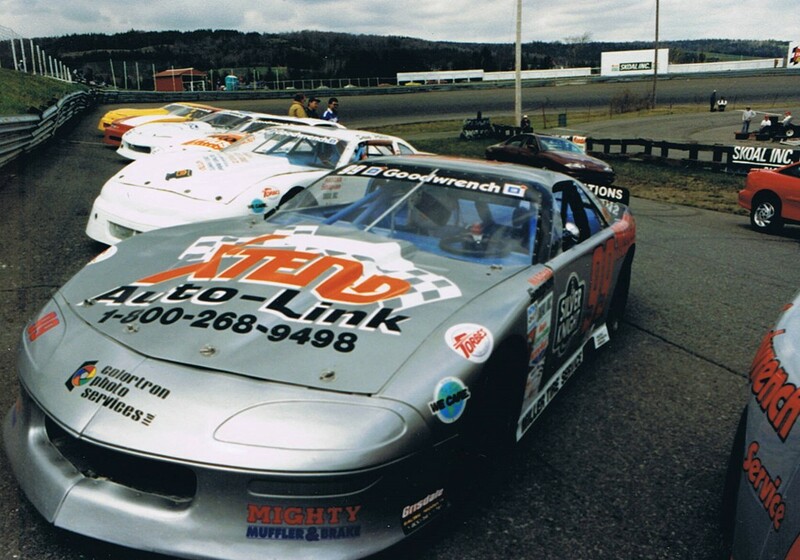 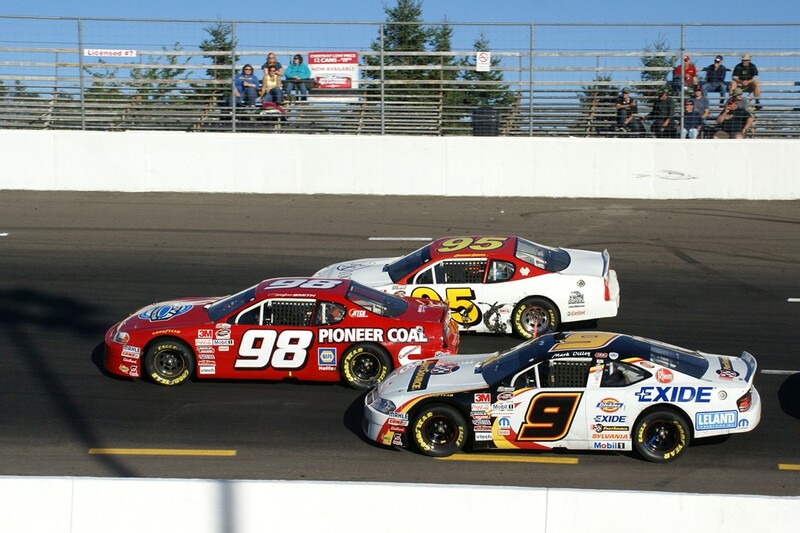 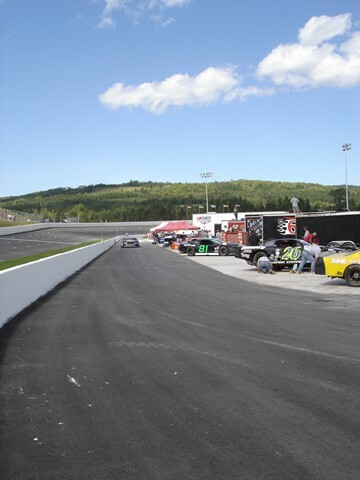 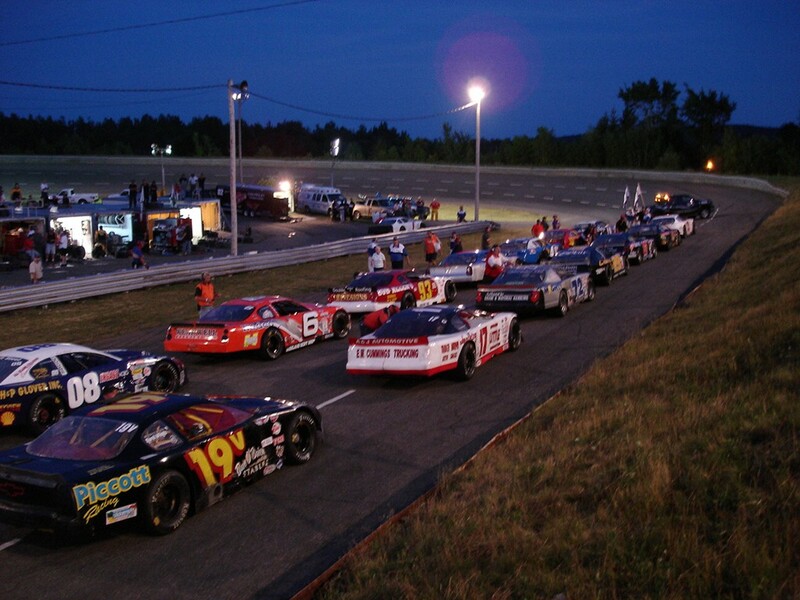 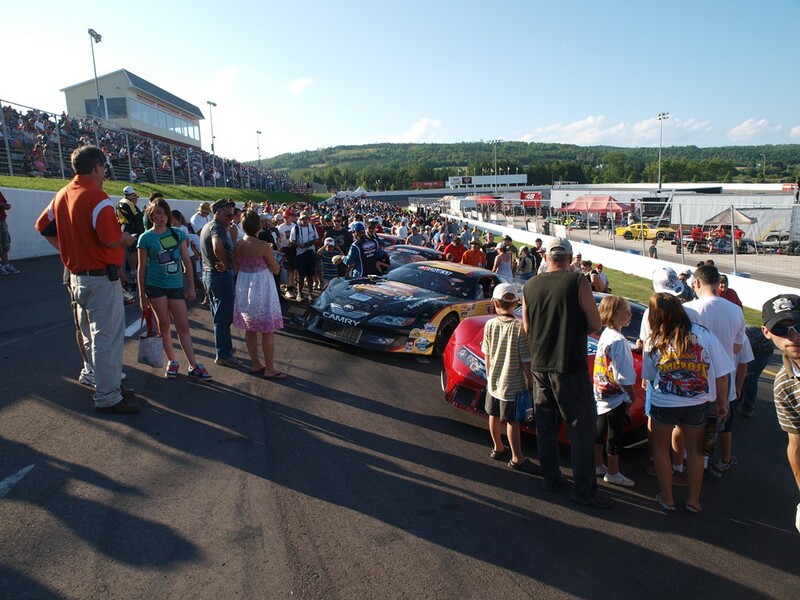 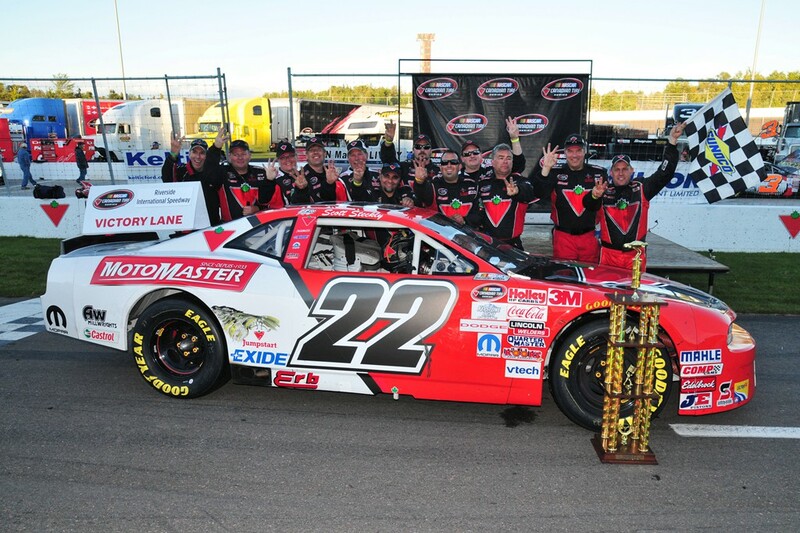 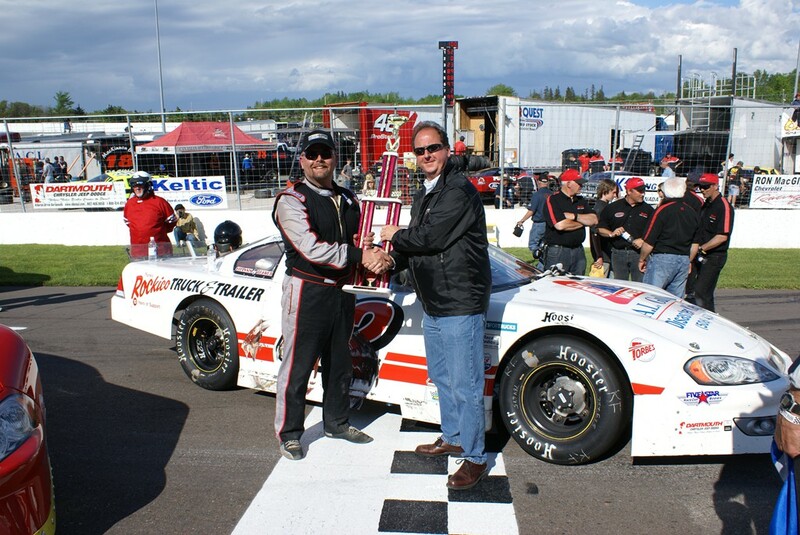 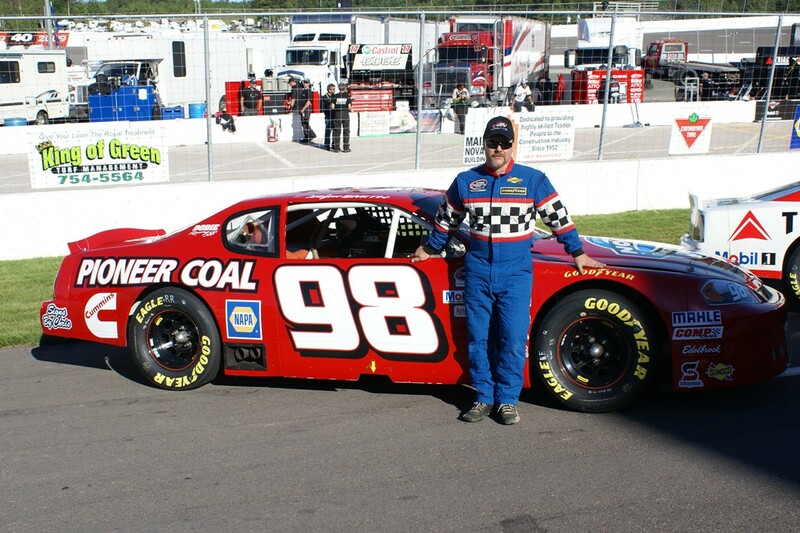 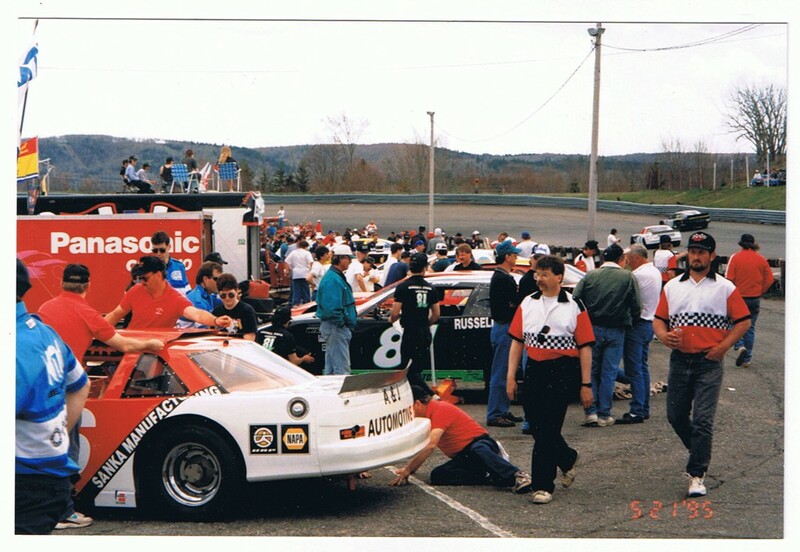 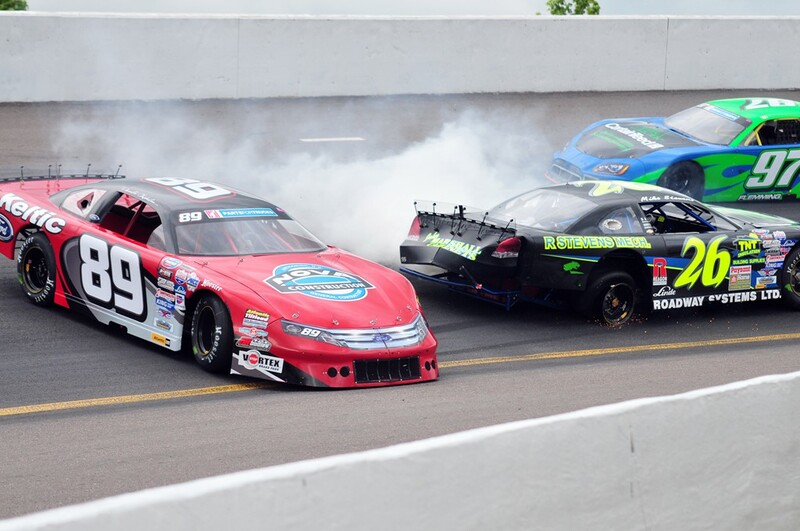 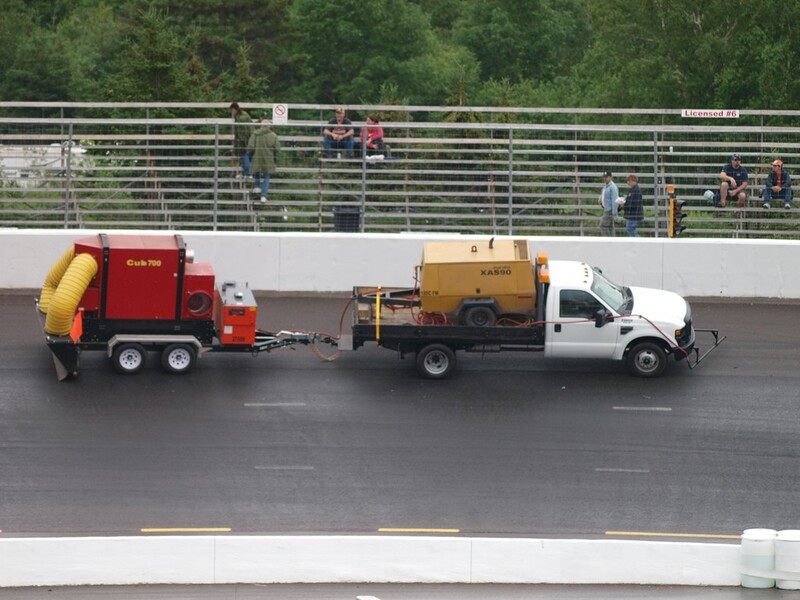 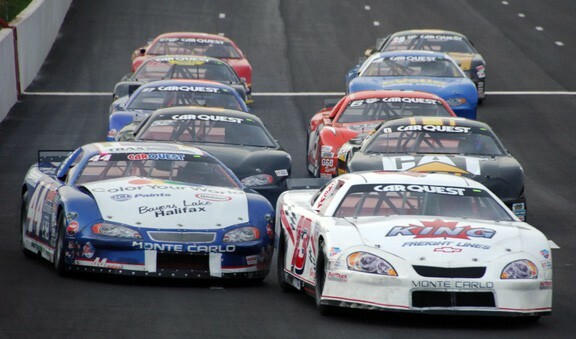 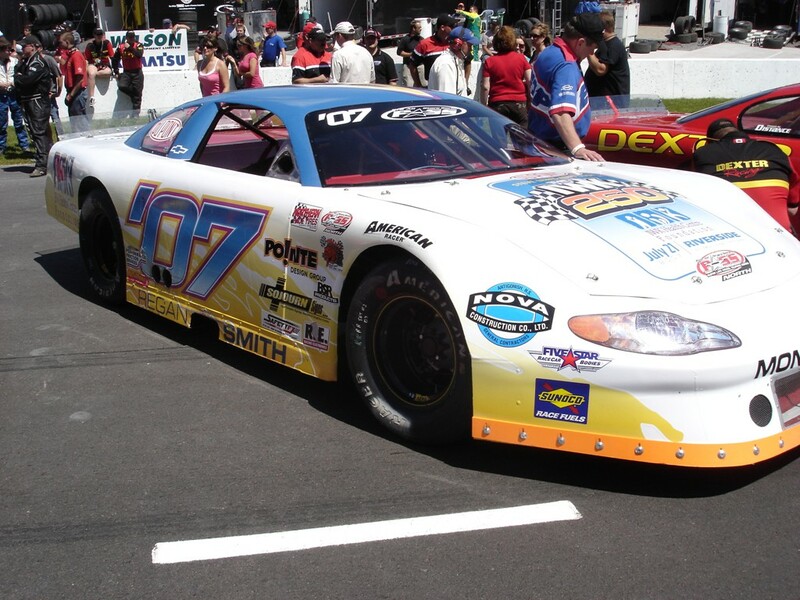 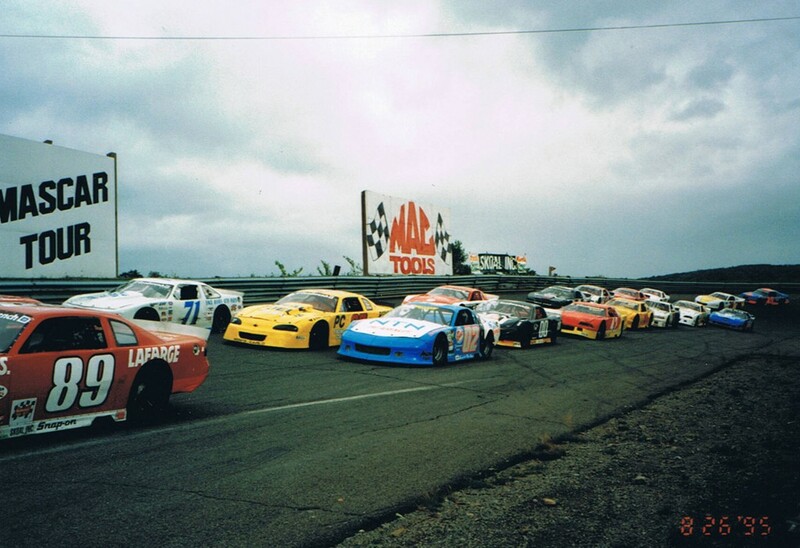 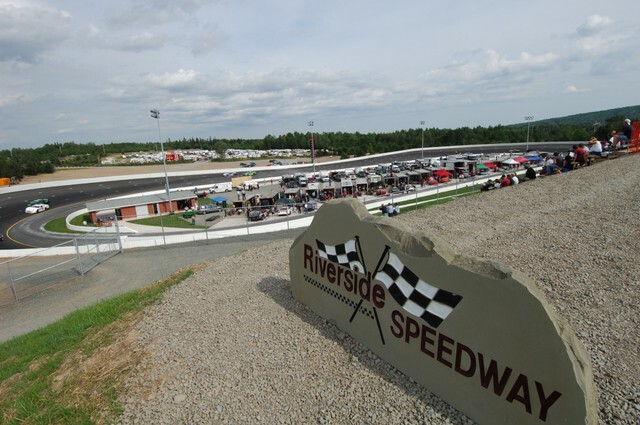 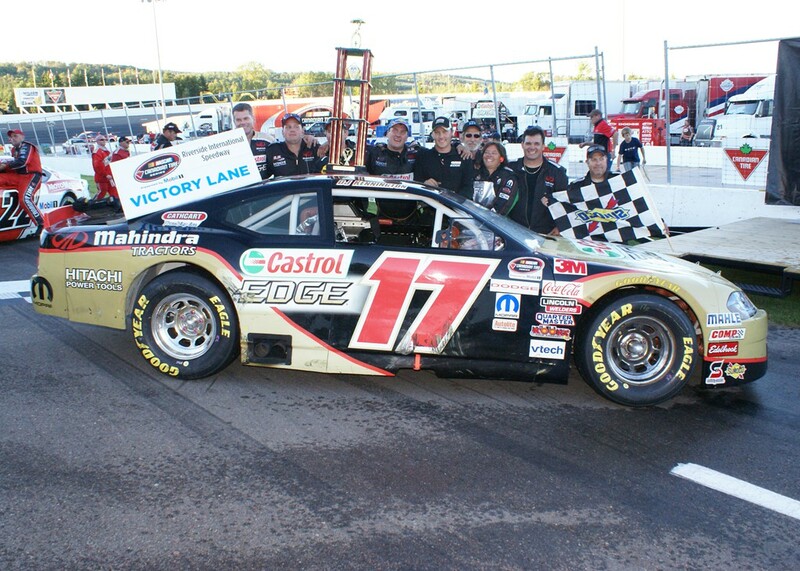 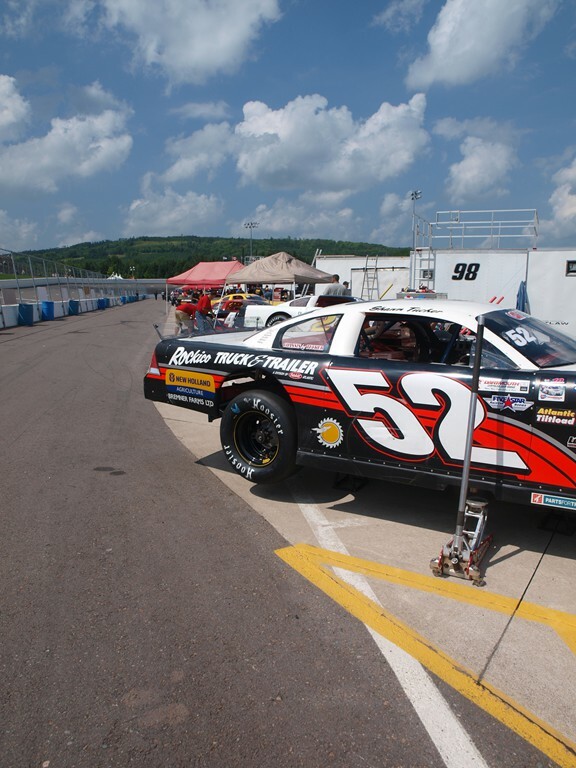 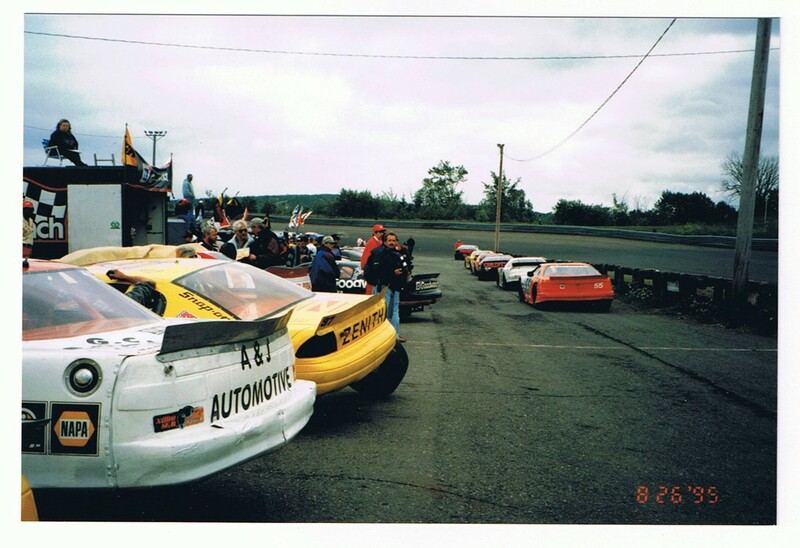 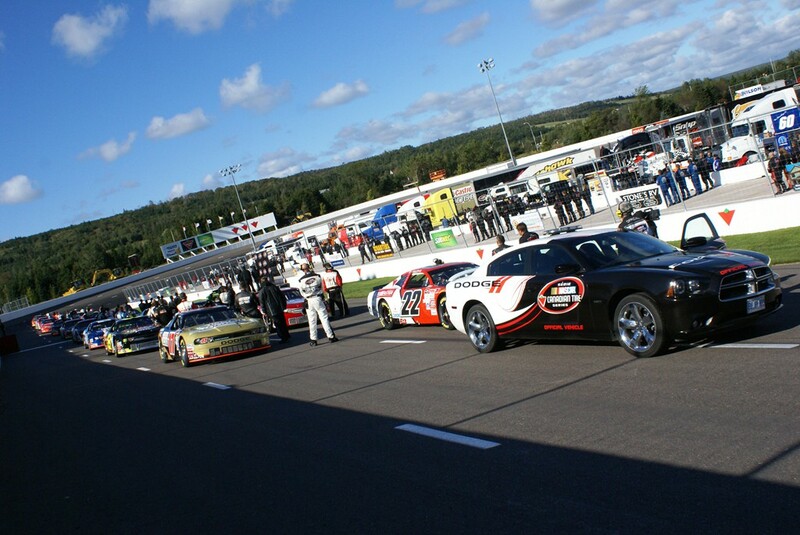 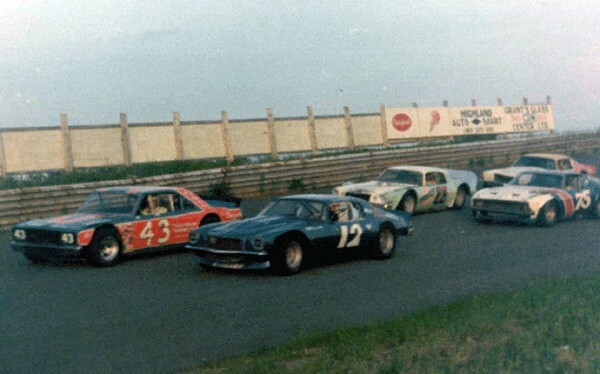 Riverside is the only stock car racing facility in Canada east of Quebec to host the NASCAR Pinty’s Series annually since its inception in 2007; and with its NASCAR affiliation reaching back into the early 80s when it hosted the NASCAR Busch East Series, Riverside’s NASCAR roots reach back further than any other active track in the country. 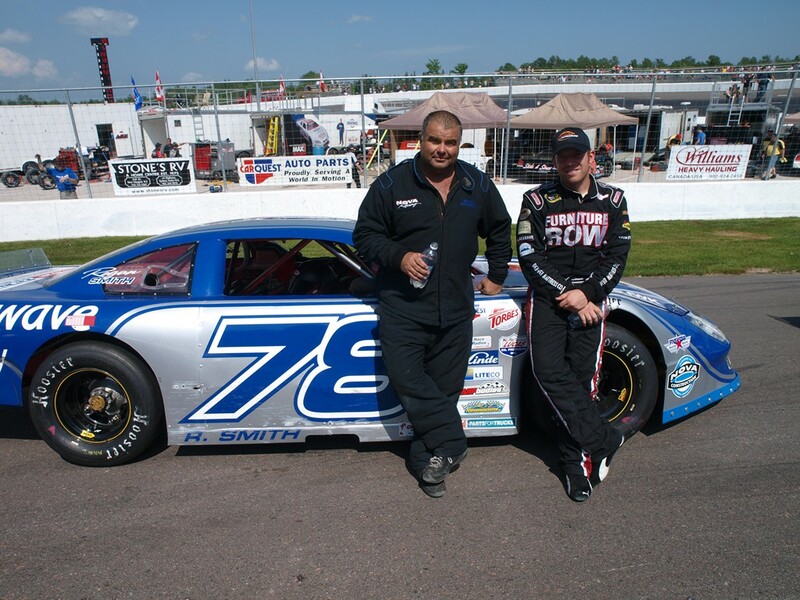 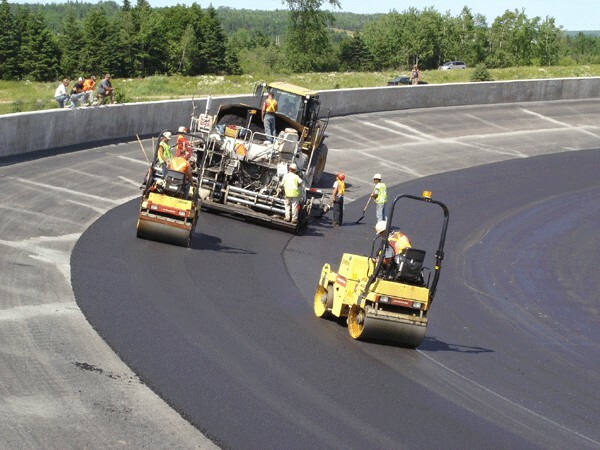 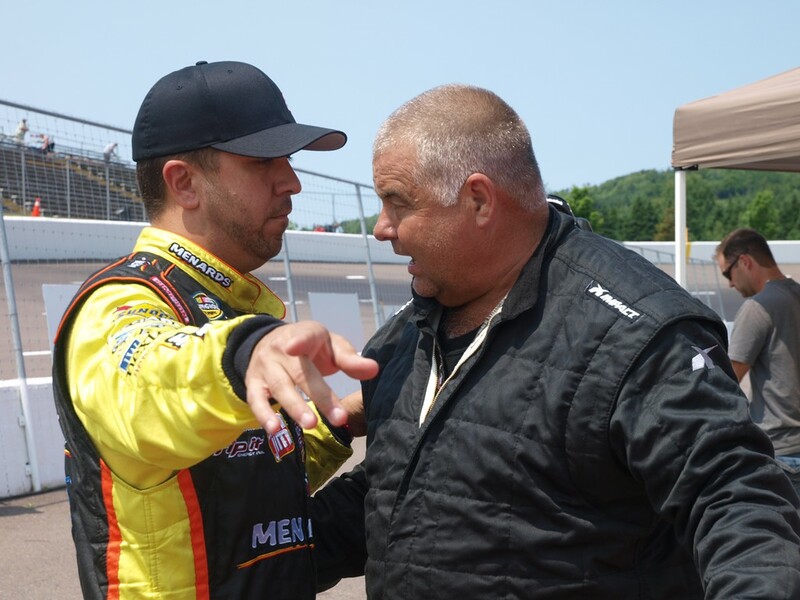 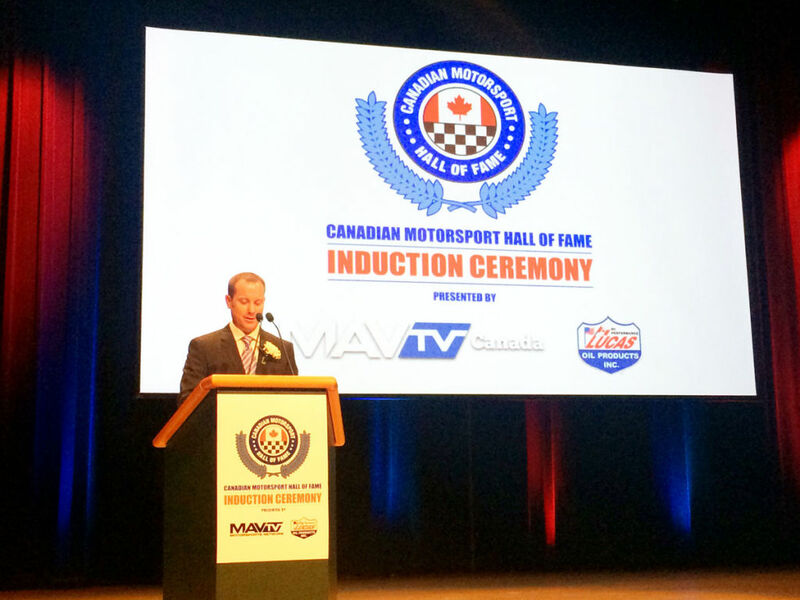 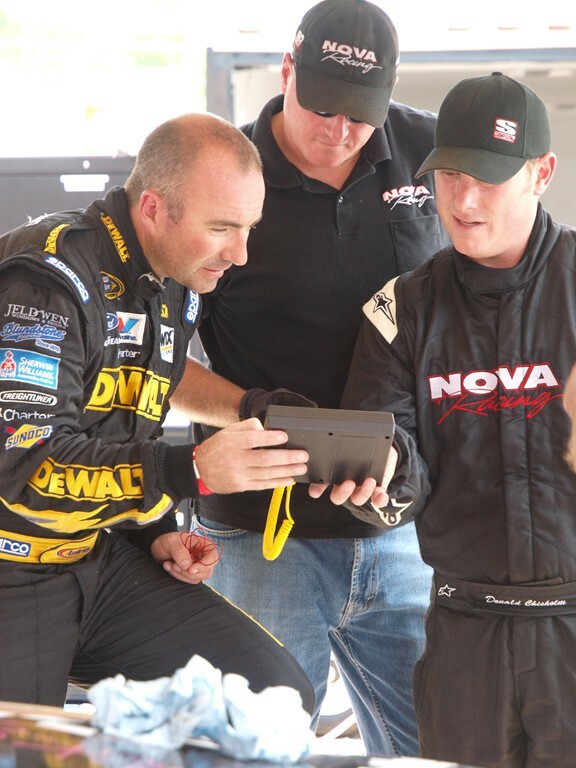 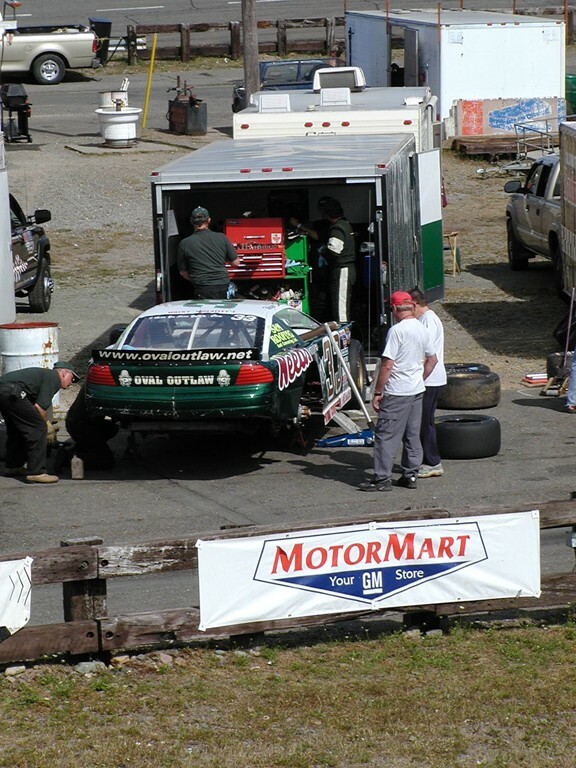 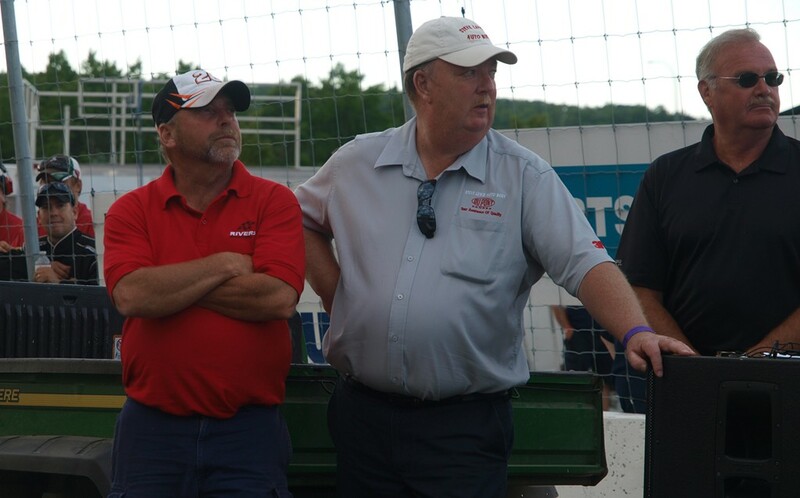 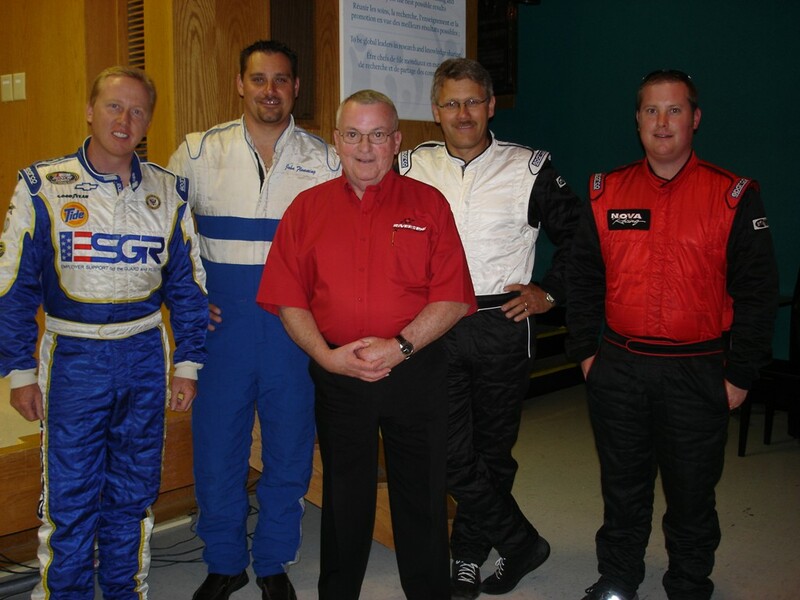 We recognize the contributions of those that have helped build Maritime motorsports and especially those that have helped grow our facility to be one of the premier short tracks in North America. 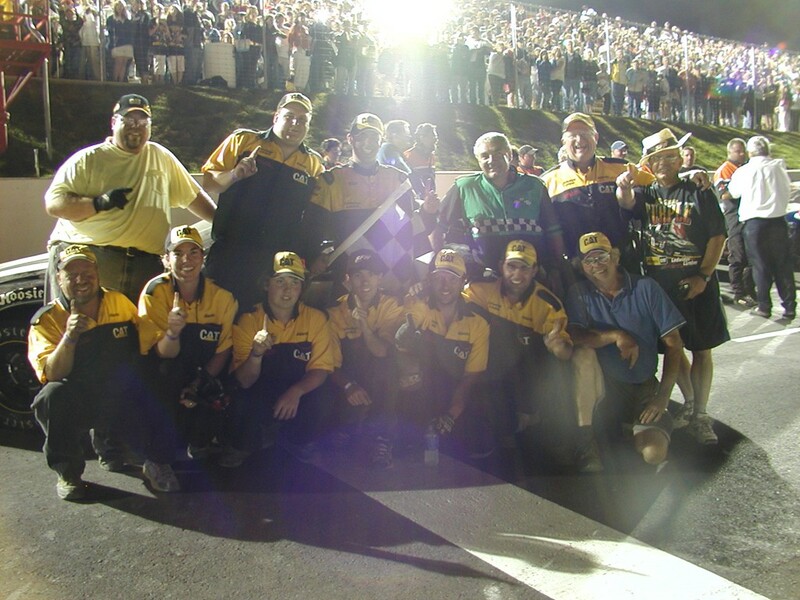 We not only mark history; we make history. 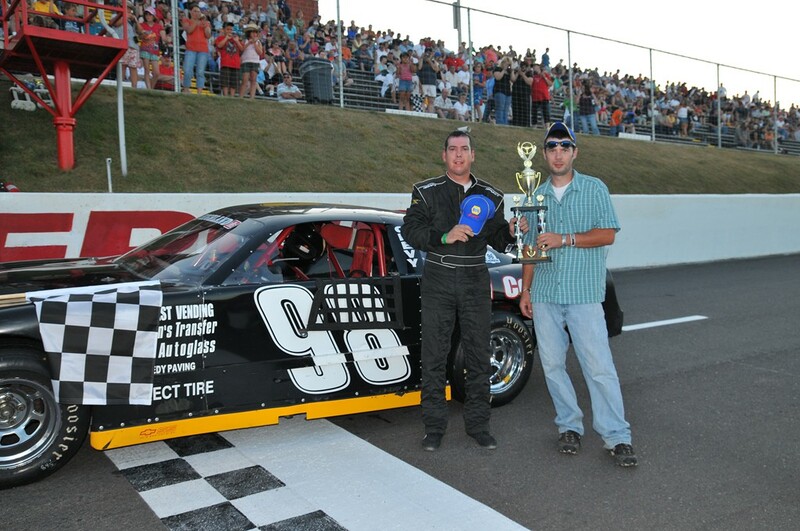 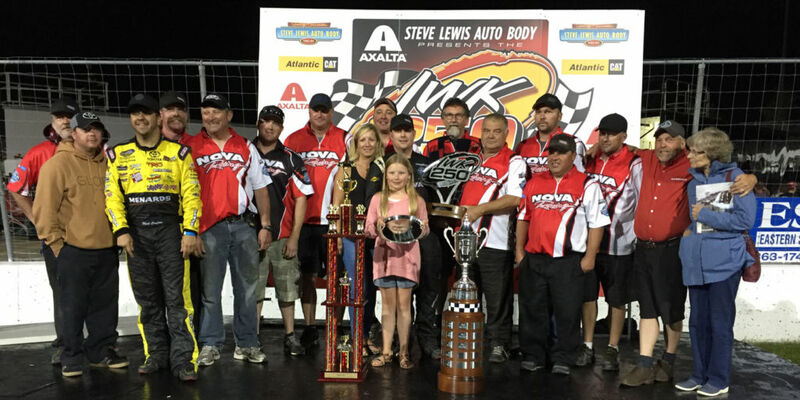 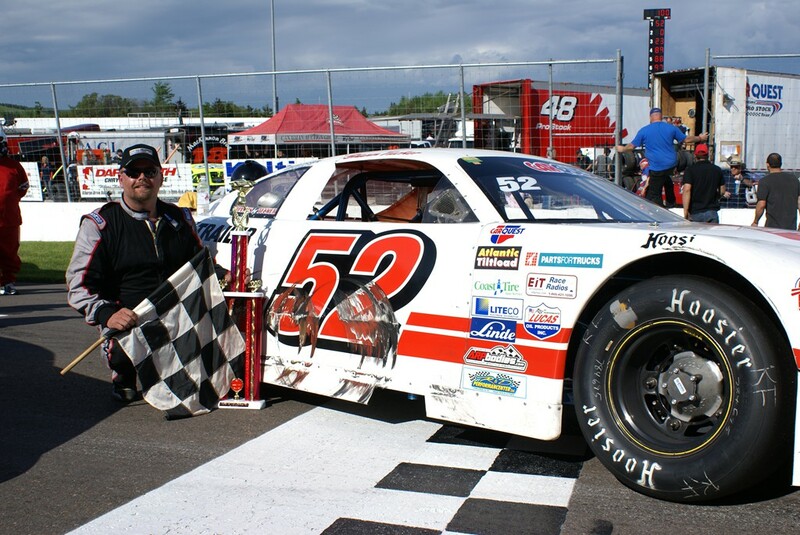 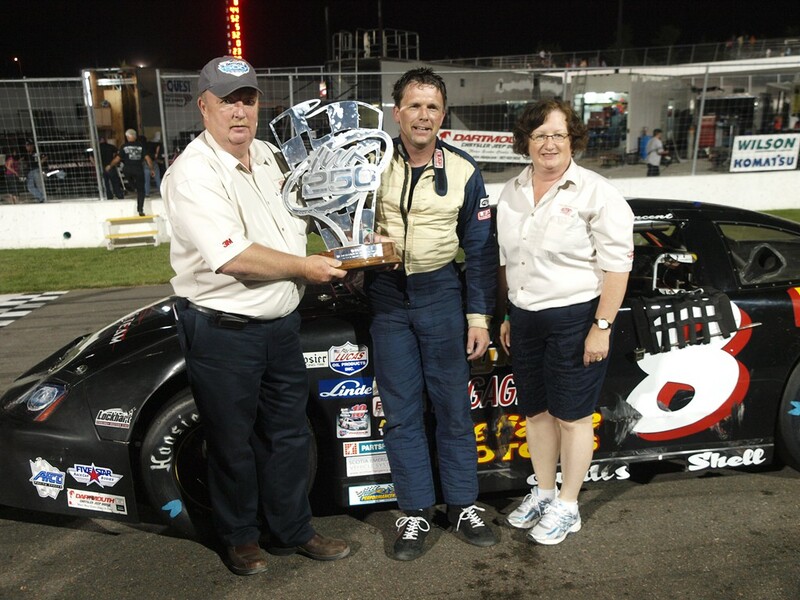 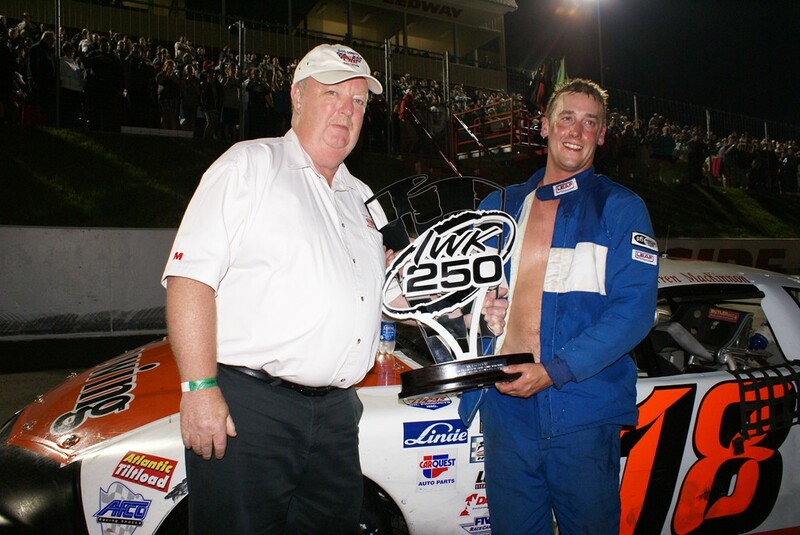 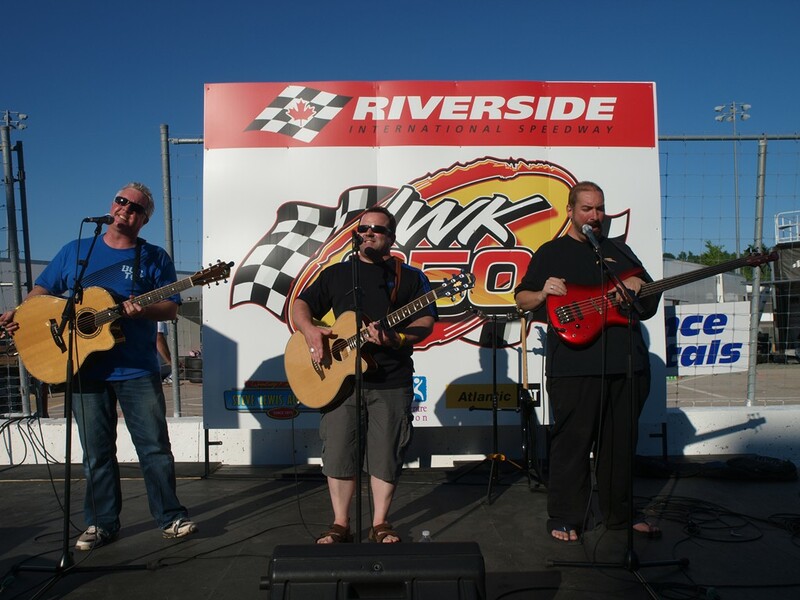 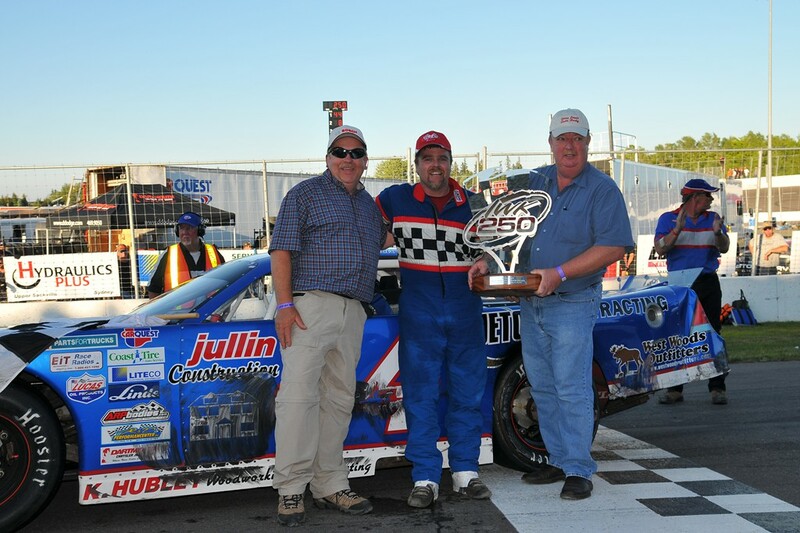 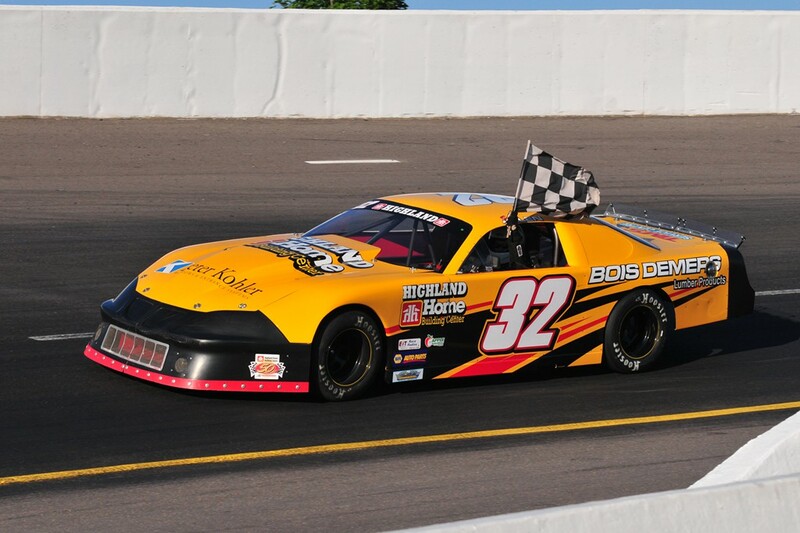 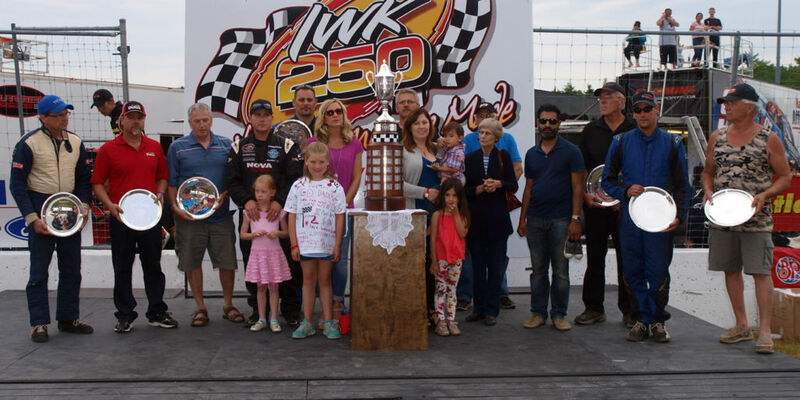 On July 18, 2015, during opening ceremonies for the IWK 250, the John W. Chisholm Memorial Cup was unveiled by members of the Chisholm family and pronounced the perpetual award for the IWK 250, the event at Riverside International Speedway that meant the most to Mr. Chisholm. 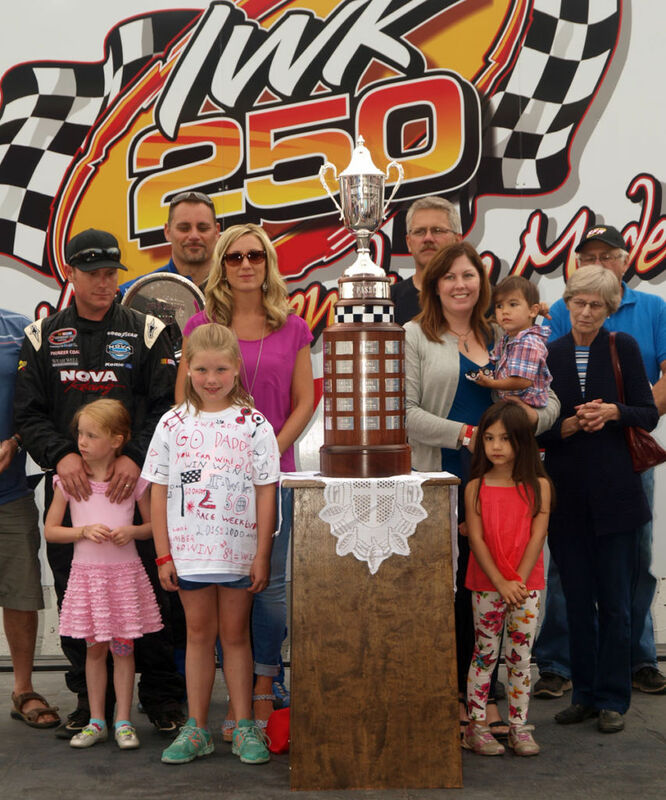 Members of the Chisholm family at the unveiling of the John W. Chisholm Memorial Cup. 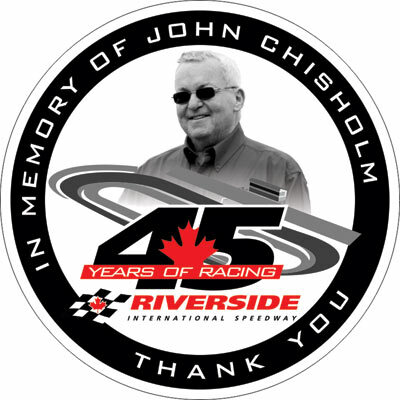 Created and named for the late John W. Chisholm (1946 to 2014), founder and builder of Riverside International Speedway, the magnificent custom-built perpetual trophy celebrates Mr. Chisholm’s accomplishments as a racer in raising the level of competition and as a promoter in attracting top drivers and series to the facility. 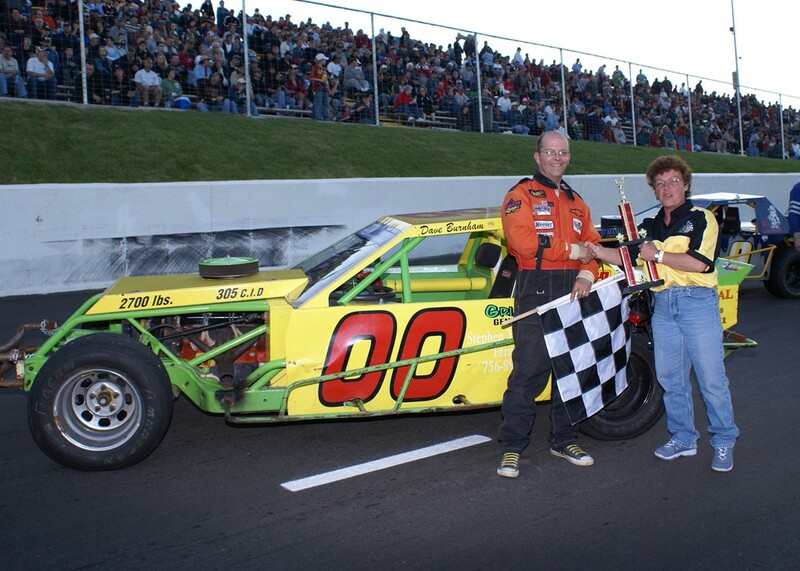 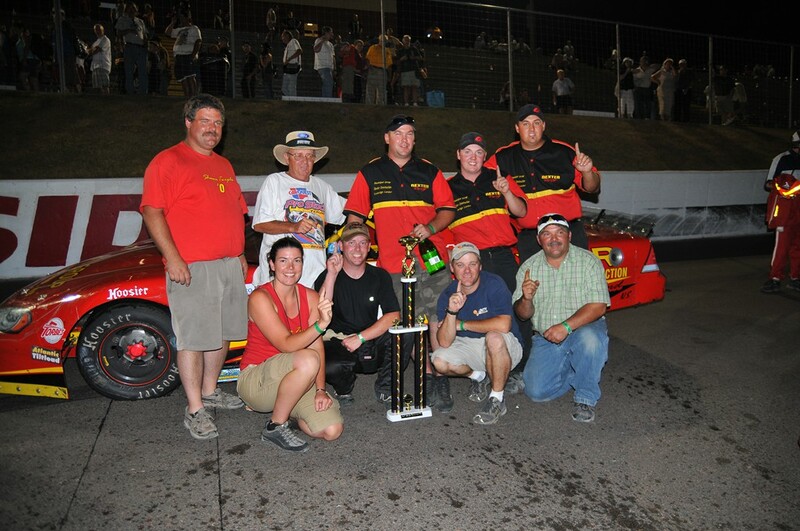 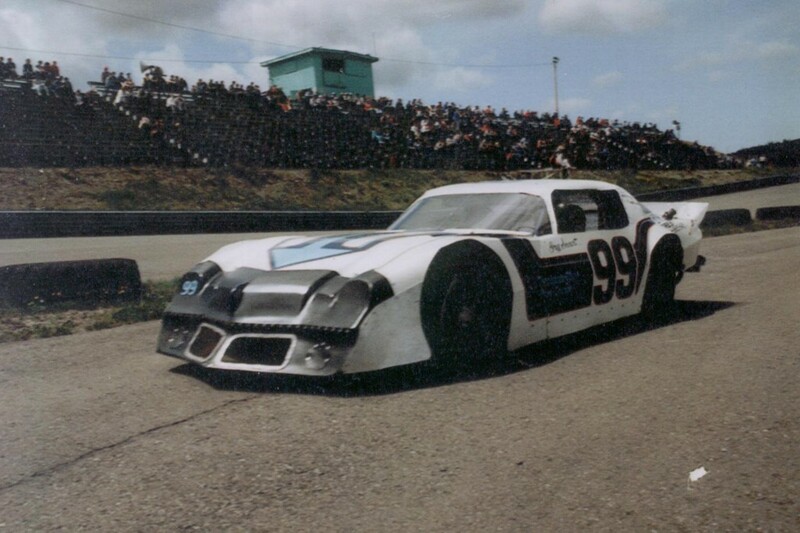 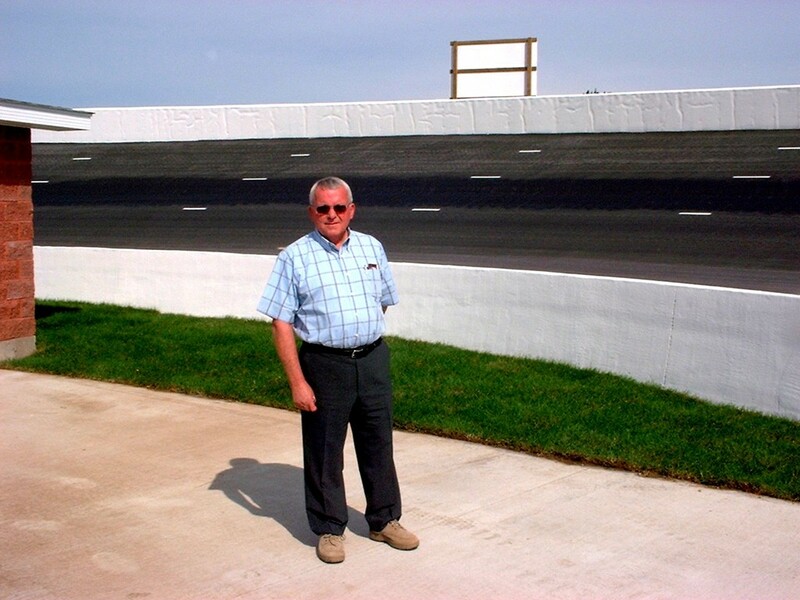 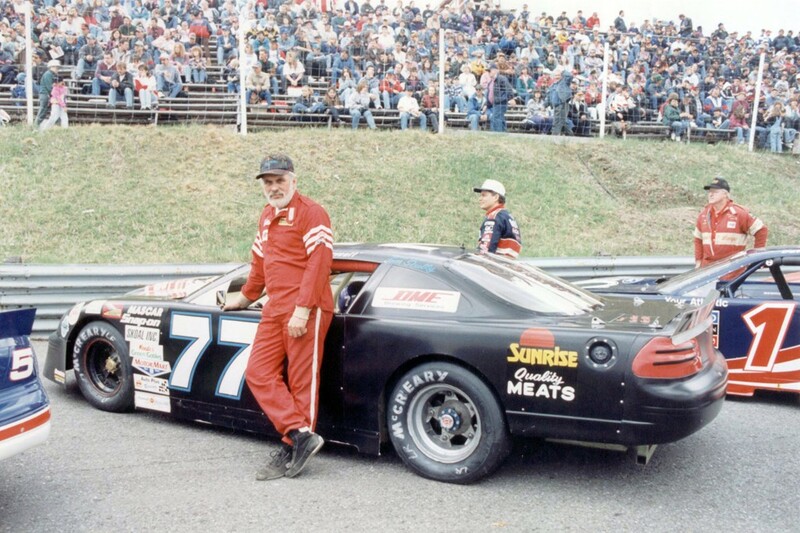 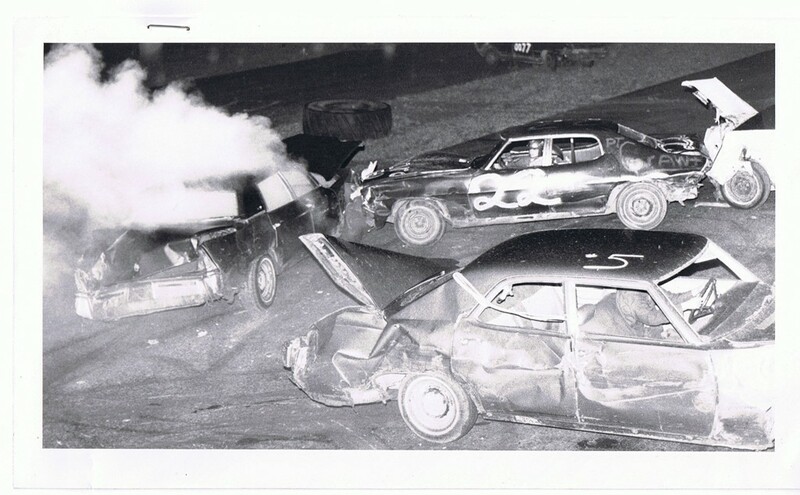 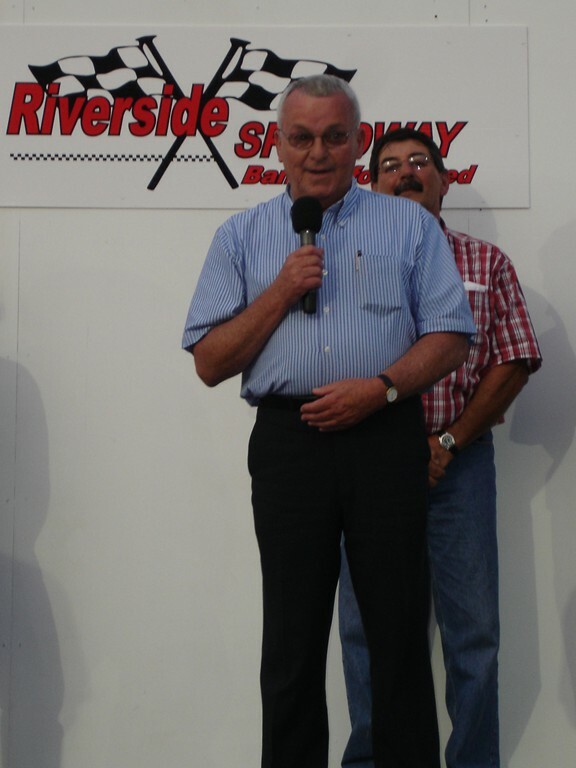 The new award was made in the same precise fashion with which Mr. Chisholm built Riverside International Speedway, first in 1969 and then rebuilt in 2006. 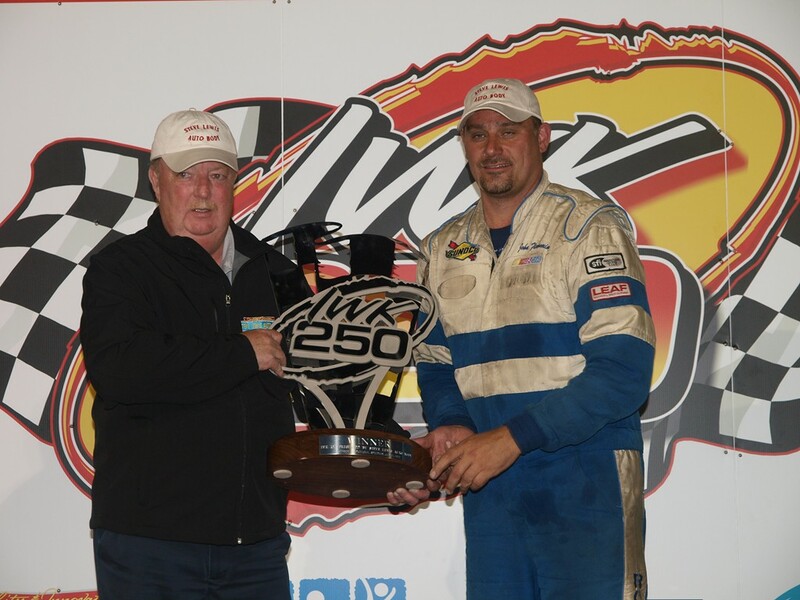 A handmade silver cup adorns the John W. Chisholm Memorial Cup emblem and sits atop a plinth foundation encircled with words that symbolize excellence. 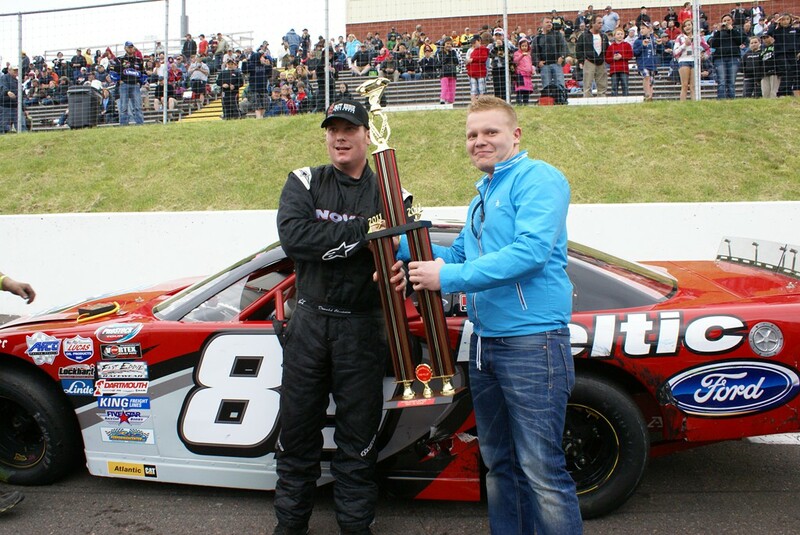 The cup and plinth mounted on a large specially commissioned wood pedestal representative of and representing, champions. 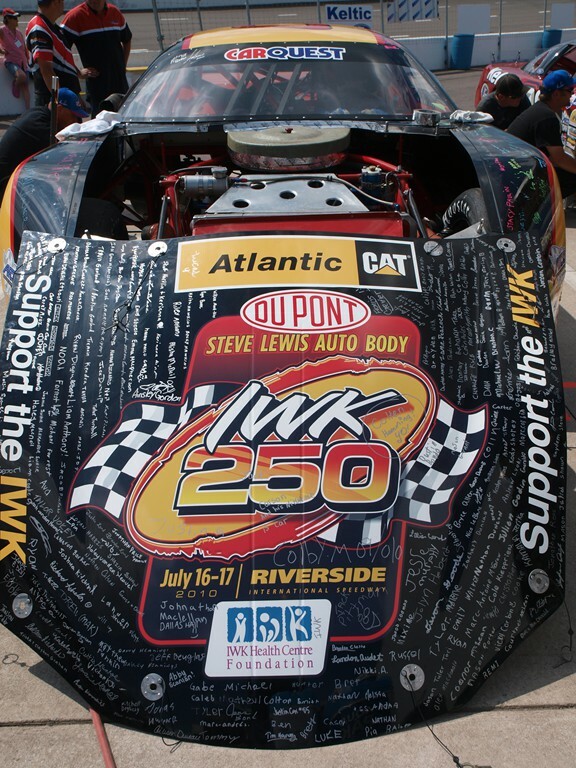 The base is decorated with silver plates engraved to recognize former winners of the historical ‘250’, known as the Riverside 250 from 1977 to 2006, and since 2007 as the IWK 250. 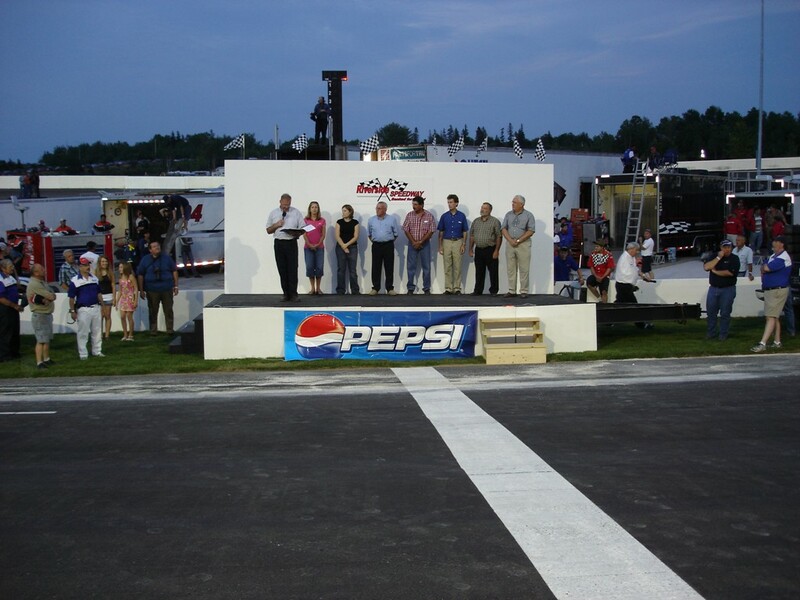 Several blank silver plates are in place awaiting the names of future winners, making a win in this event an even more prestigious accomplishment. 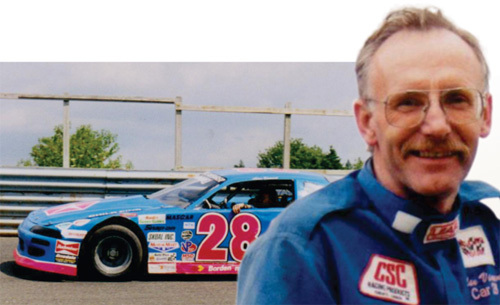 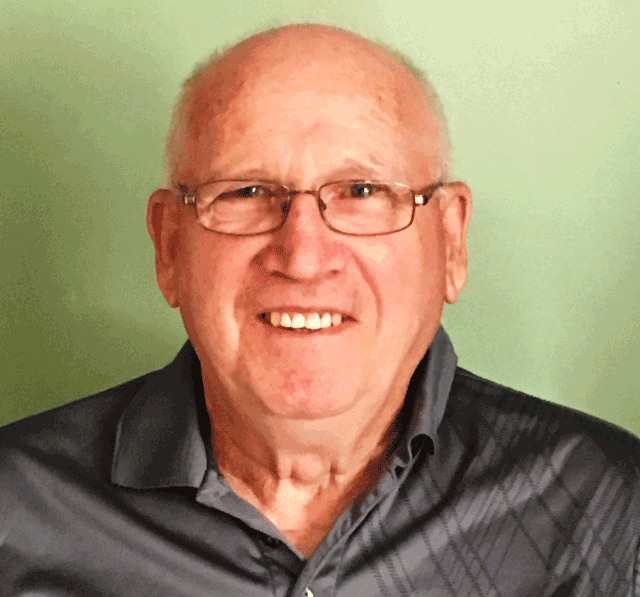 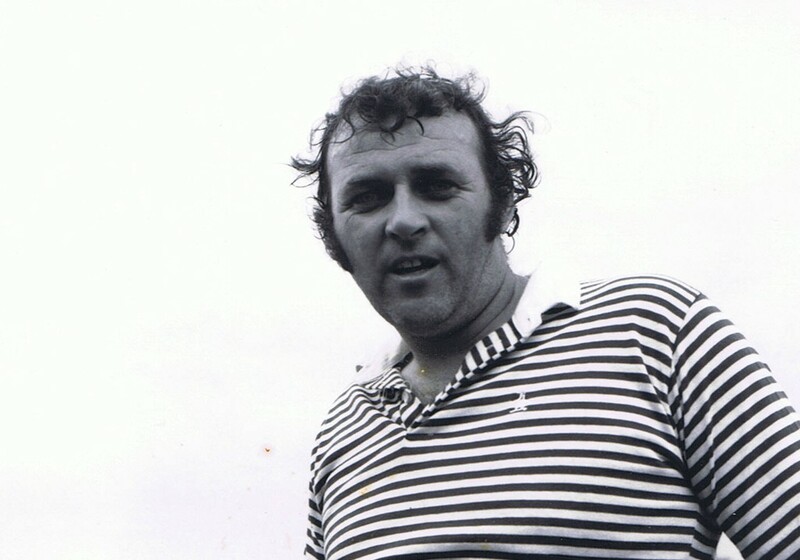 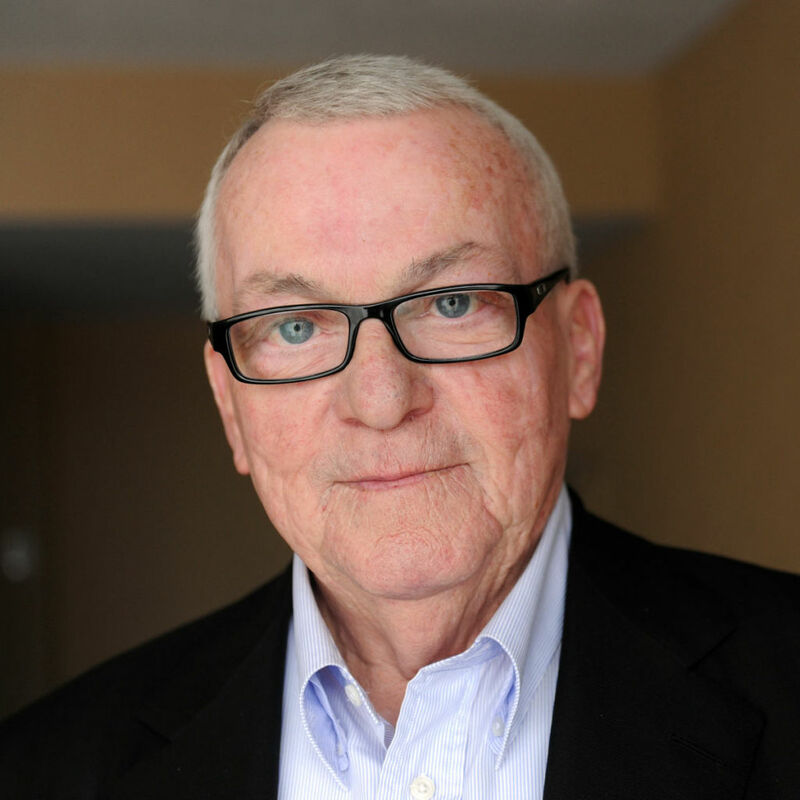 The John W. Chisholm Memorial Cup presentation will be made by a person from, or chosen by, the Chisholm family and the winner will also receive a John W. Chisholm Memorial Cup recognition award. 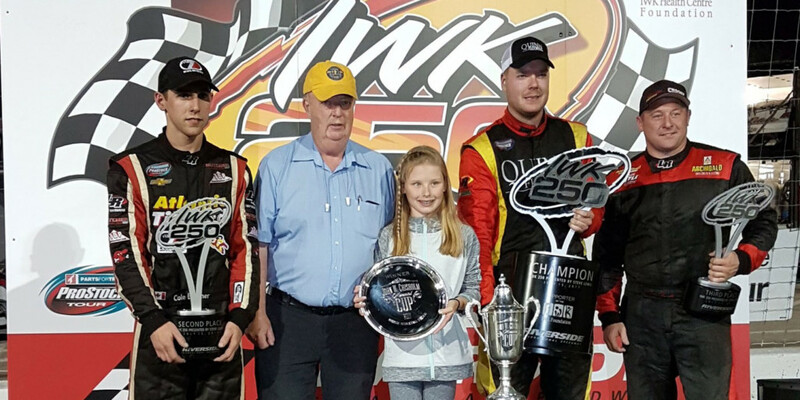 A number of former 250 winners were on hand for the unveiling of the John W. Chisholm Memorial Cup, including Terry Clattenburg, John Flemming, Frank Fraser, Rollie MacDonald, Mike MacKenzie, Darren MacKinnon, Greg Sewart, Wayne Smith, and Kent Vincent. 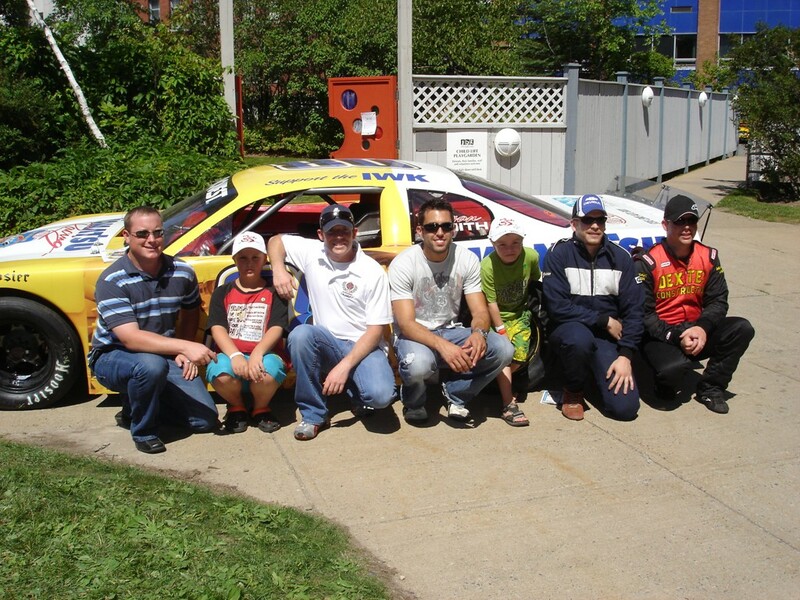 IWK 250 champions with members of the Chisholm family at the unveiling of the John W. Chisholm Memorial Cup. 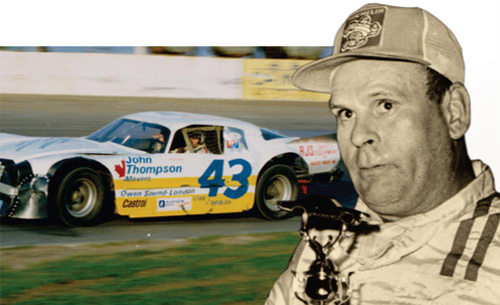 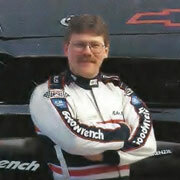 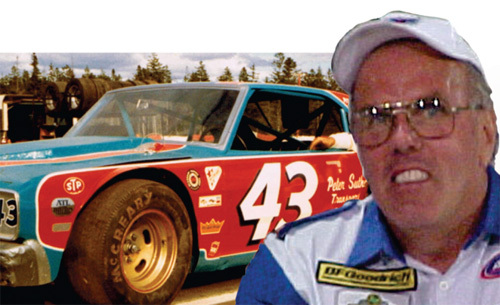 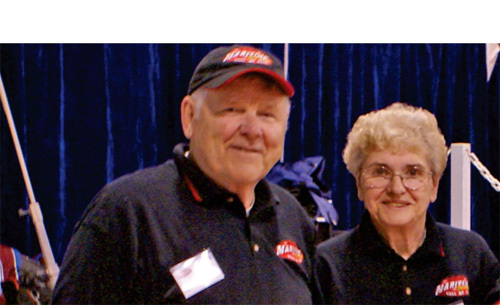 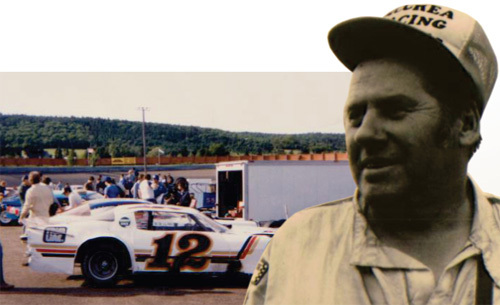 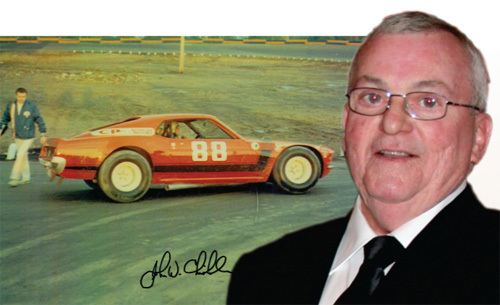 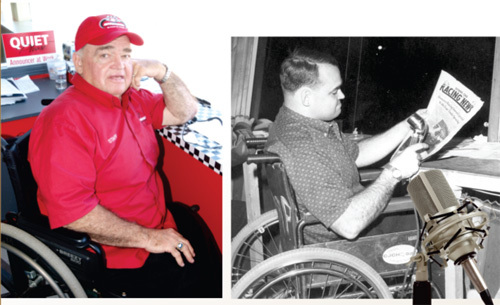 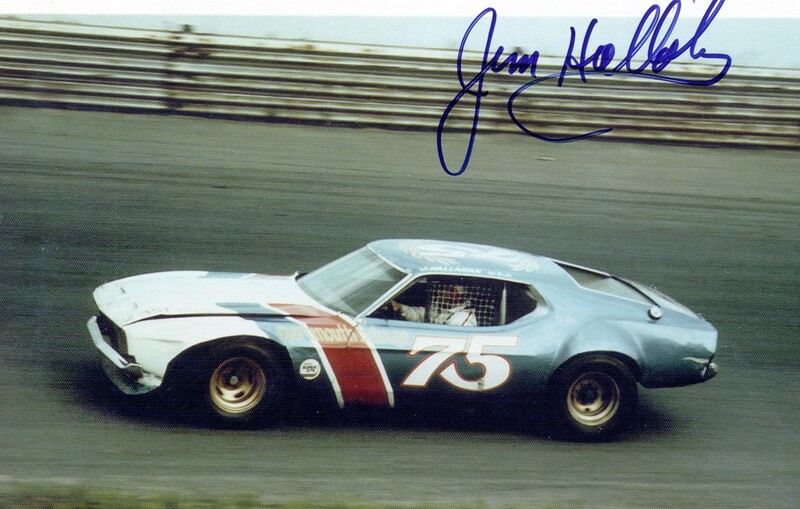 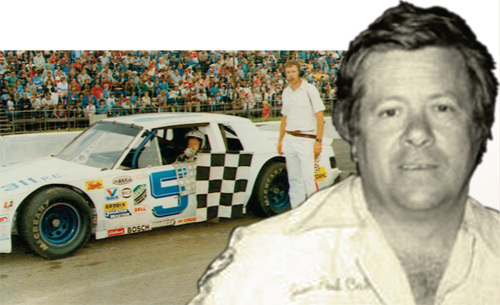 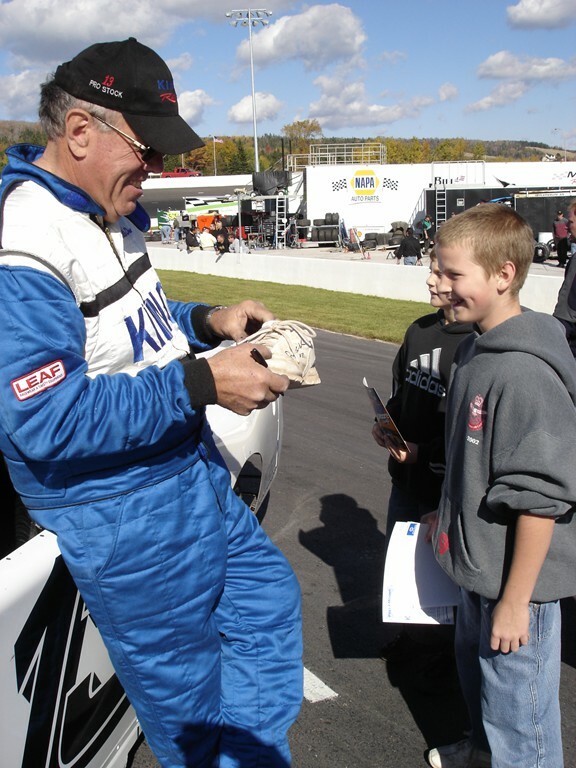 For more than four decades John W. Chisholm was among the most respected figures in Maritime motorsports. 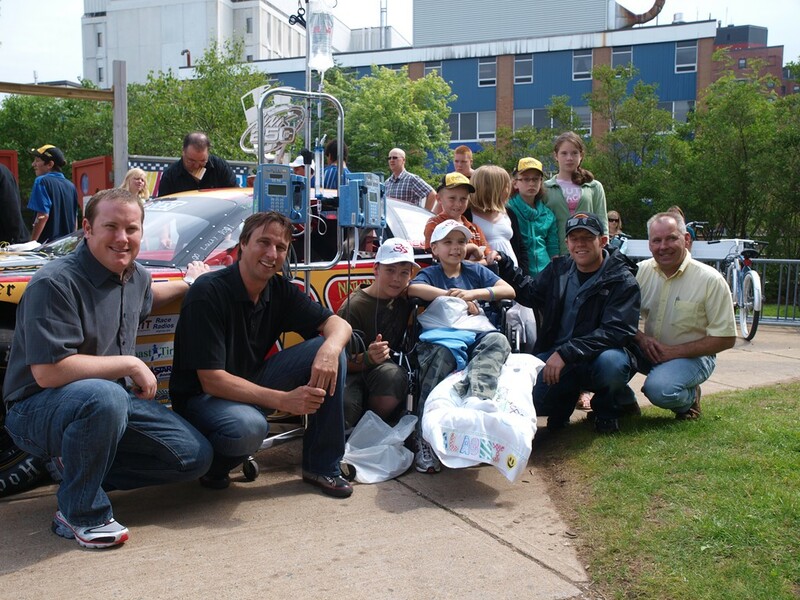 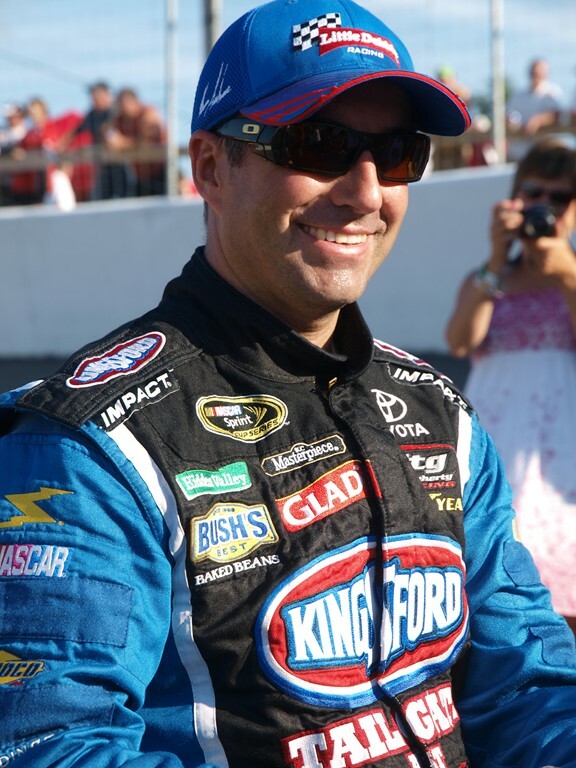 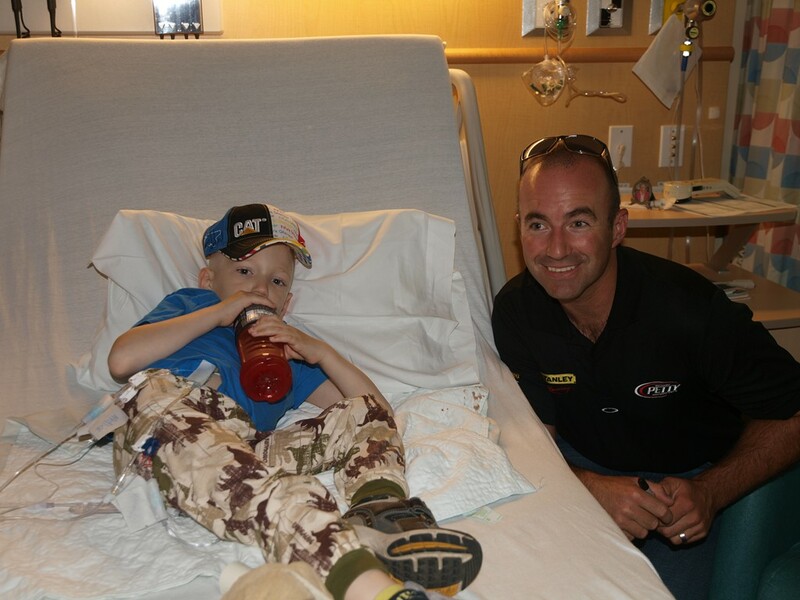 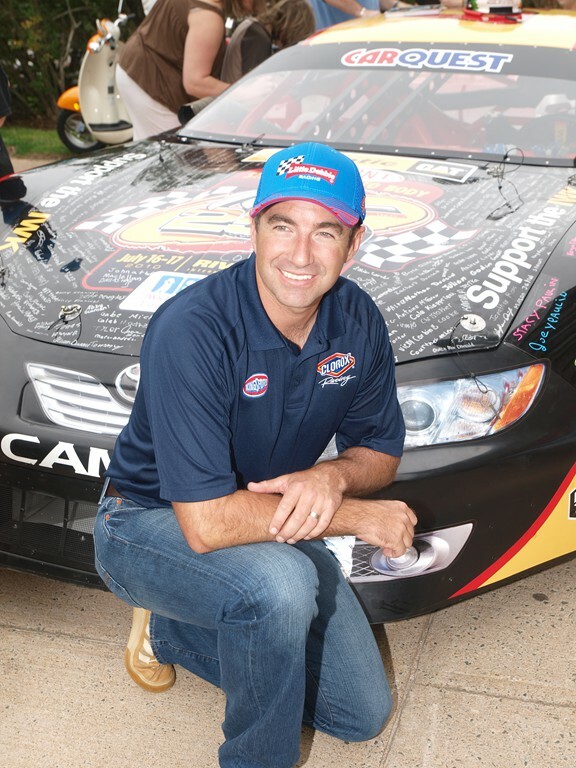 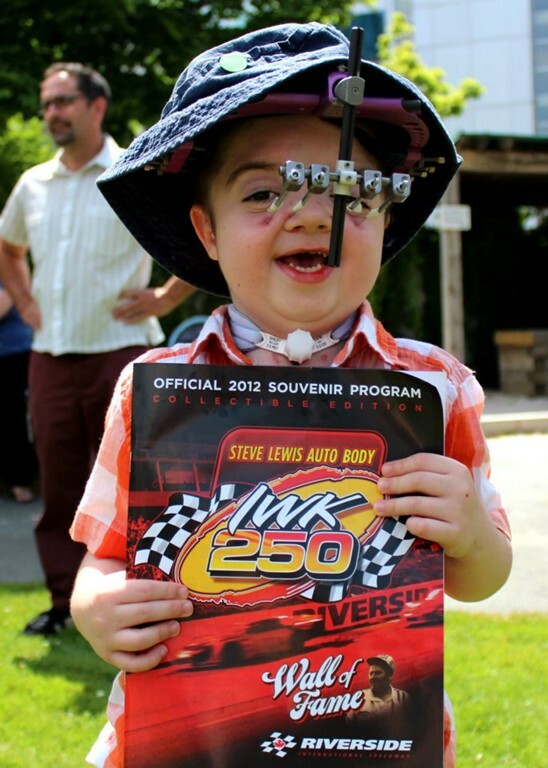 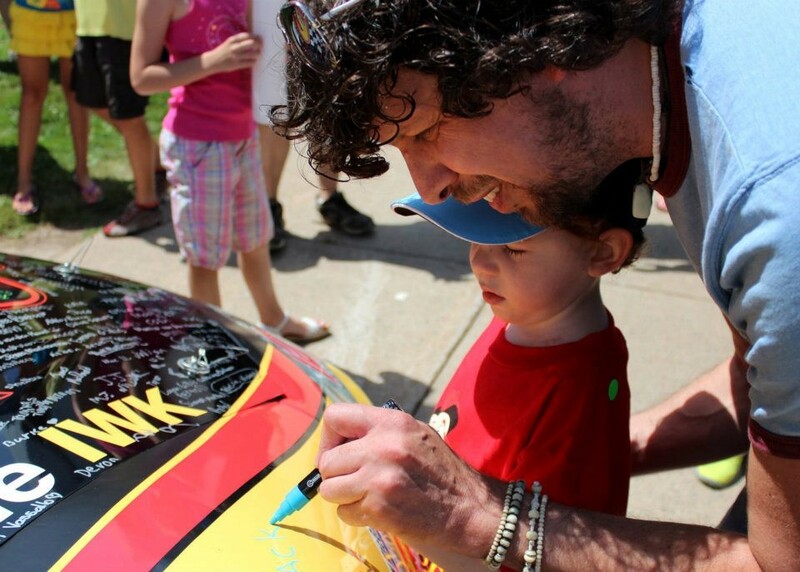 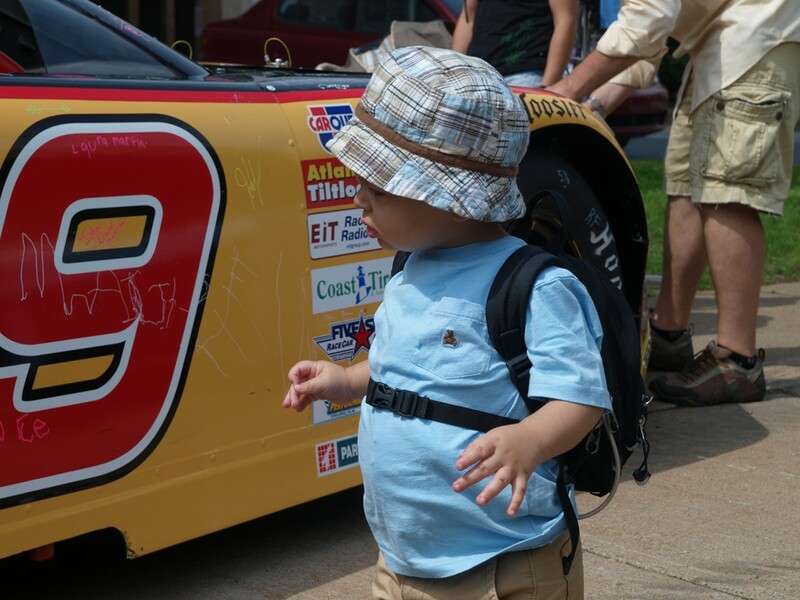 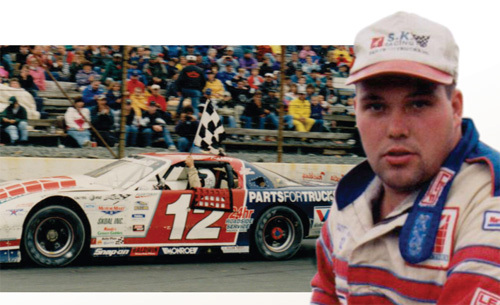 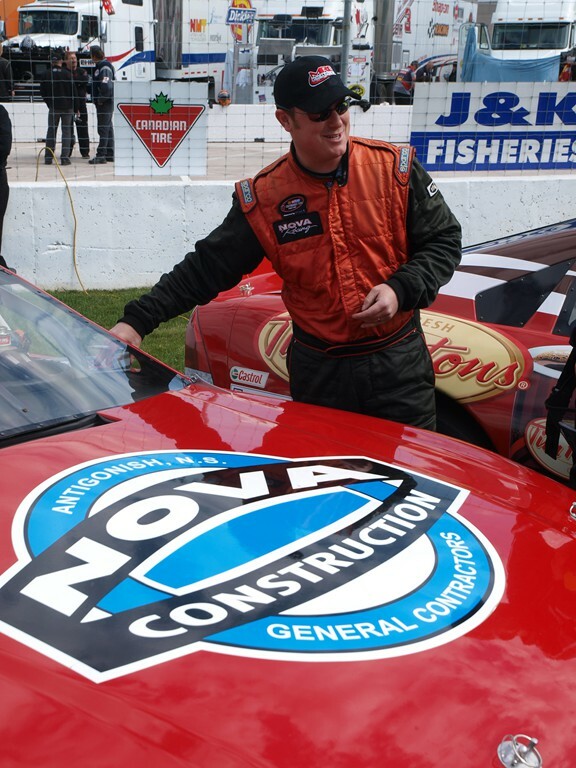 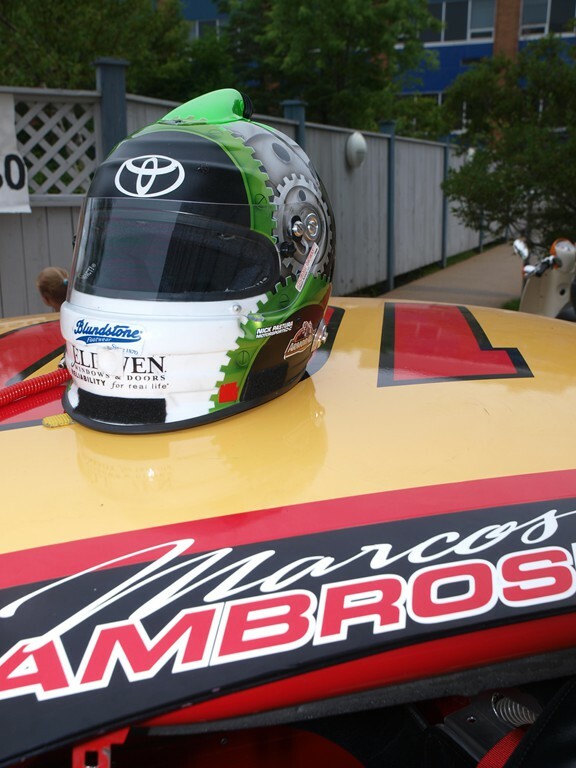 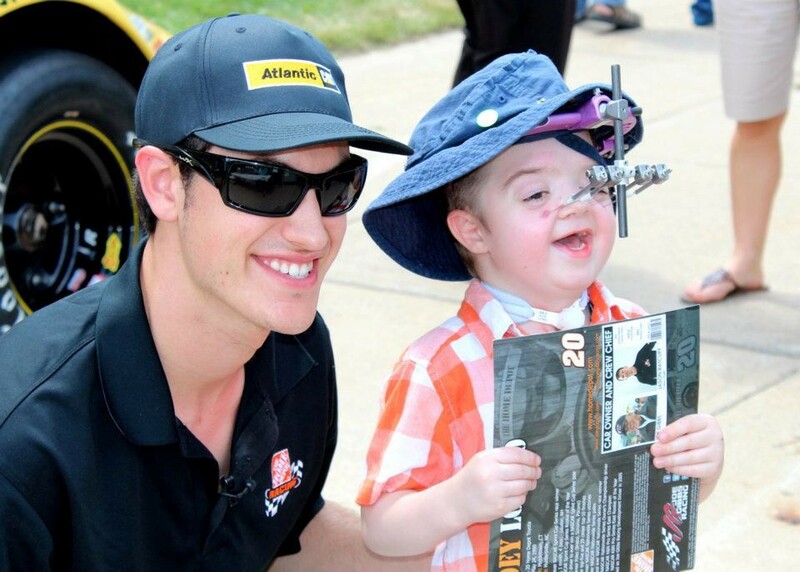 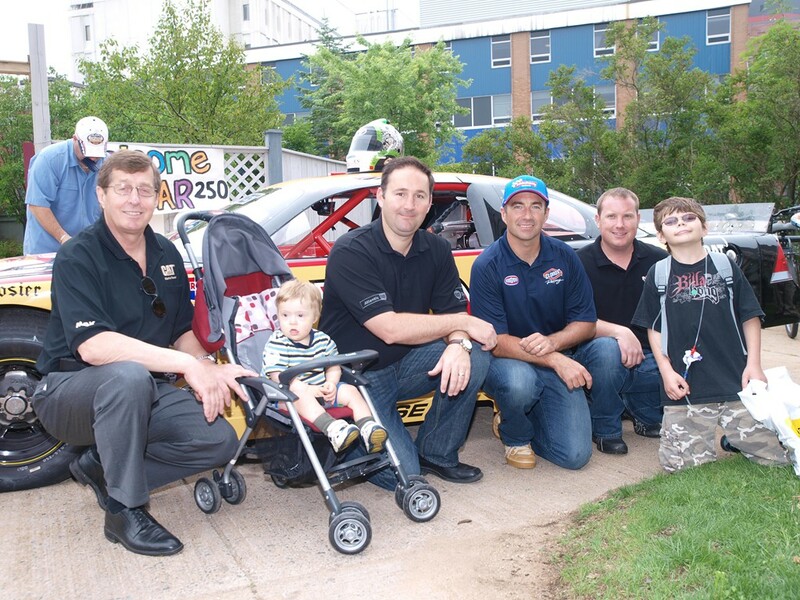 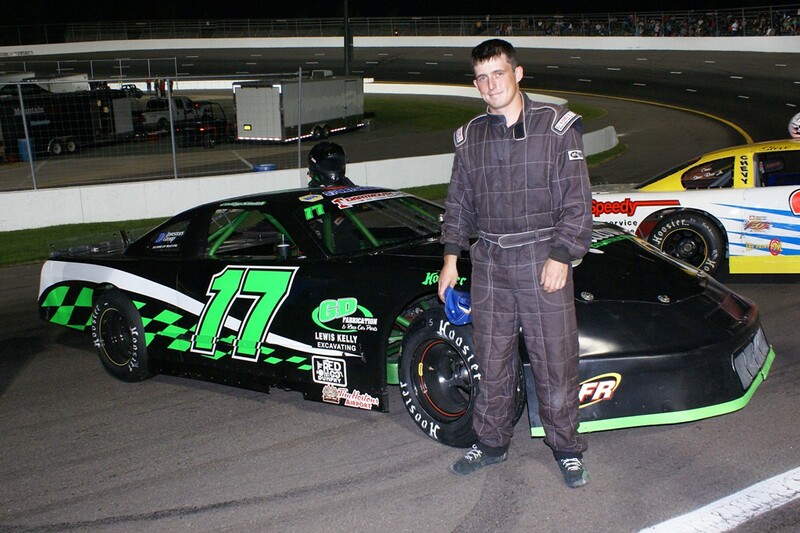 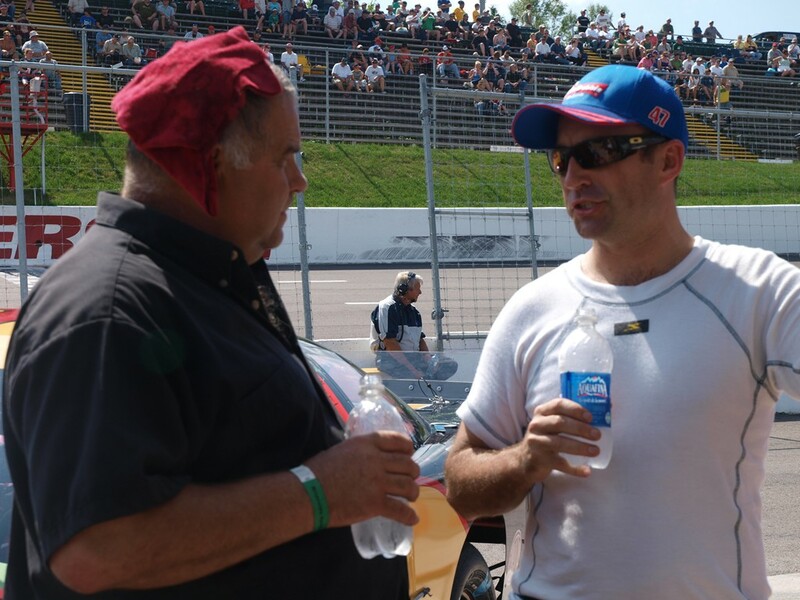 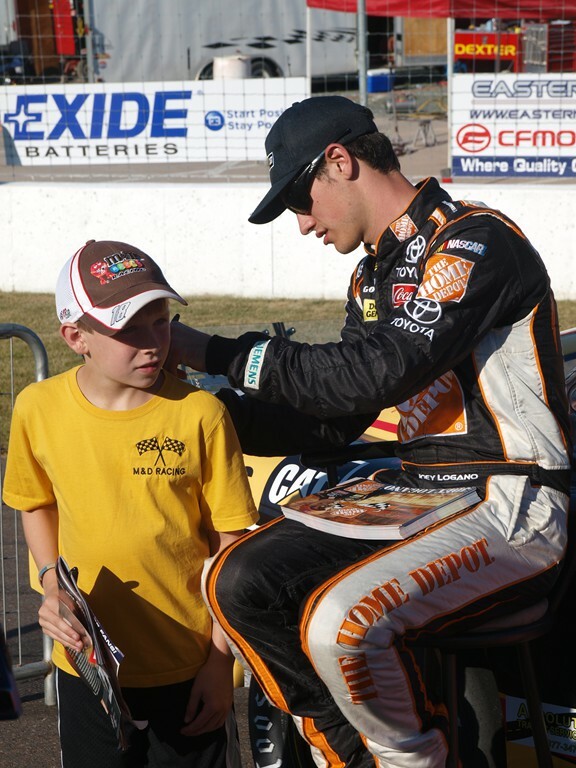 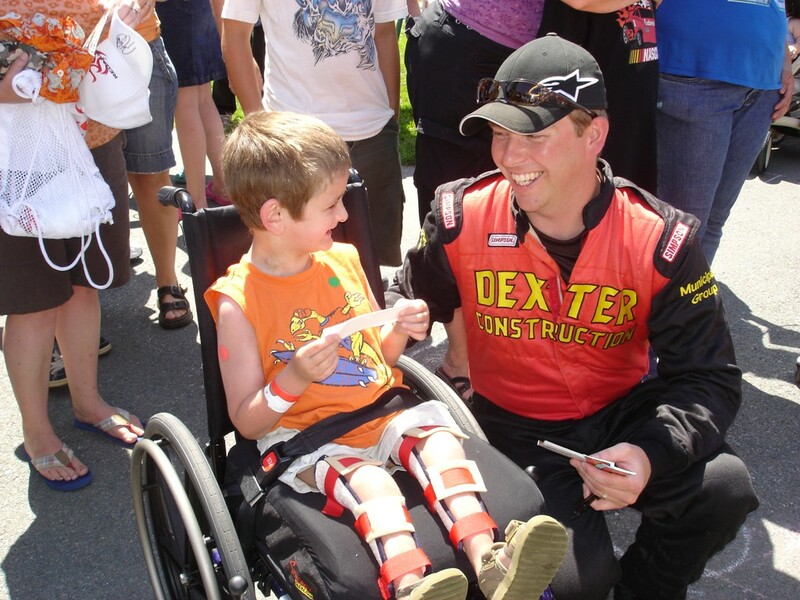 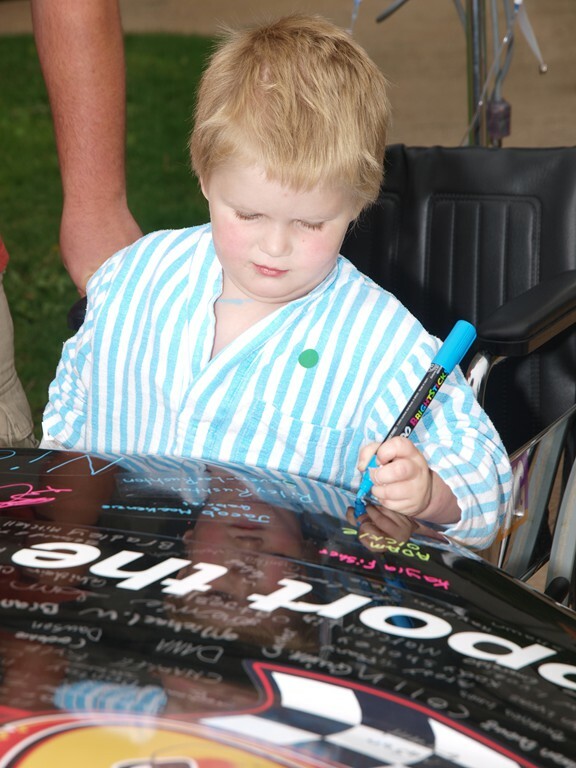 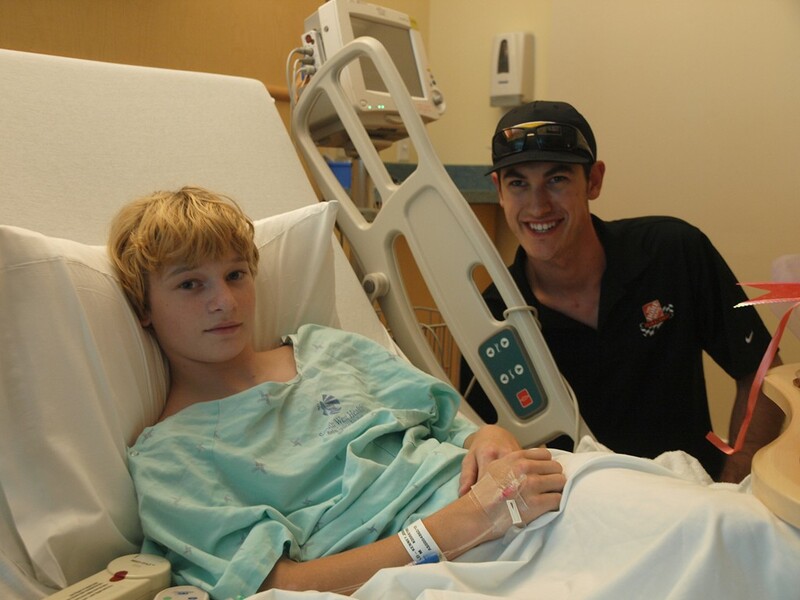 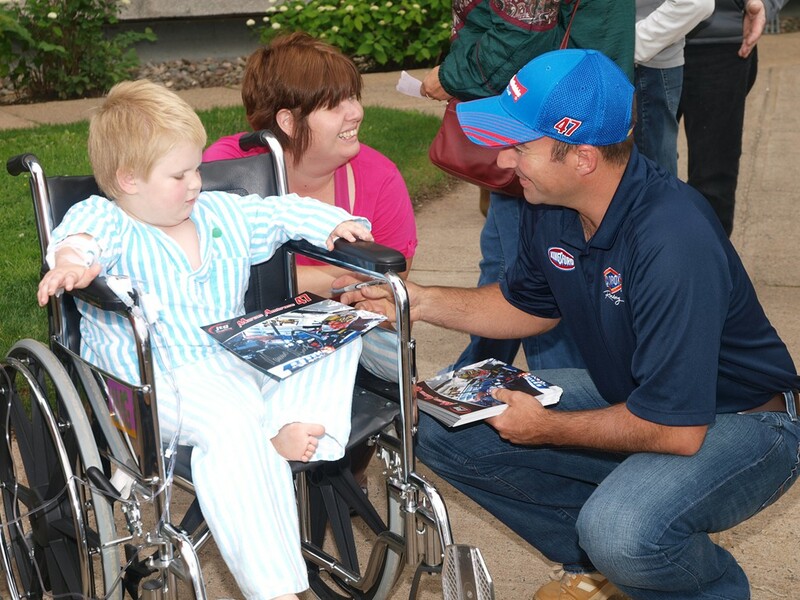 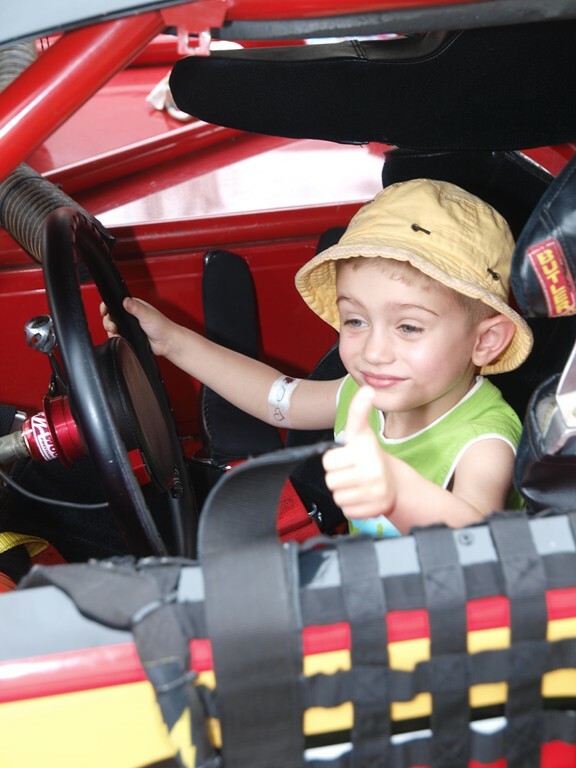 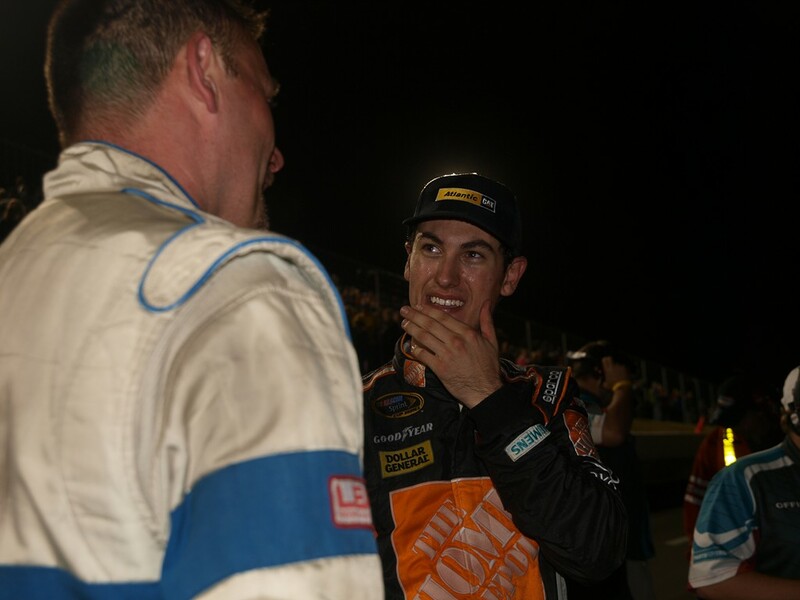 His unexpected death on July 4, 2014, came just two weeks before his favourite event, the IWK 250, which was dedicated to his memory. 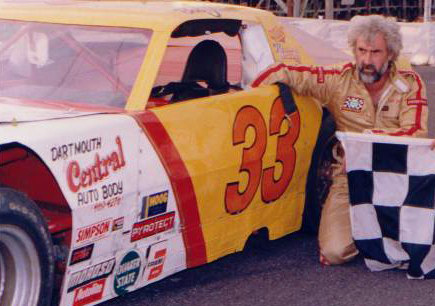 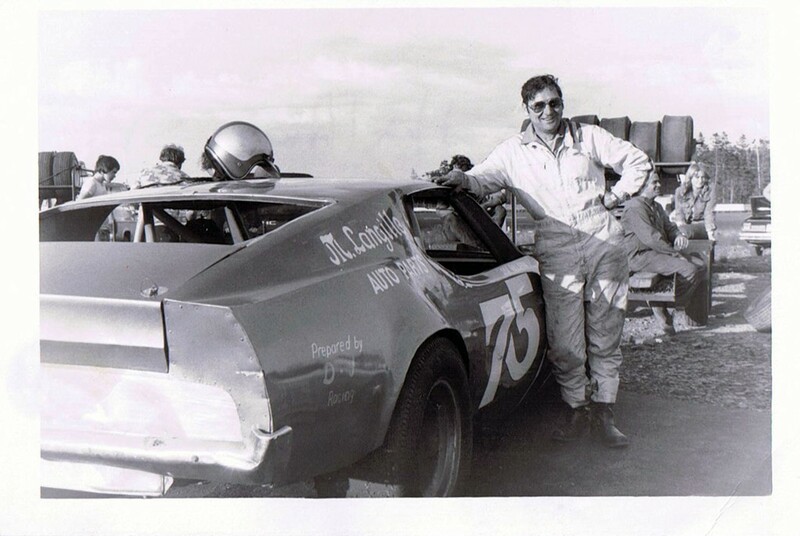 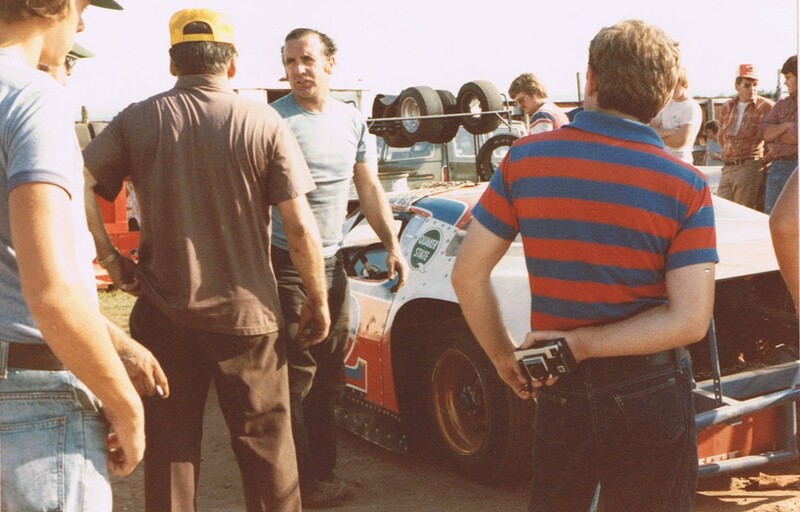 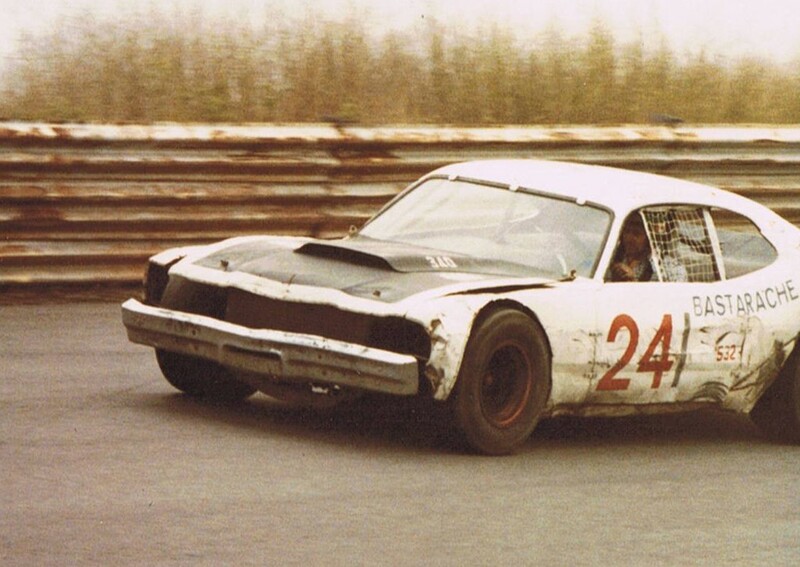 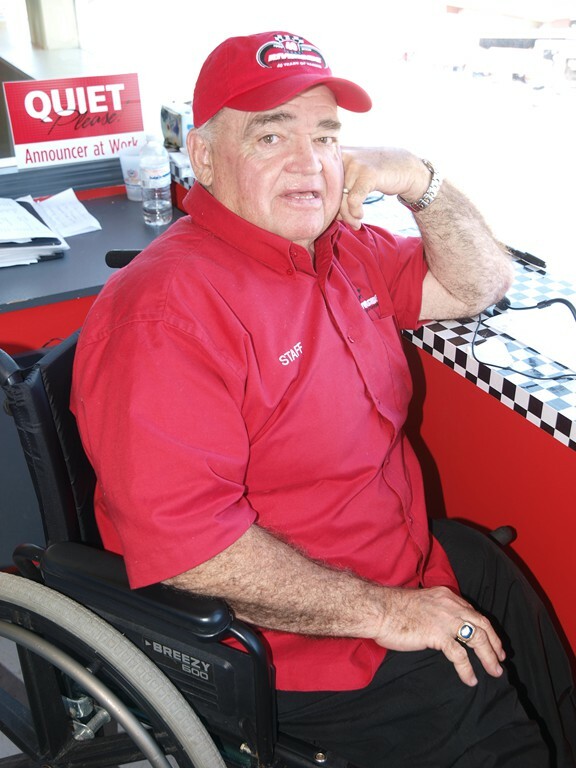 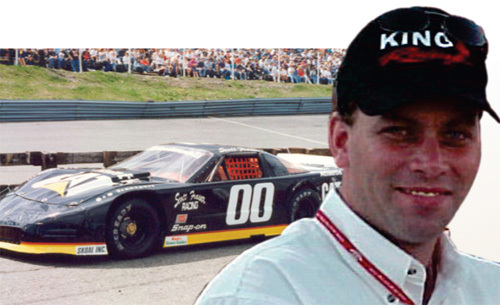 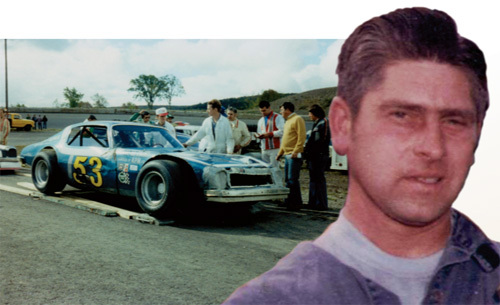 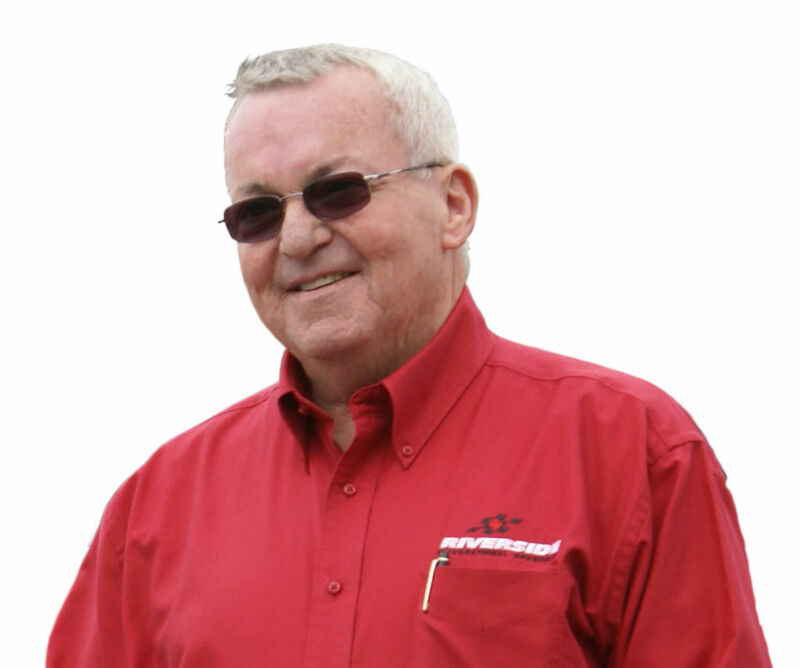 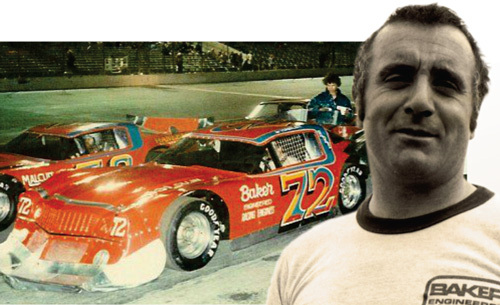 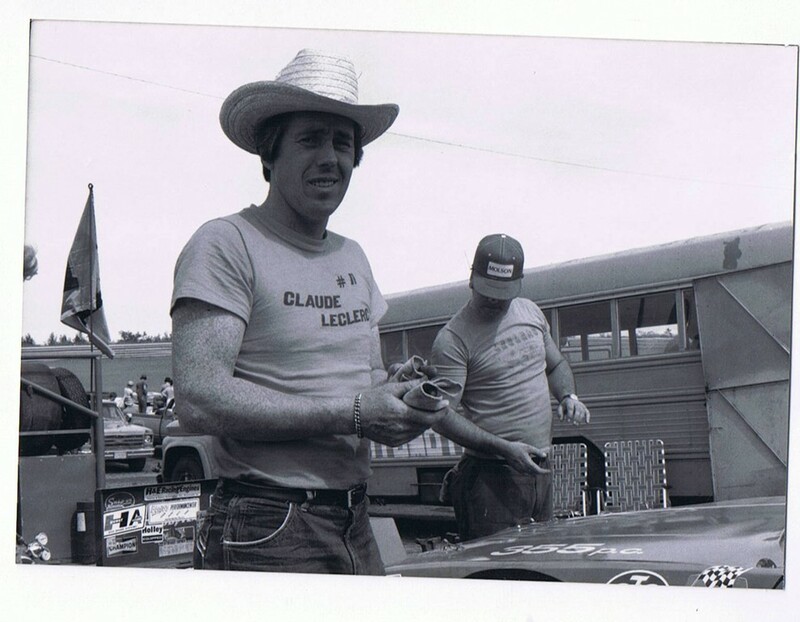 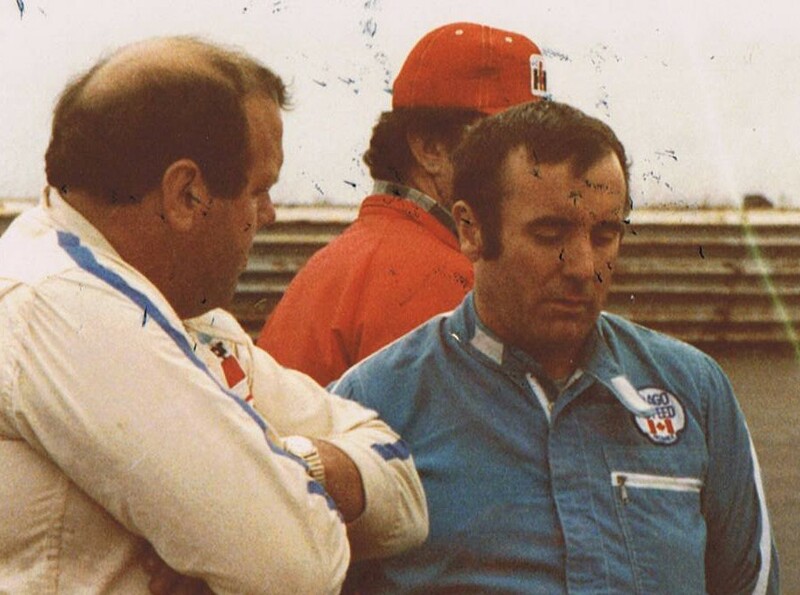 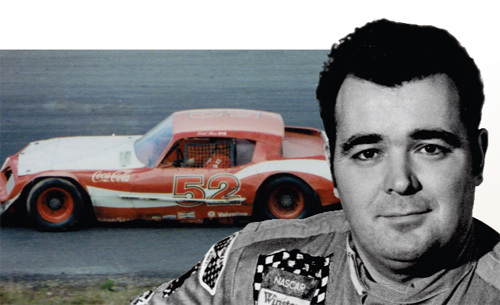 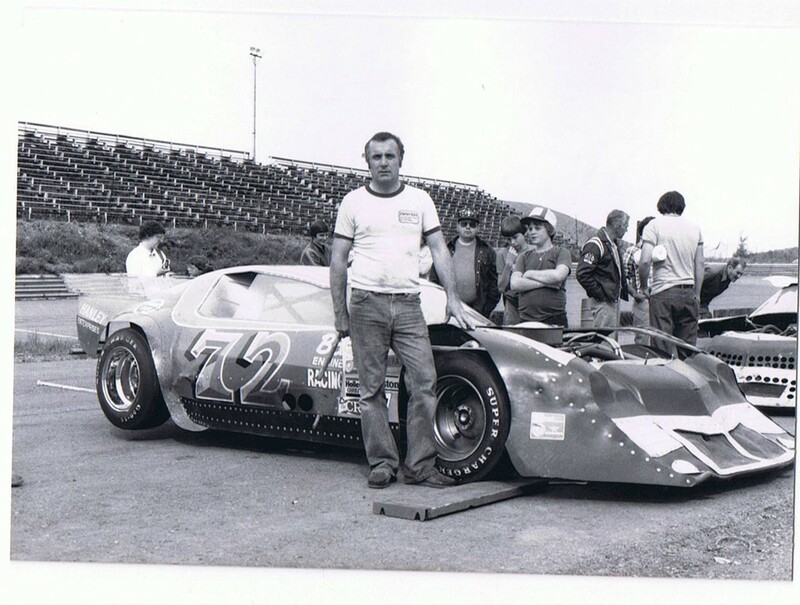 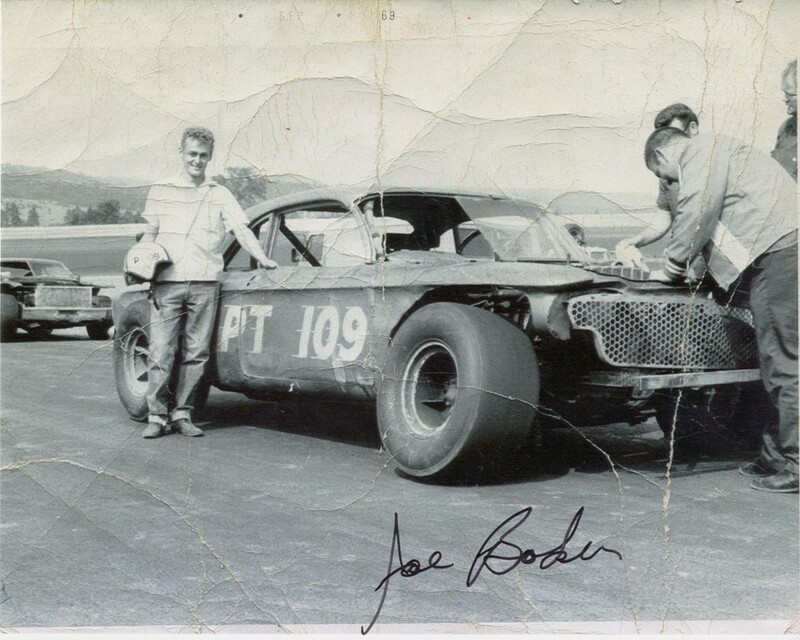 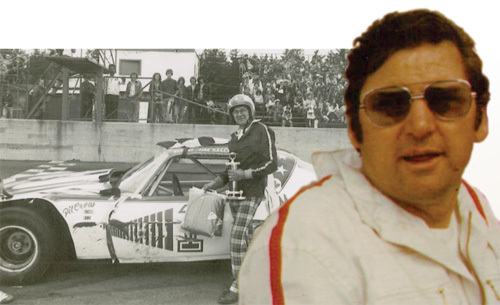 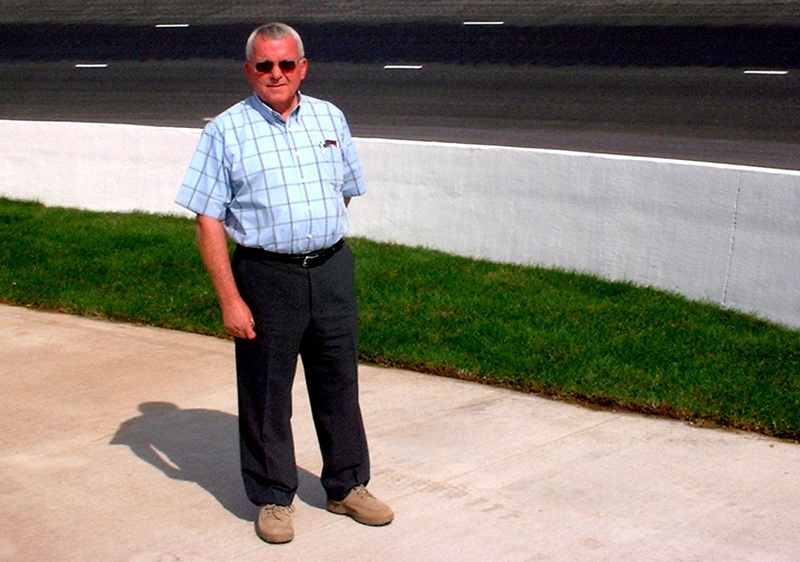 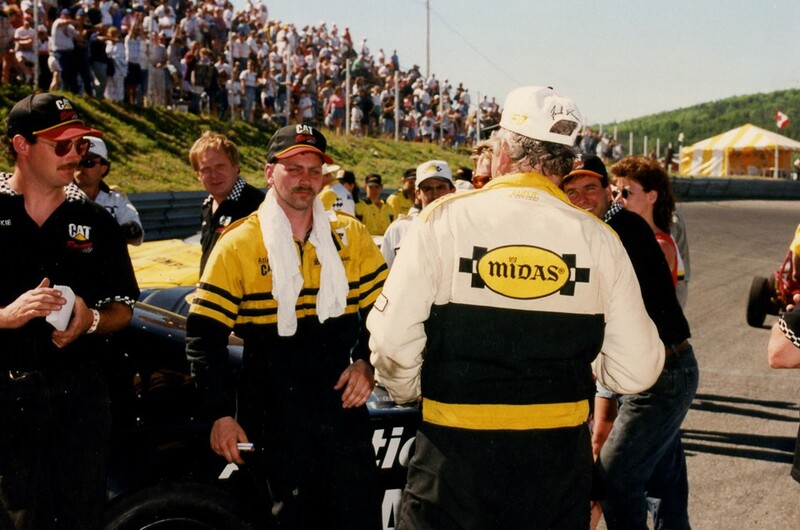 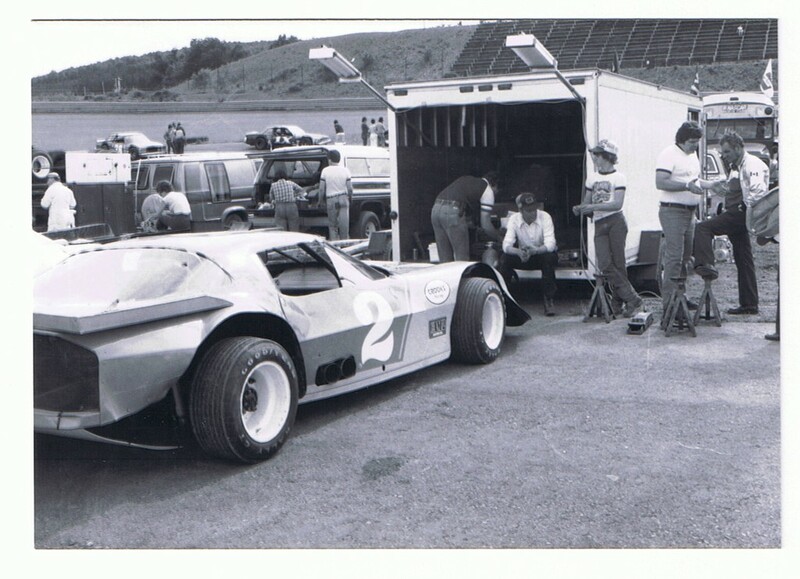 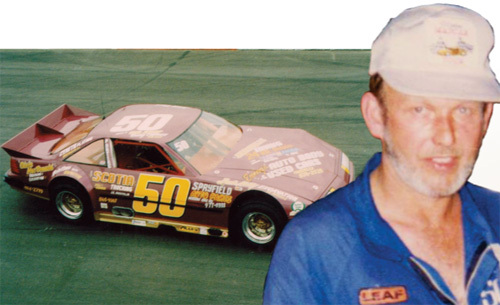 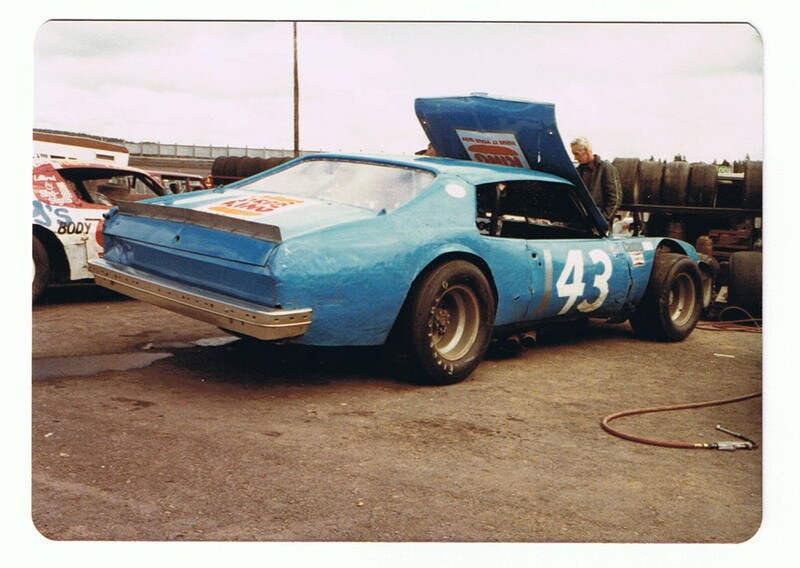 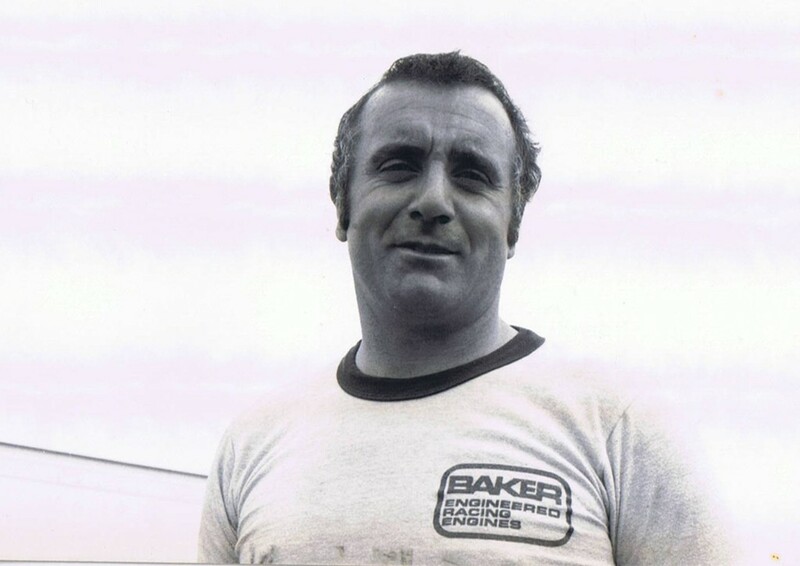 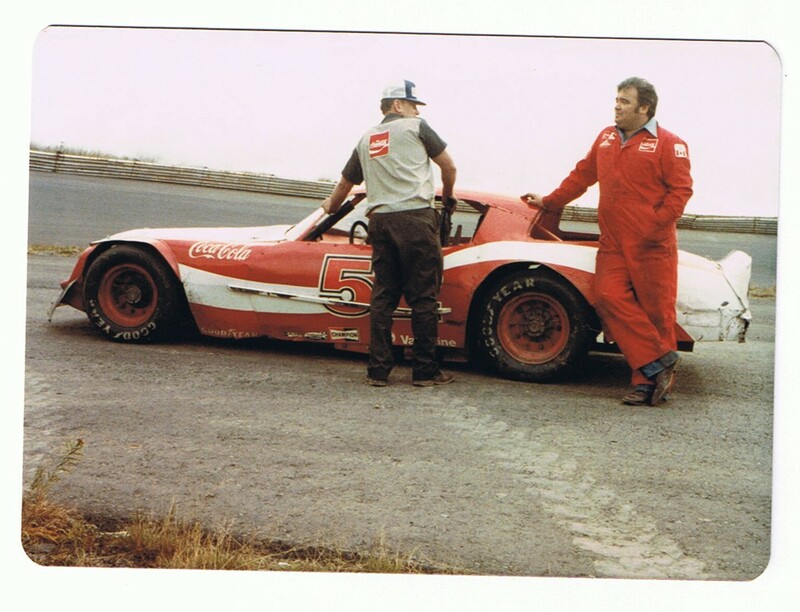 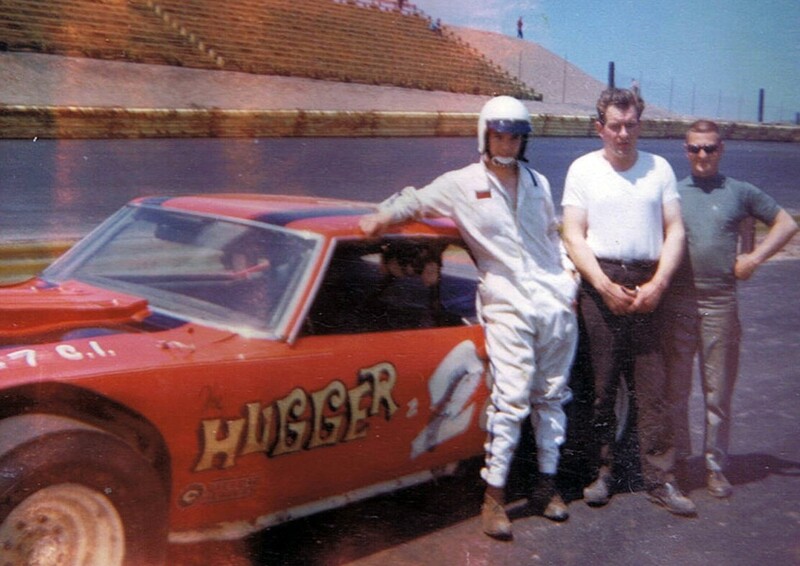 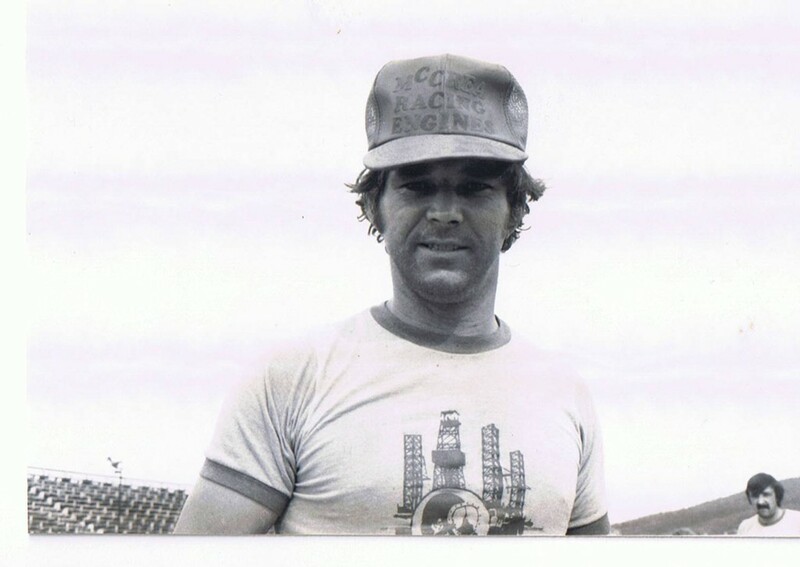 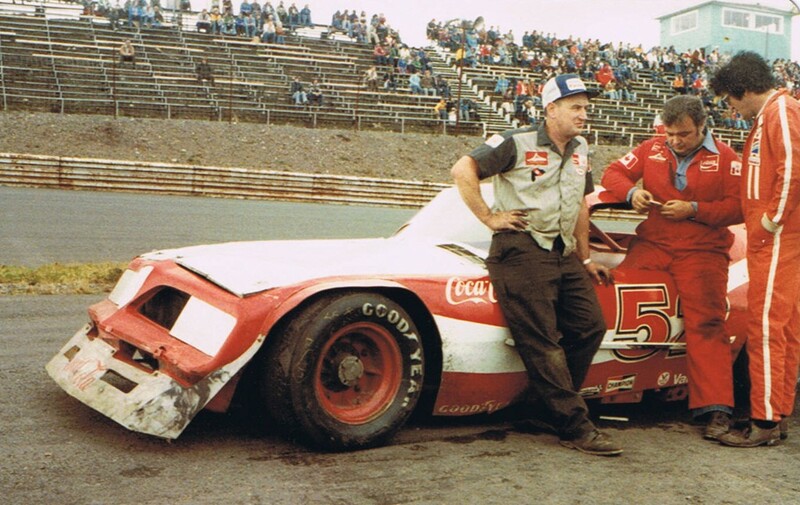 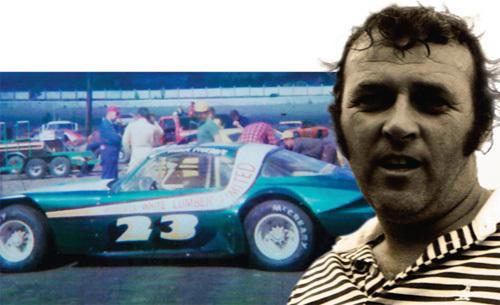 His vision to build a premier stock car racing facility, together with his constant search for bettering technology in the race cars, and introducing top series and stars to racers and race fans alike, created a forum where legends are made. 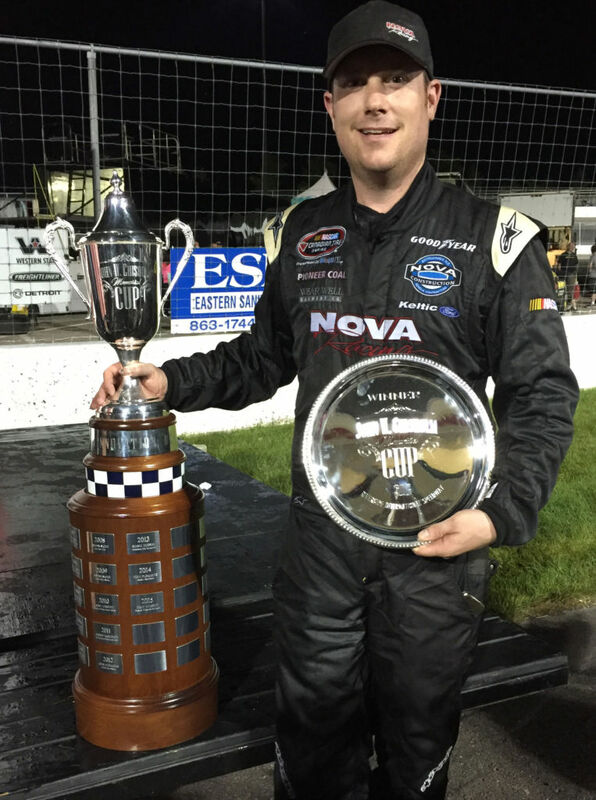 In recognition of the unveiling of the John W. Chisholm Memorial Cup, our good friends at Race Time Radio produced a goosebump-worthy introduction for our fans. 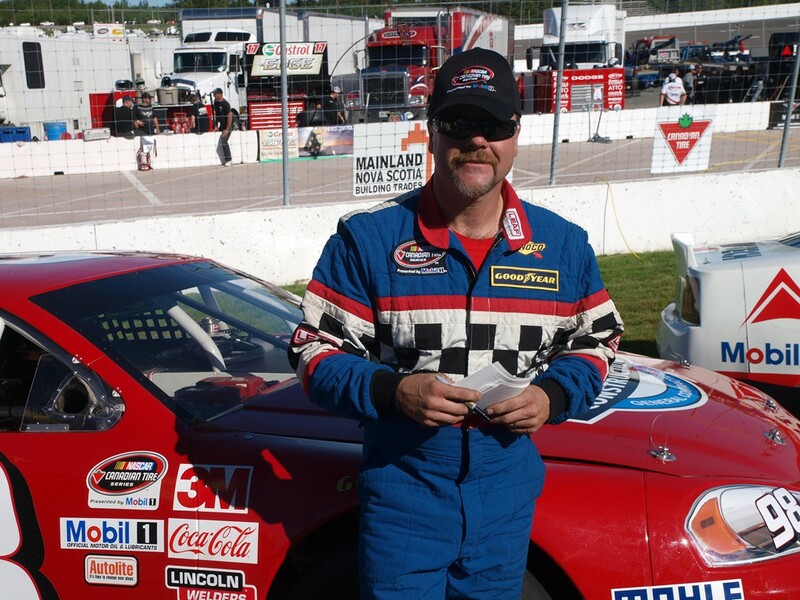 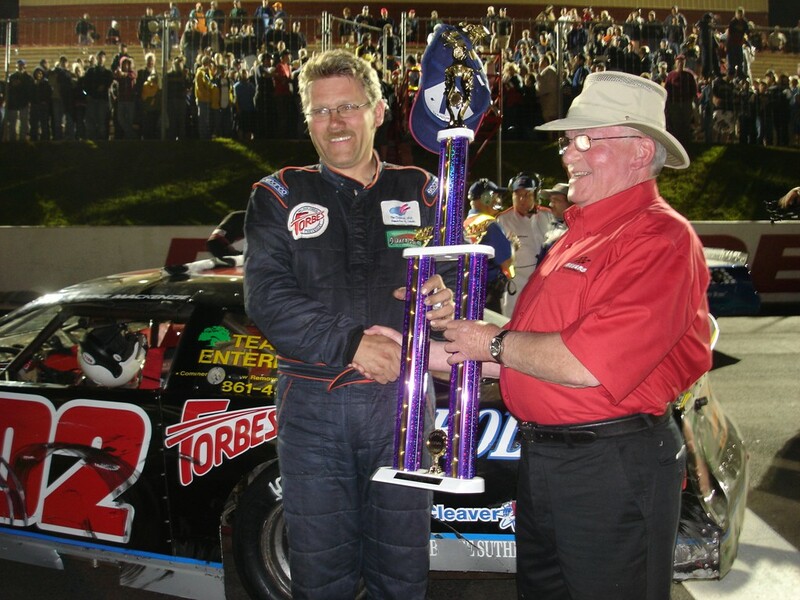 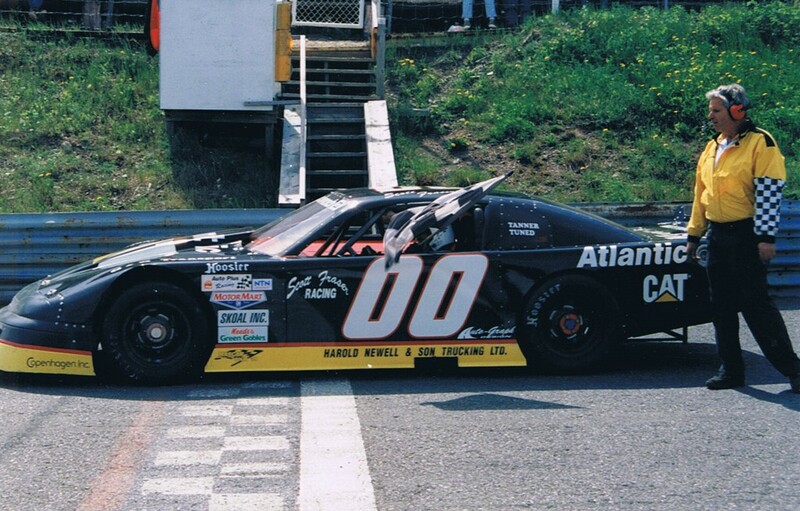 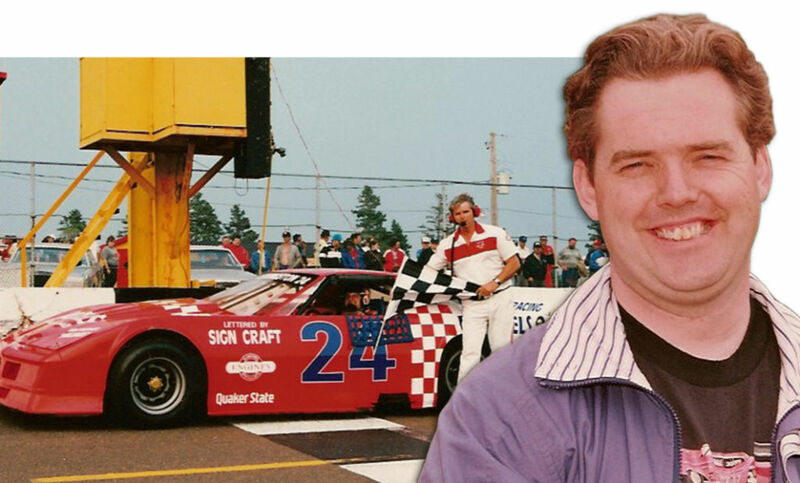 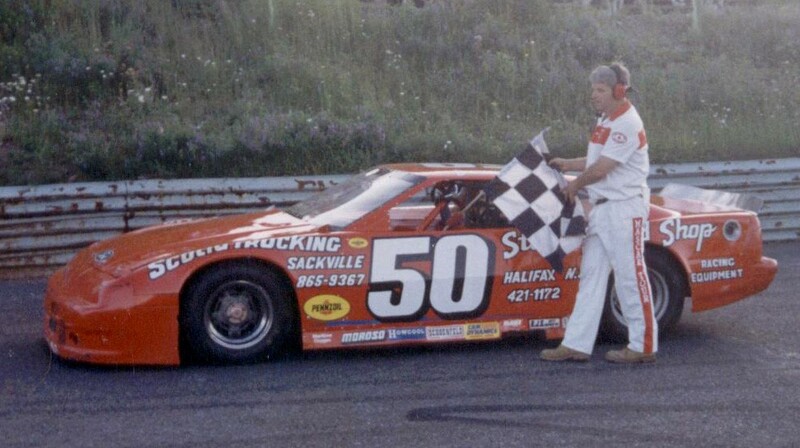 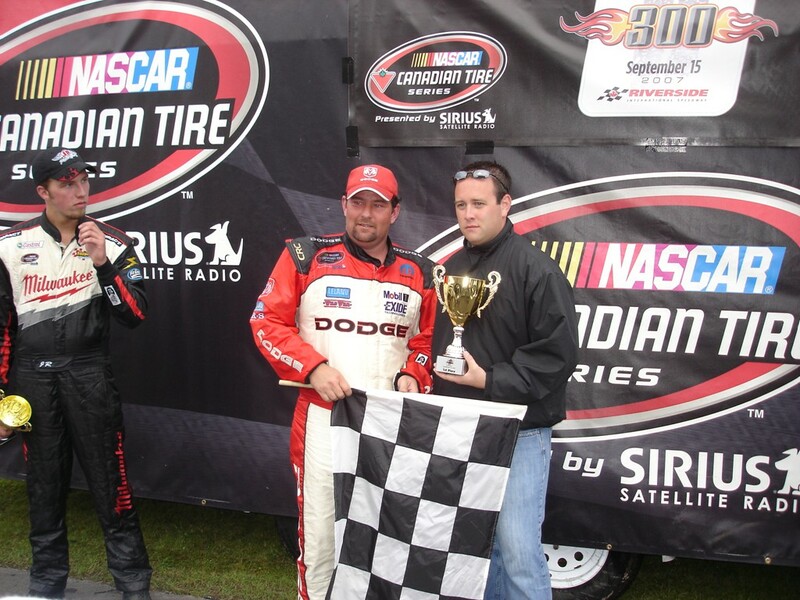 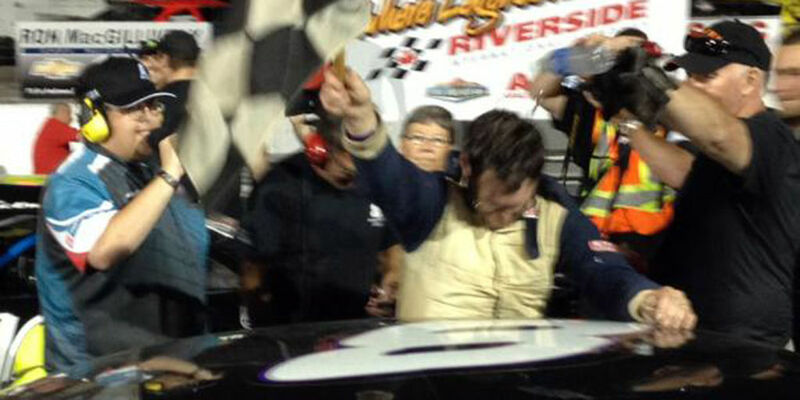 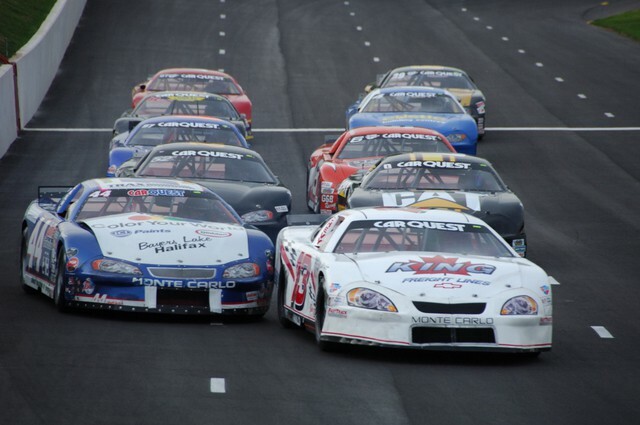 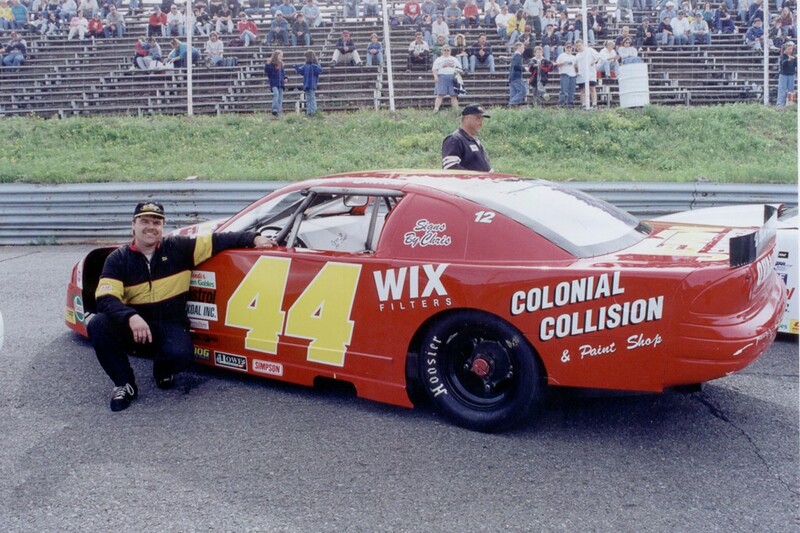 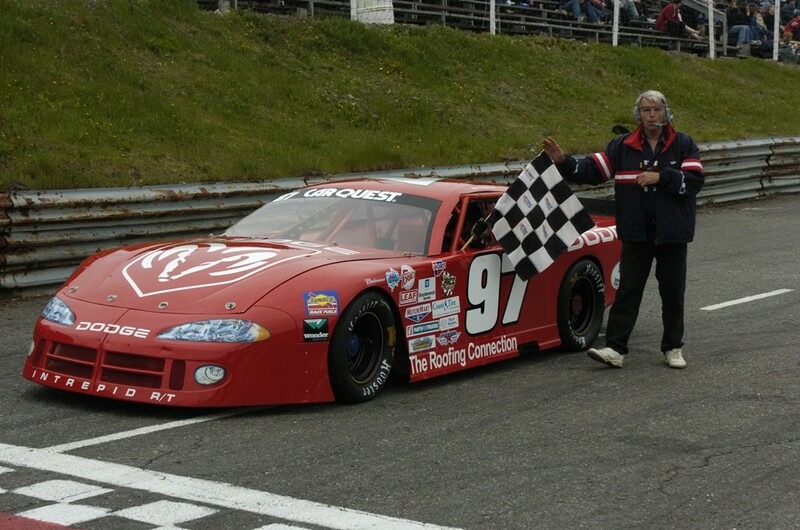 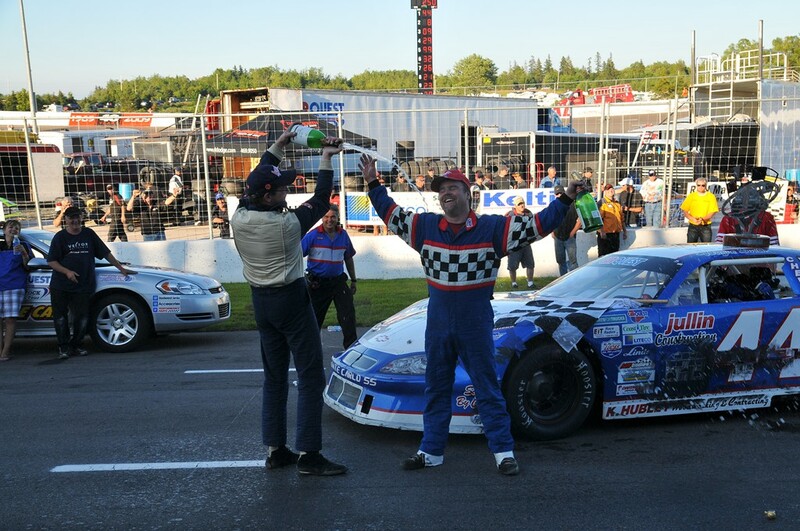 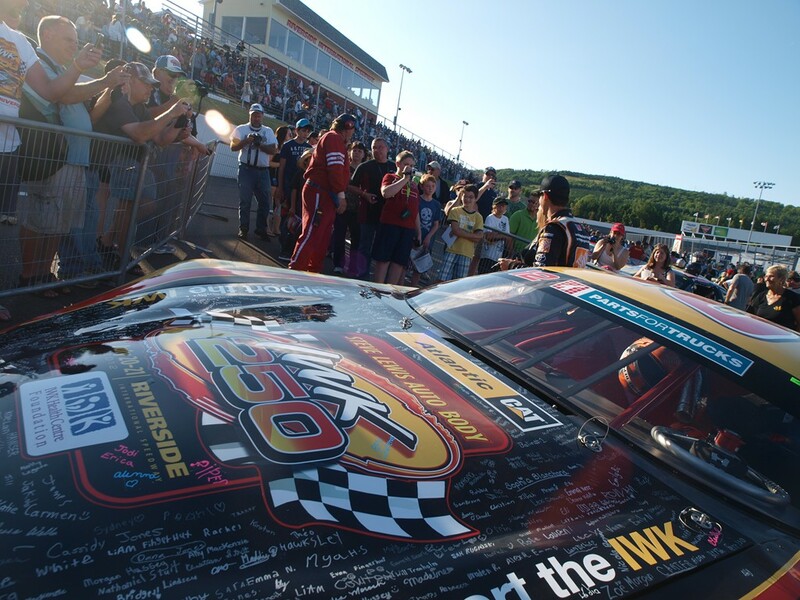 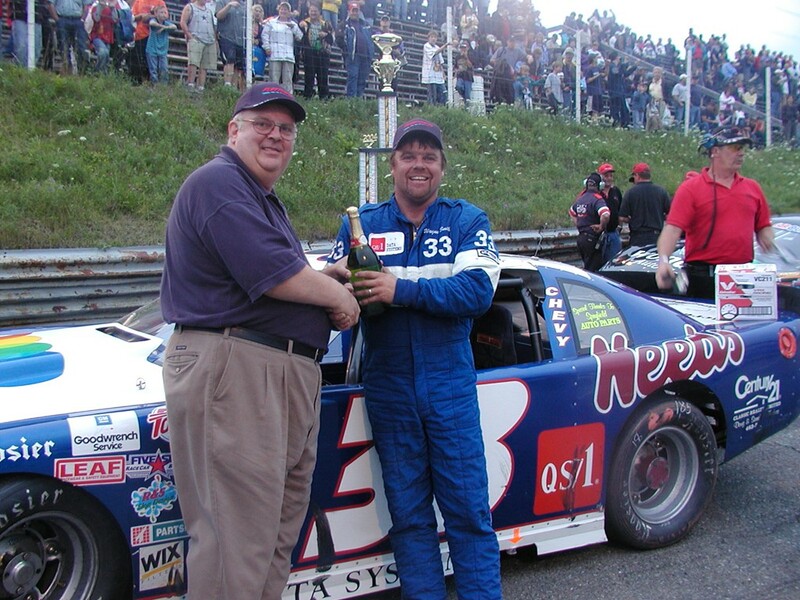 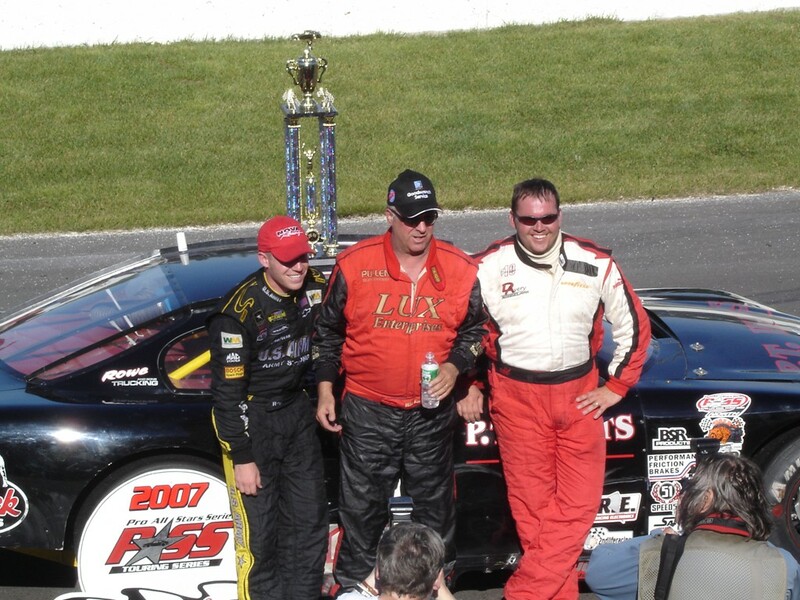 You will want to listen to this and hear what winning the IWK 250 means to legends of our sport, legends of the IWK 250. 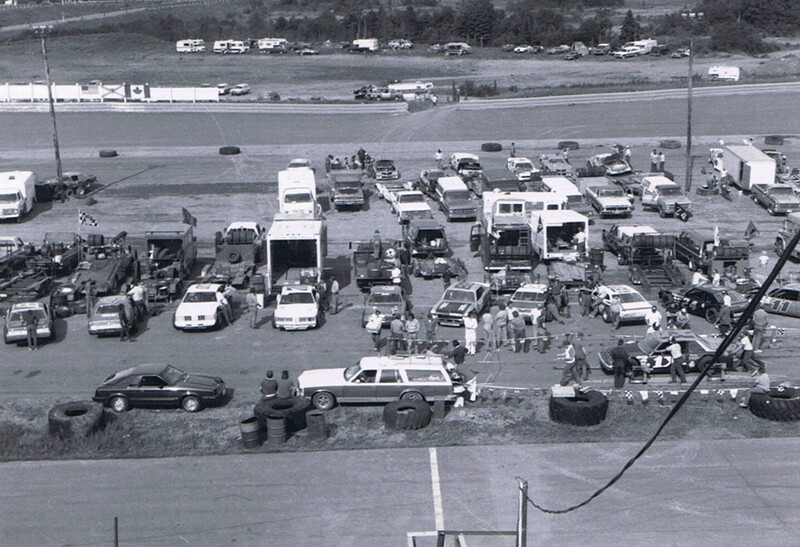 We opened in 1969, rebuilt in 2006, and continue to make memories for generations of race fans. 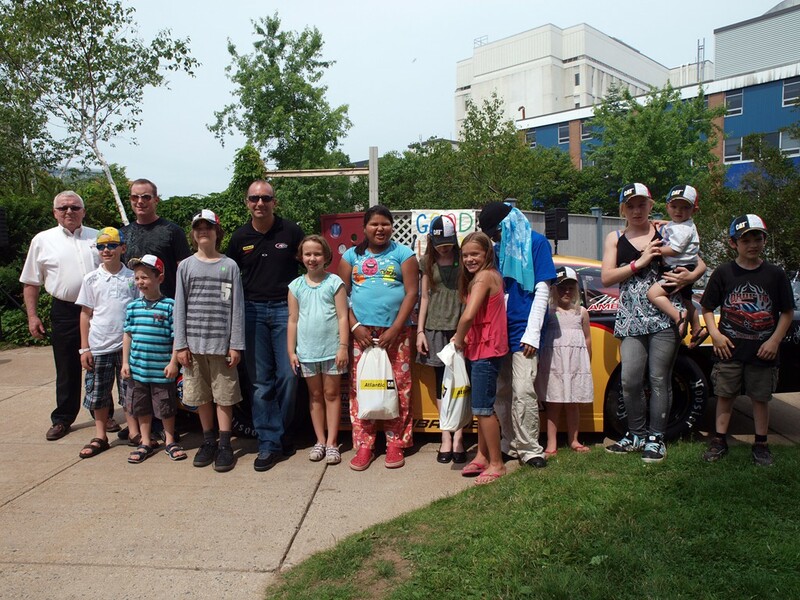 2017 July 15 – NASCAR Hall of Fame driver Mark Martin and legendary fuel man Chocolate Myers are special guests at the IWK 250 presented by Steve Lewis. 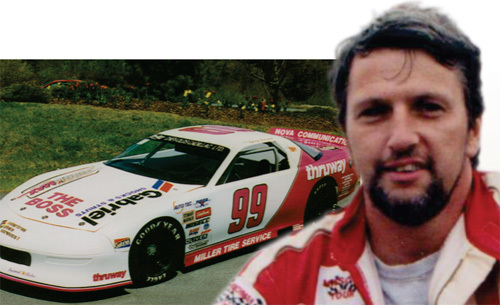 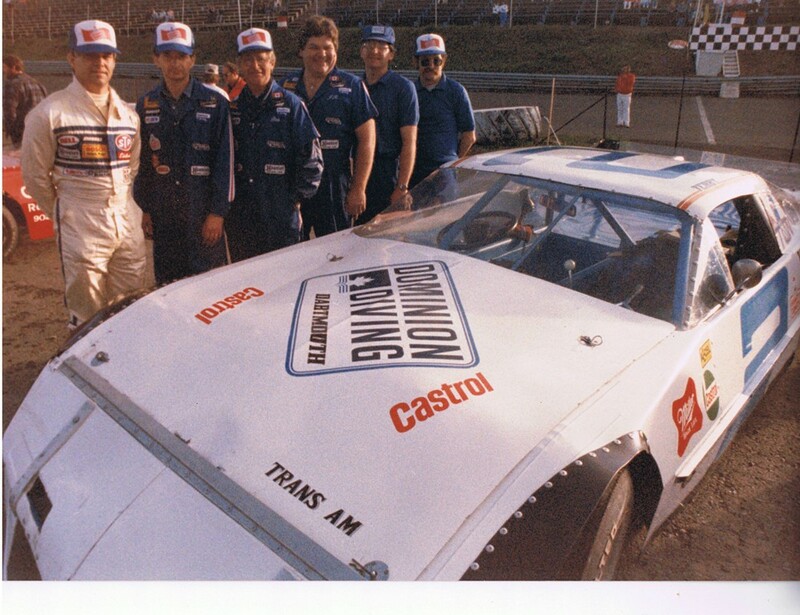 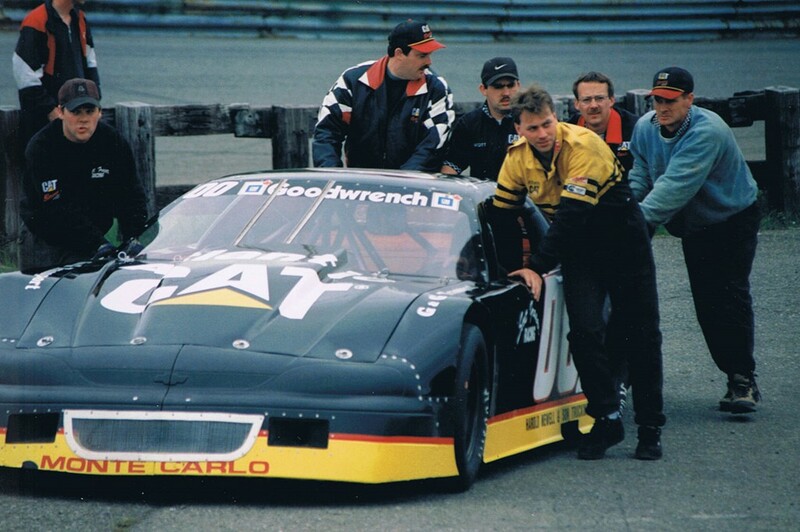 Martin was the celebrity driver in the event and Myers regaled fans with stories of his days as a crew member for the late Dale Earnhardt. 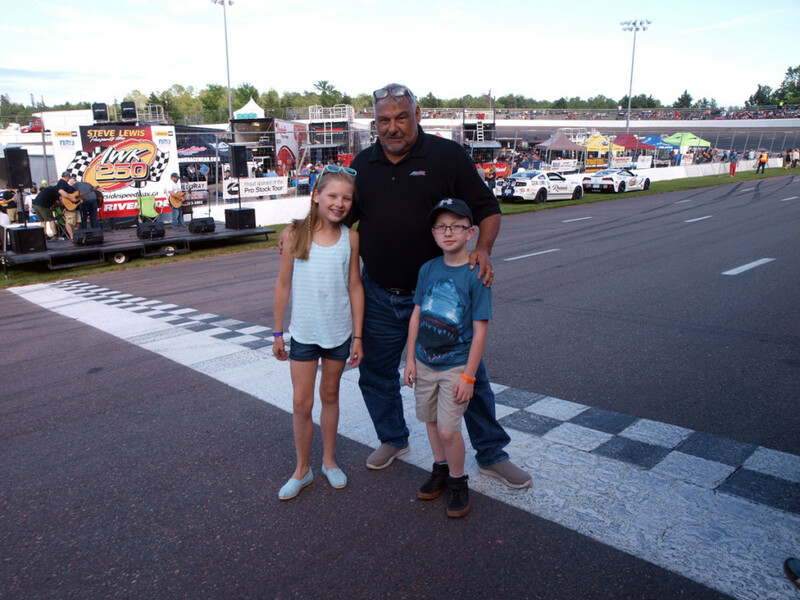 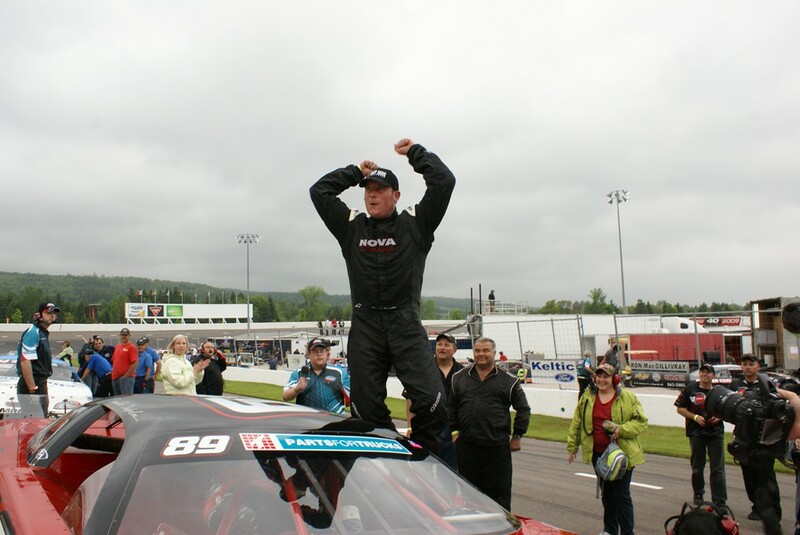 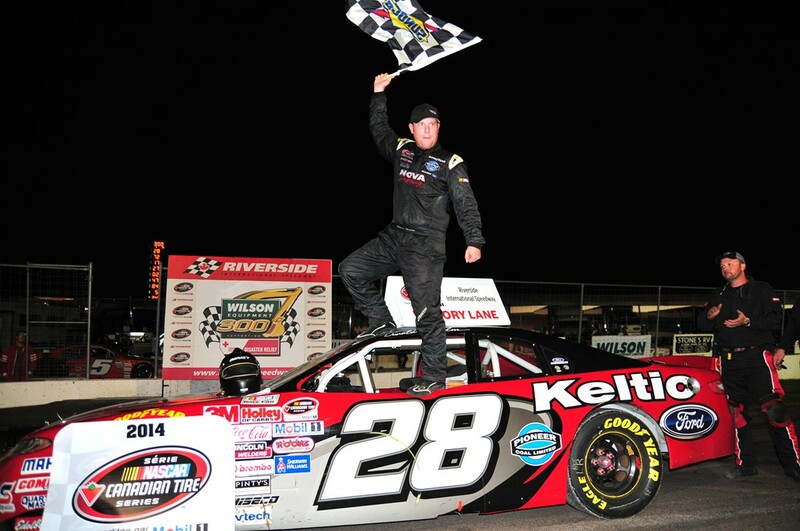 2018, July 14/15 – IWK 250 postponed by rain after 74 laps; the race resumed at lap 75 on Sunday and was won by NASCAR celebrity driver Kenny Wallace. 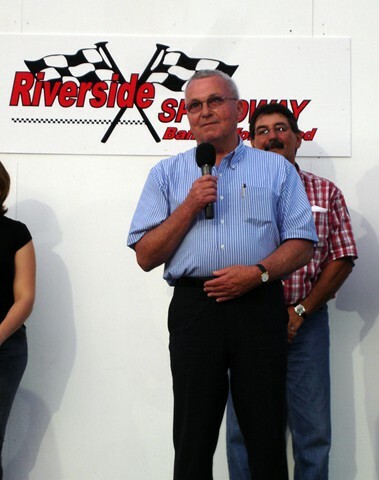 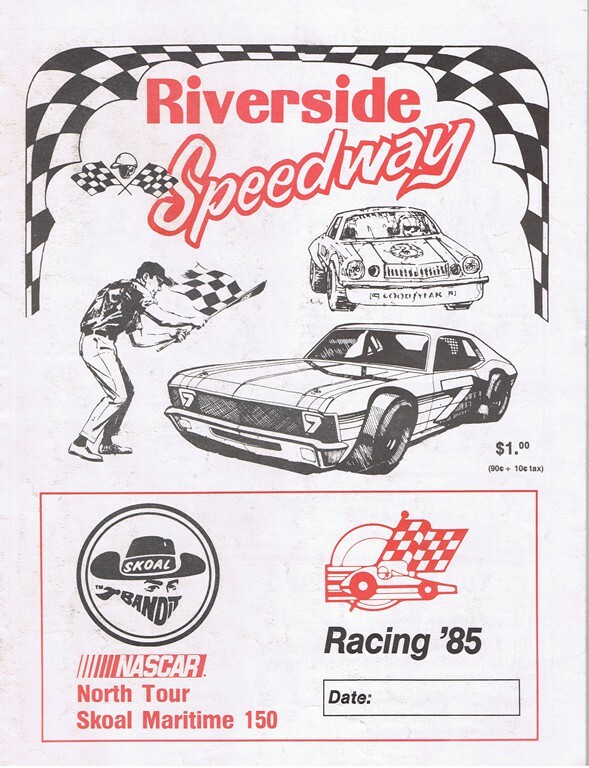 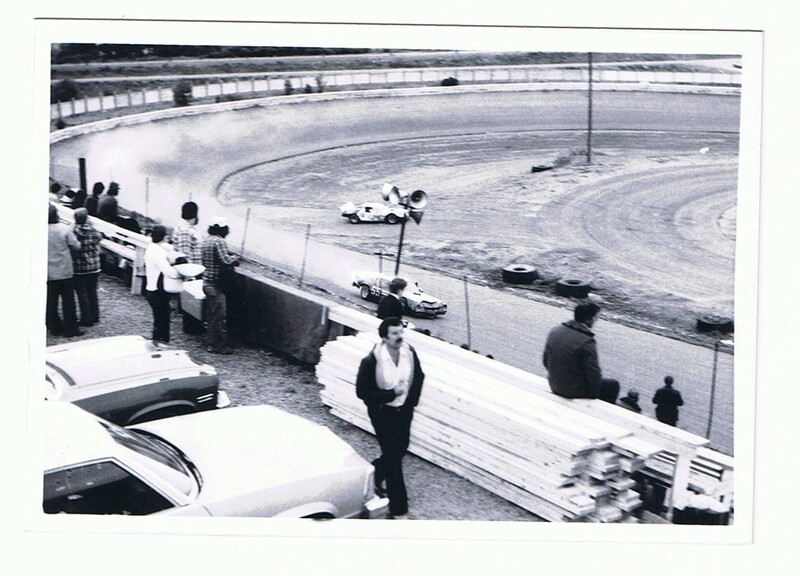 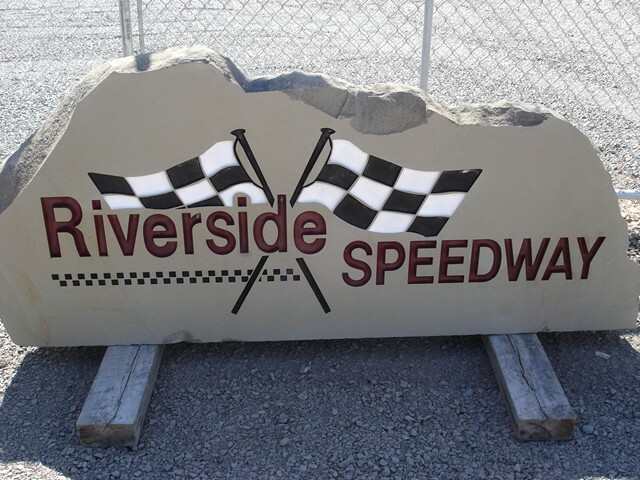 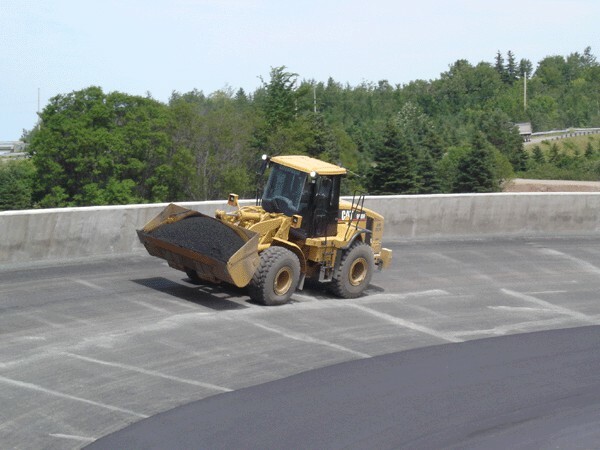 On January 6, 2006 John Chisholm began a major renovation of what was Riverside Speedway; on August 19, 2006 the facility reopened as Riverside International Speedway. 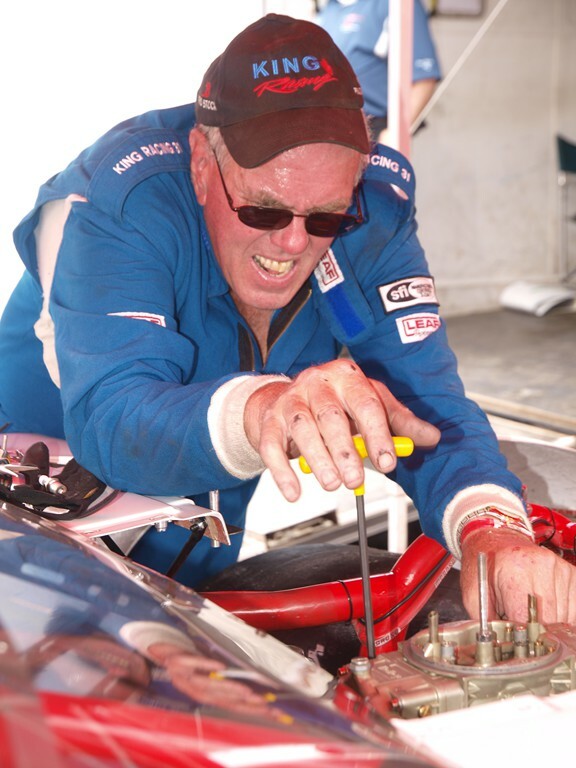 The renovation was as close to complete as everything except the starter’s stand was either replaced or rebuilt. 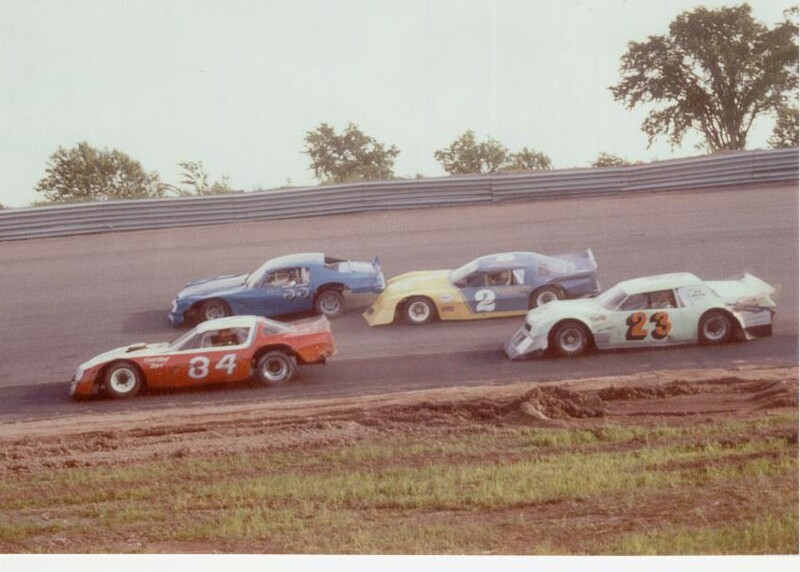 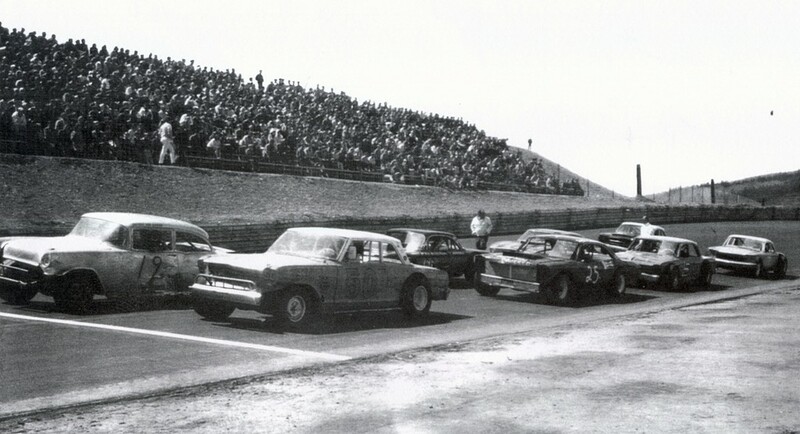 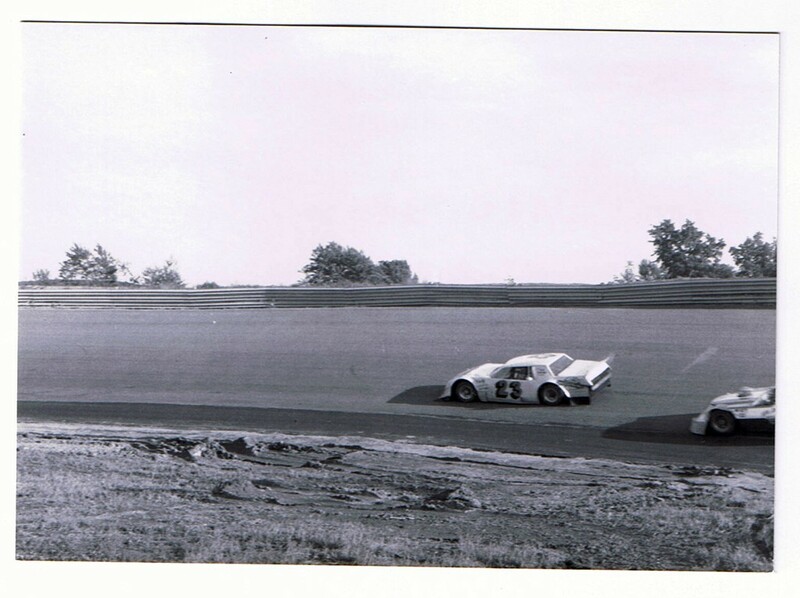 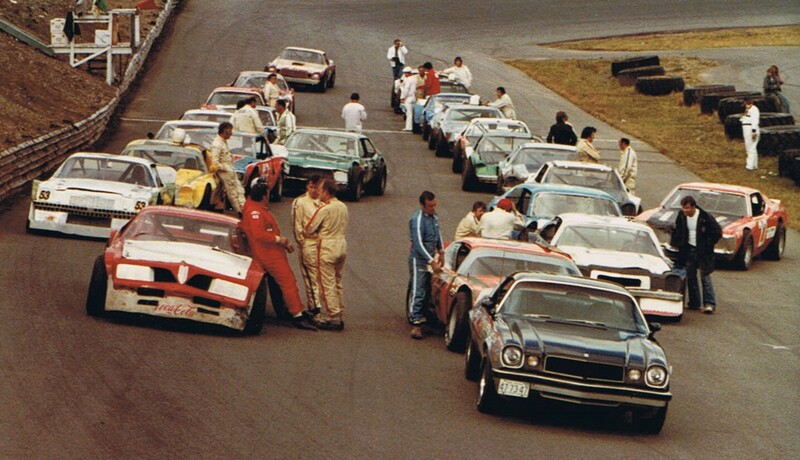 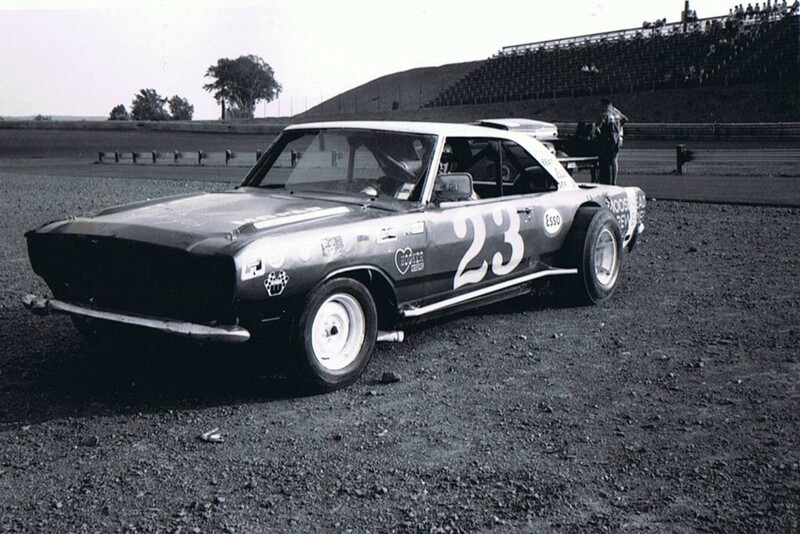 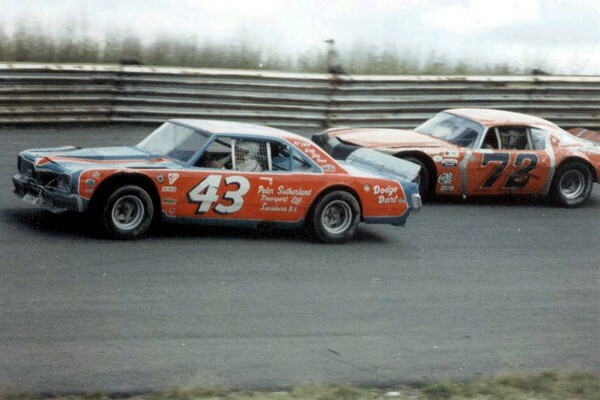 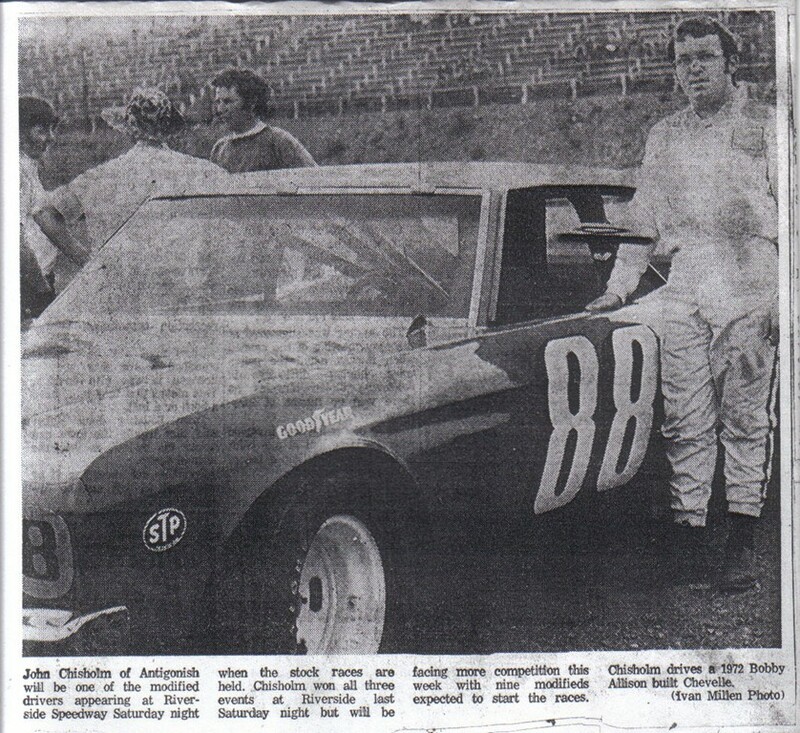 The 3/8-mile oval was repaved but Chisholm kept the notorious shape and banking he had put in place in 1969, scaled after the famous Bristol Motor Speedway in Tennessee. 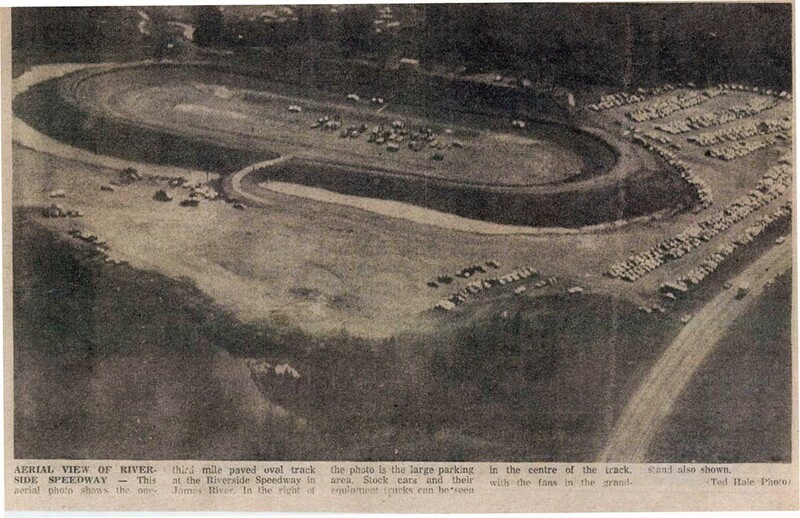 He added concrete retaining walls, new and bigger grandstands, a new modern tower in which the top level includes VIP seating, a press box, race control, and announcer’s booth and the bottom level a canteen, snack bar, souvenir shop, and large modern washrooms. 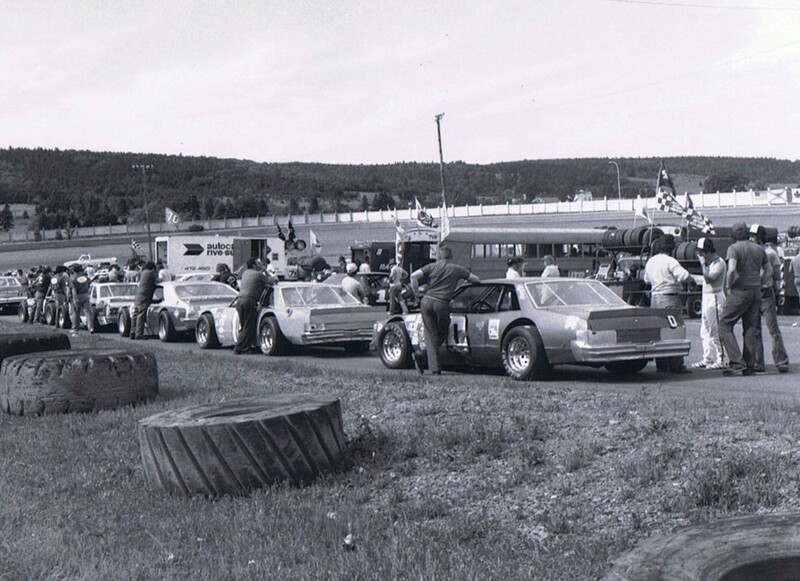 The supporting infrastructure included new sound and lighting systems, a state-of-the-art electronic scoreboard, utilities, and the parking and campground areas were both improved and enlarged. 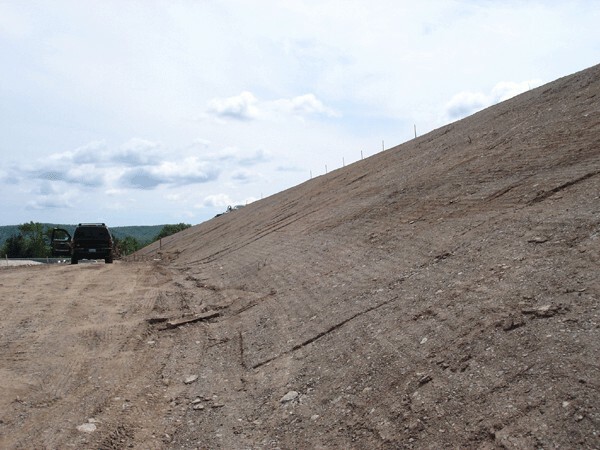 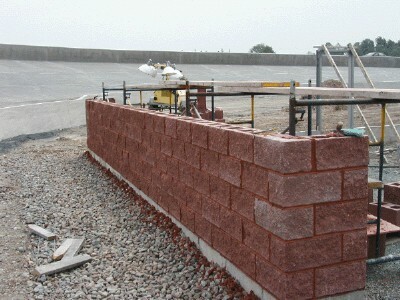 May 28 – The outside concrete retaining wall is finished (a three month job); the lines are marked for the inside concrete wall. 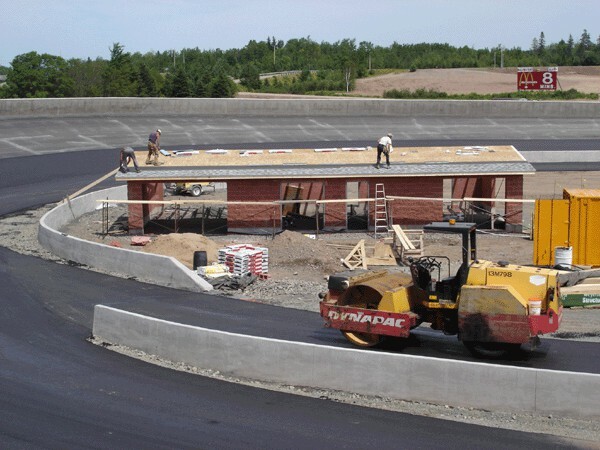 May 28 – Starting the infield building..
June 8 – Looking down the frontstretch from turn one; the grandstand hills have been reshaped to accomodate more seating. 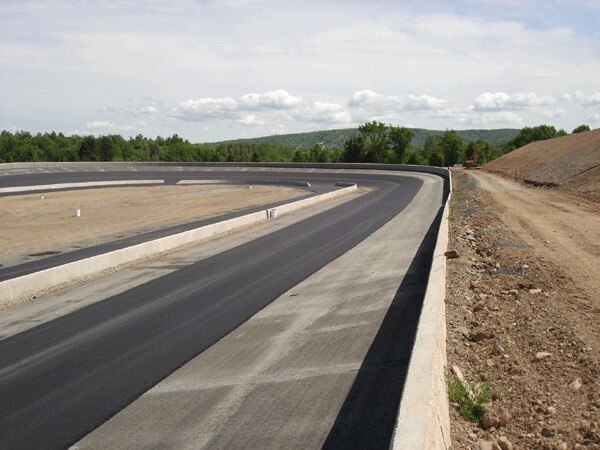 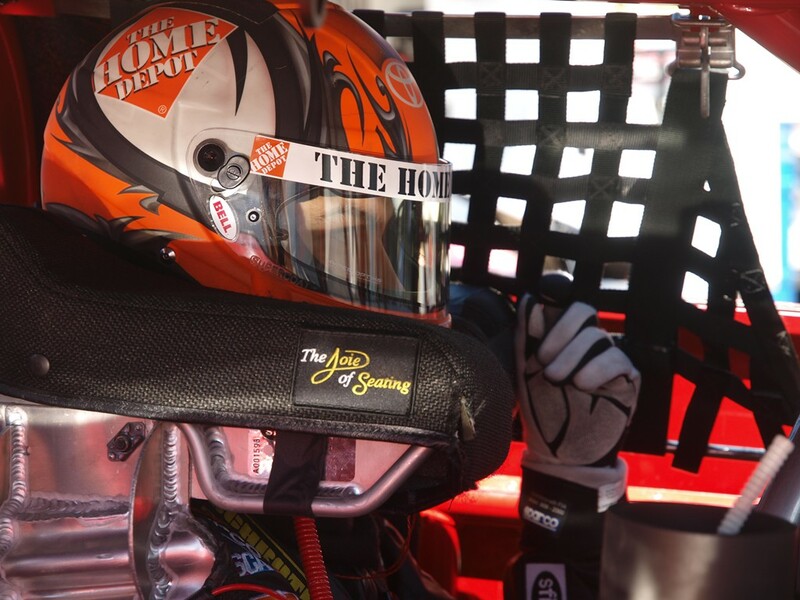 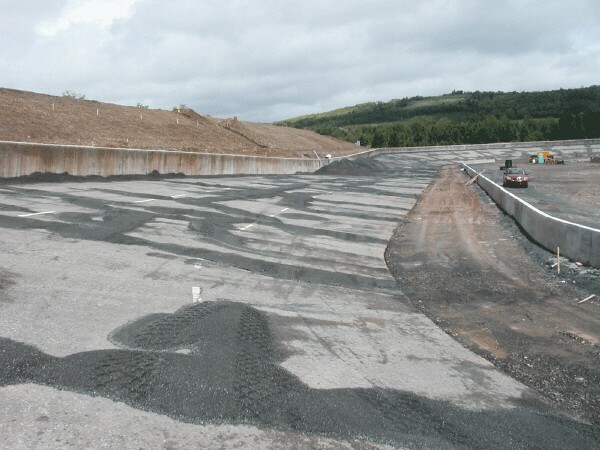 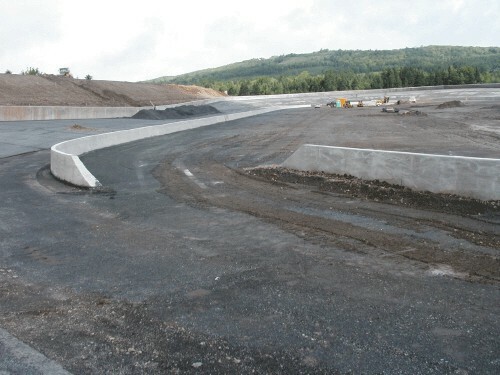 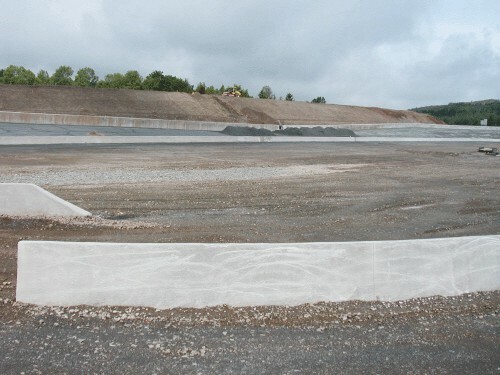 June 15 – The new pit road exit at turns 1-2. 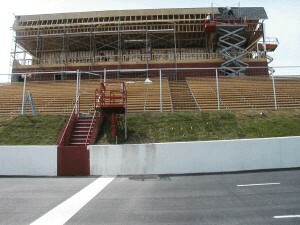 June 15 – Taken from turn 2, showing the backstretch pit entry in the foreground. 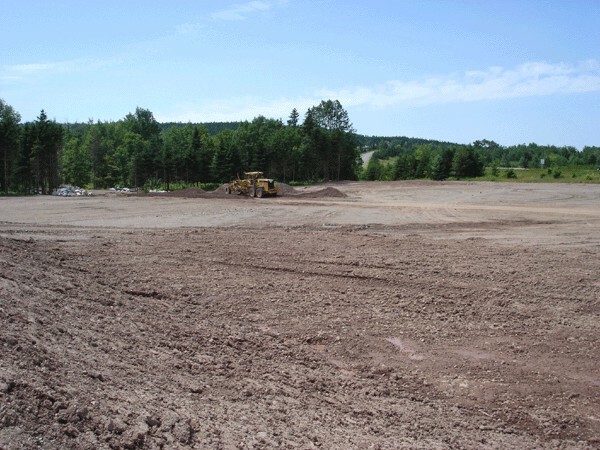 June 20 – The new infield building is taking shape. 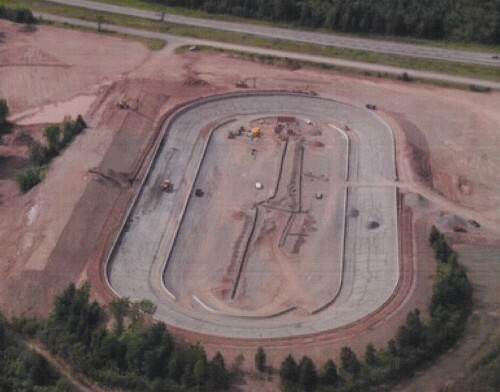 June 20 – An aerial view; for reference the infield building is at the top of the picture. 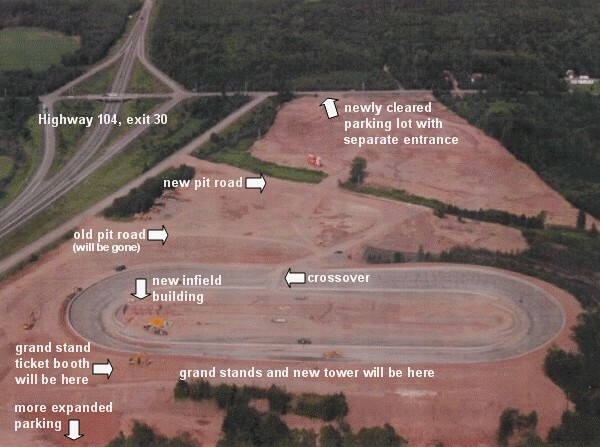 June 20 – A different aerial view, showing the master plan. 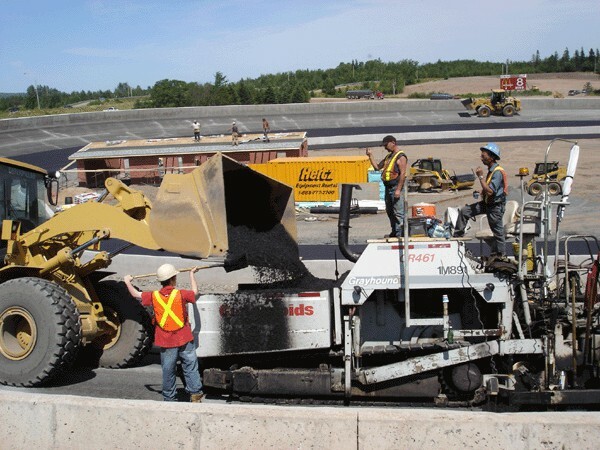 July 7 – Transporting the asphalt..
July 7 – En route to the paving machine. 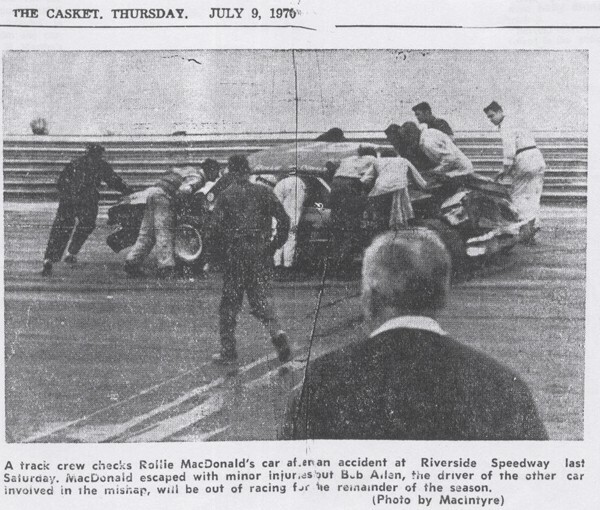 July 7 – In she goes. 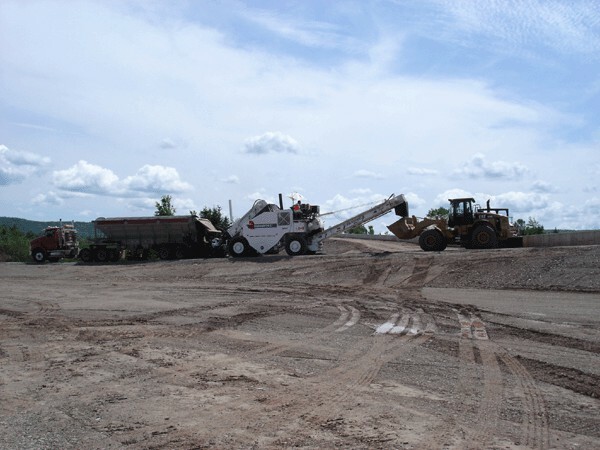 July 7 – And on she goes. 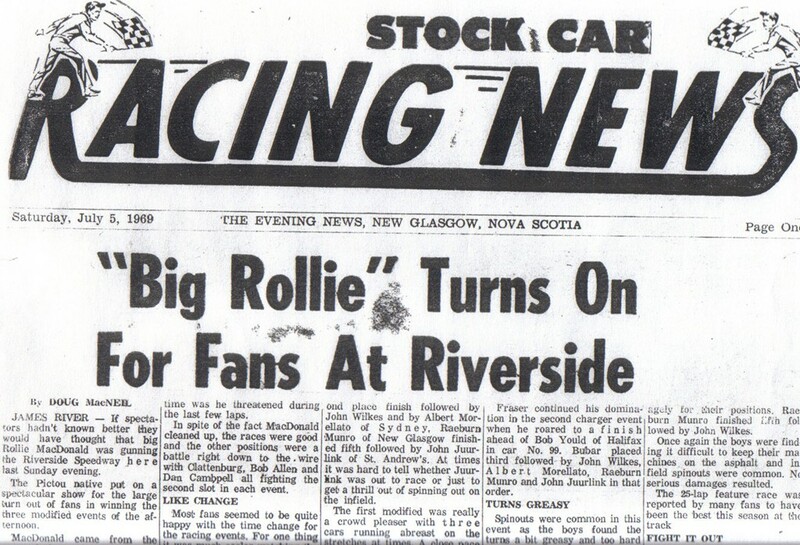 July 7 – Rolling the seams. 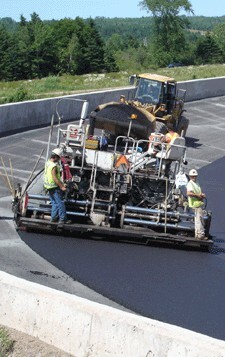 July 7 – And after two of three strips of asphalt. 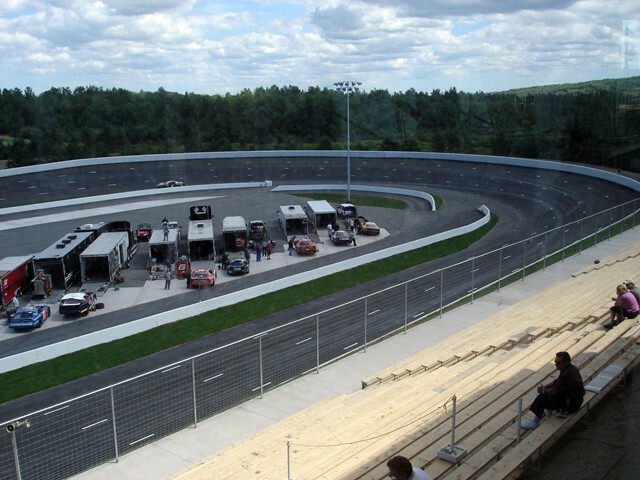 July 7 – Looking at turn 1 from the top of the grandstand at the start/finish line. 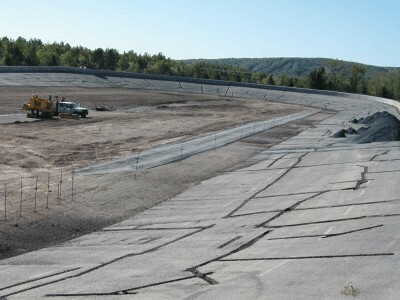 July 7 – A look down the frontstretch after one of three strips of asphalt was down. 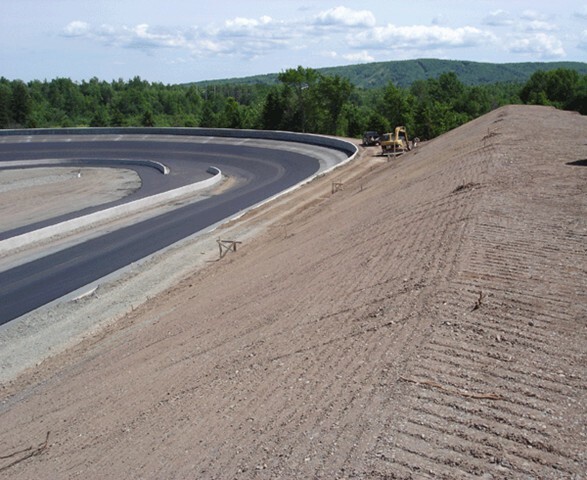 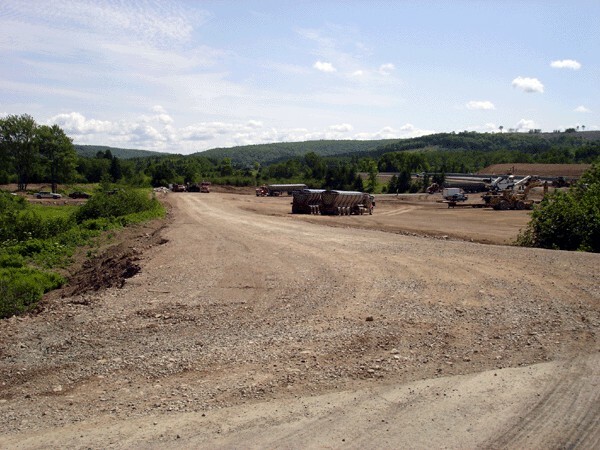 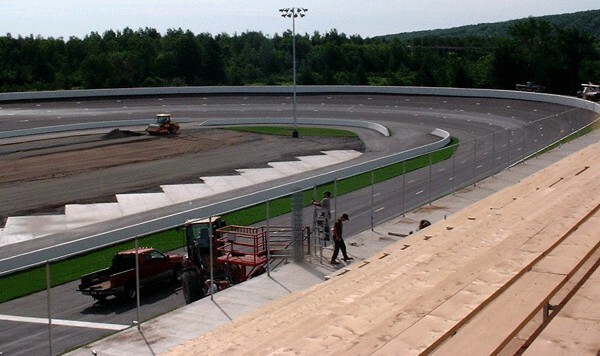 July 7 – Where the grandstands will be; installation started on paving day. 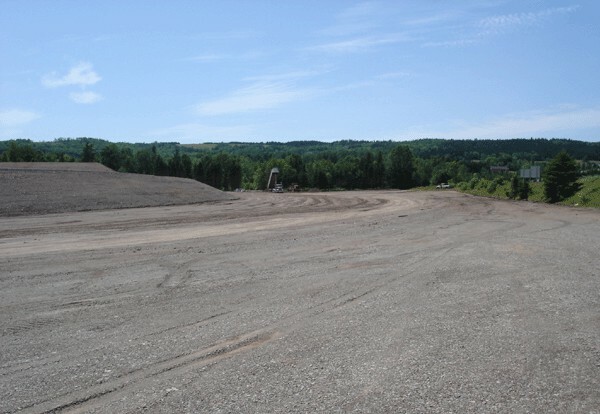 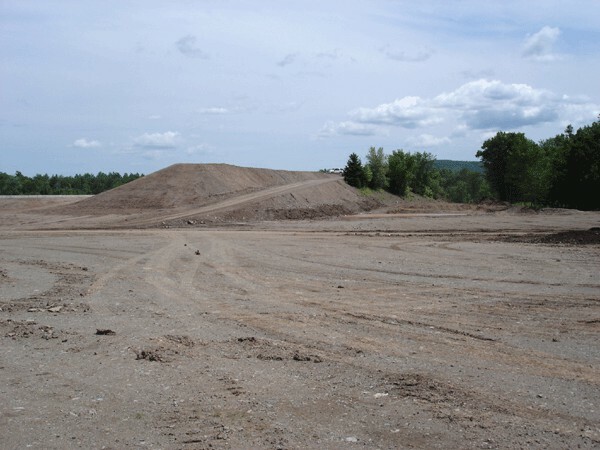 July 7 – From where the grandstand box office will be looking toward the main parking area. 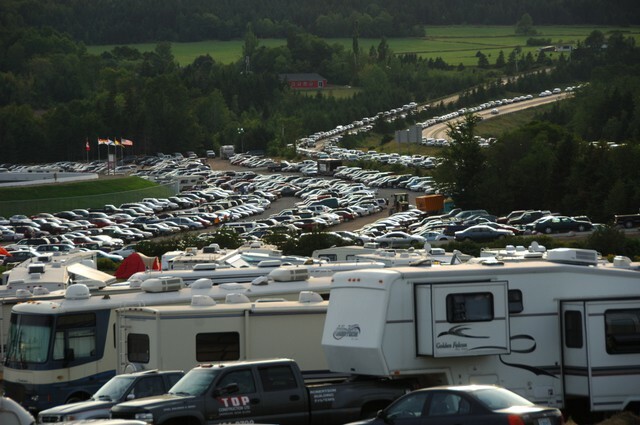 July 7 – From the highway looking at the box office/grandstand area. 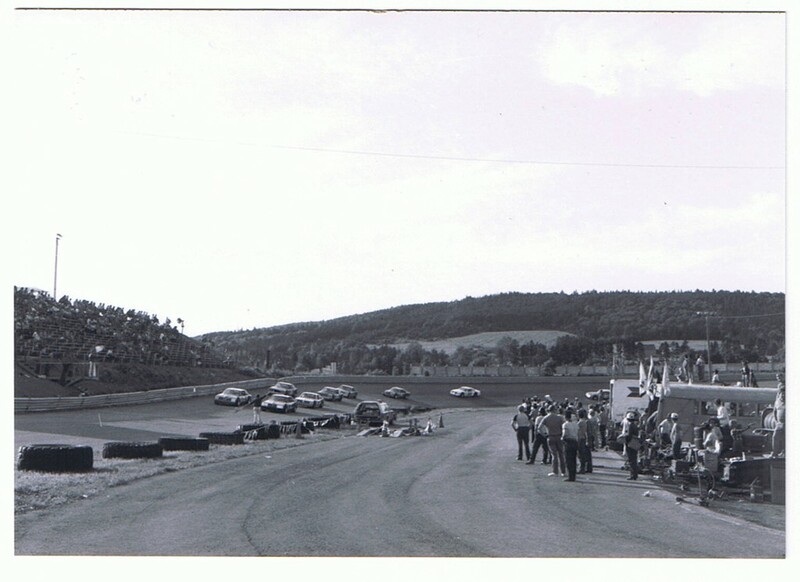 July 7 – From atop the grandstand area. 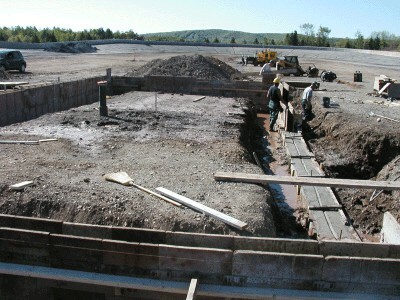 July 7 – From the pit side looking toward main entry area. 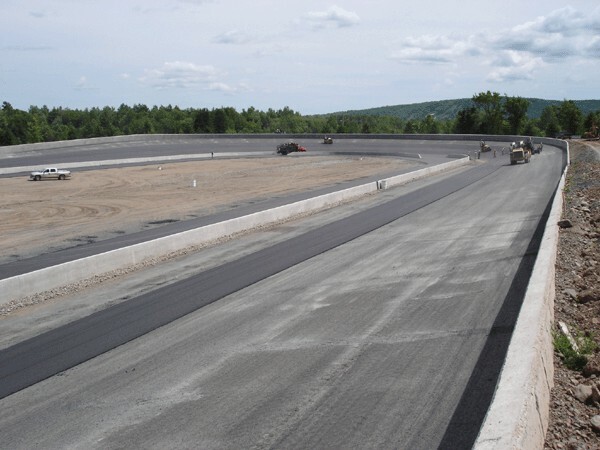 July 7 – The new pit road. 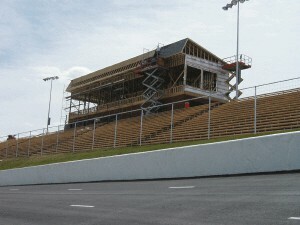 July 20 – New supporting structure for new grandstands. 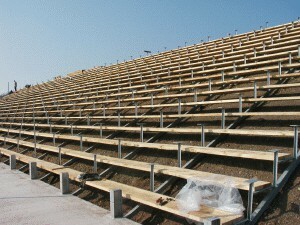 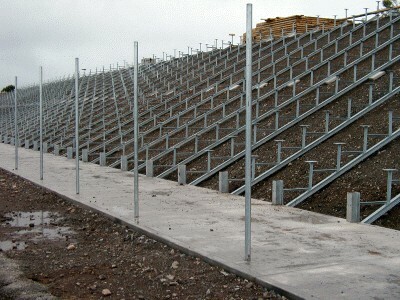 July 20 – Installing the new grandstands. 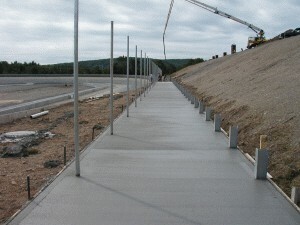 July 20 – New concrete walkways being poured. 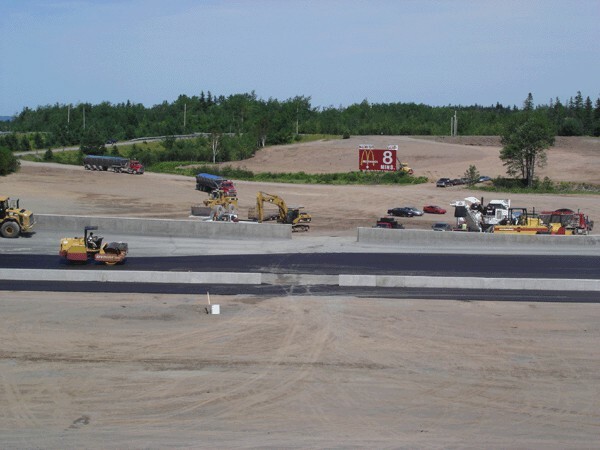 July 23 – Fence posts going in. 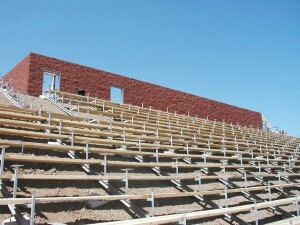 July 26 – Floorboards yet to be installed. 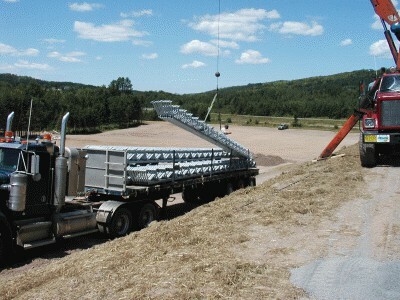 August 1 – The new tower is going up. 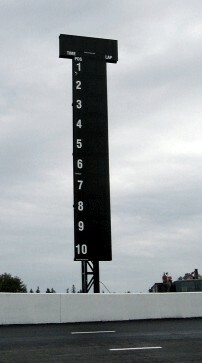 August 3 – The new scoreboard is up. 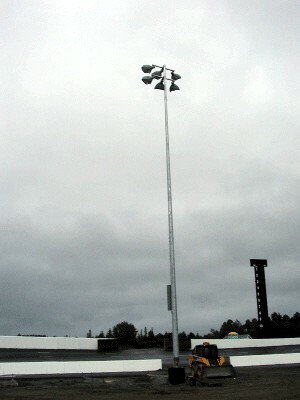 August 8 – New state of the art lighting going up, all powered by generator. 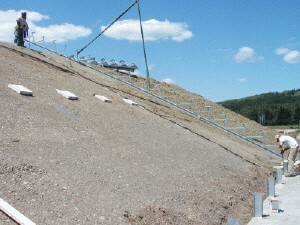 August 8 – View from the top. 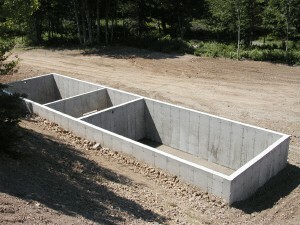 August 8 – A 35,000 gallon septic (not exciting) for the 40 washrooms (very exciting). 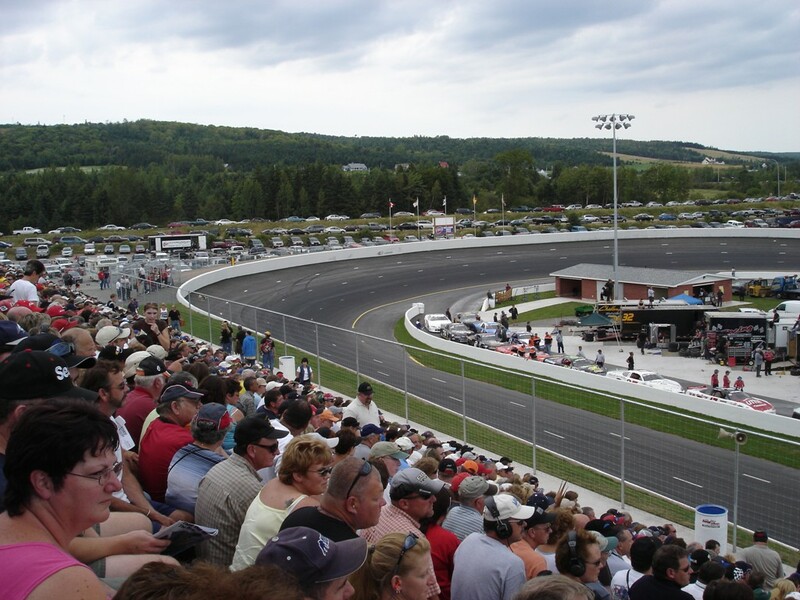 August 14 – Less than week until opening day. 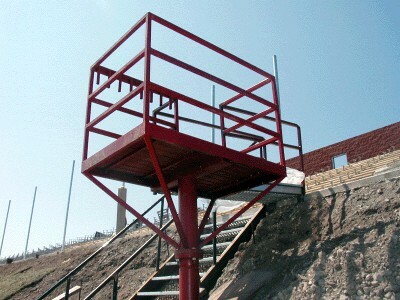 August 14 – The massive new tower is nearing completion. 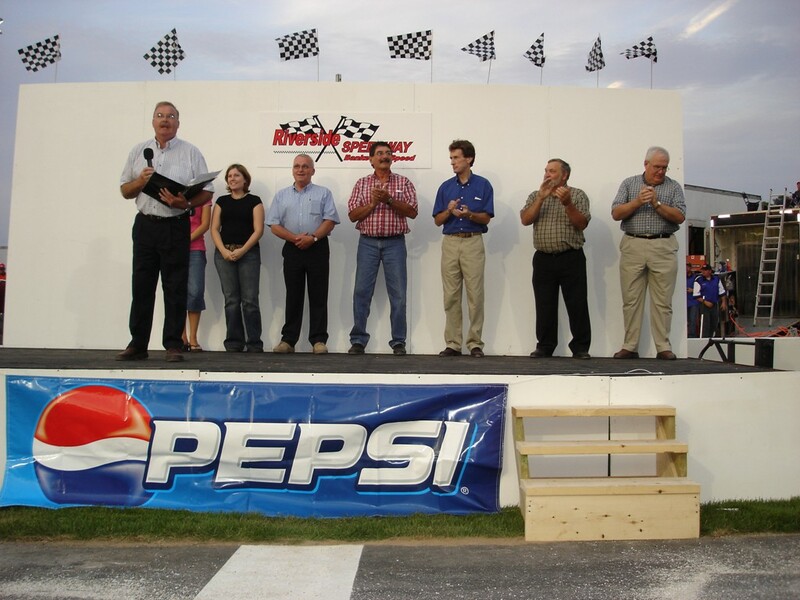 August 18 – The eve of the grand reopening. 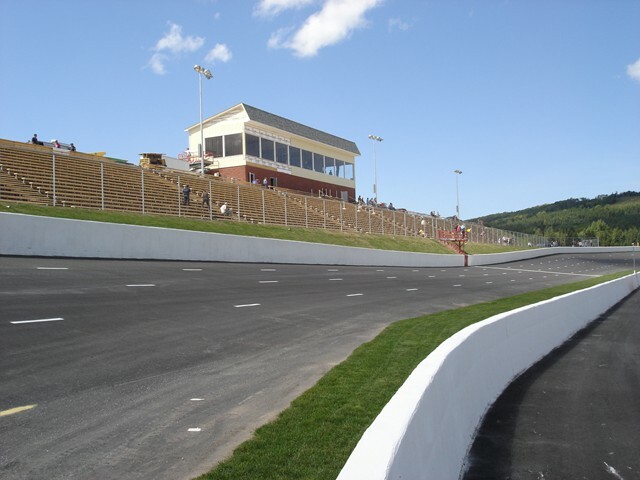 August 18 – Open practice. 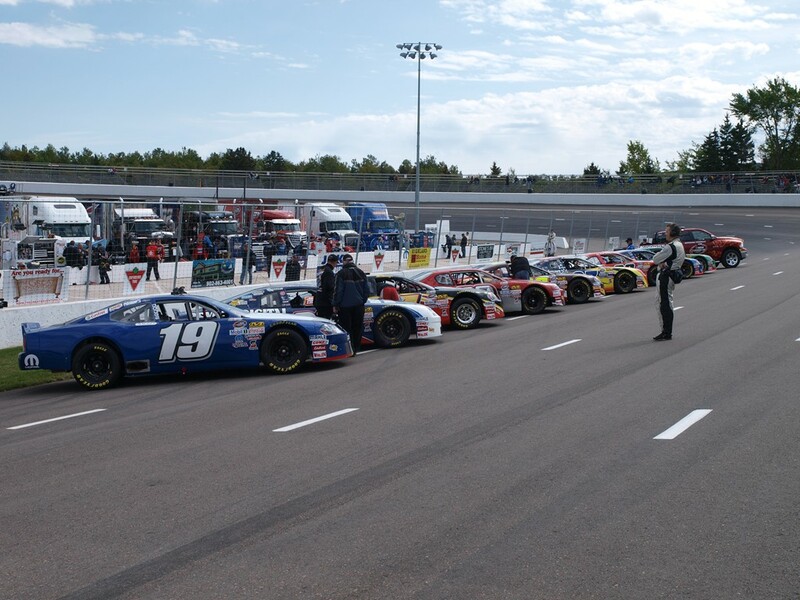 August 18 – Looking down pit road. 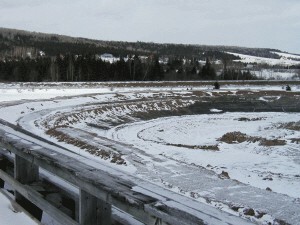 August 18 – From turn one. 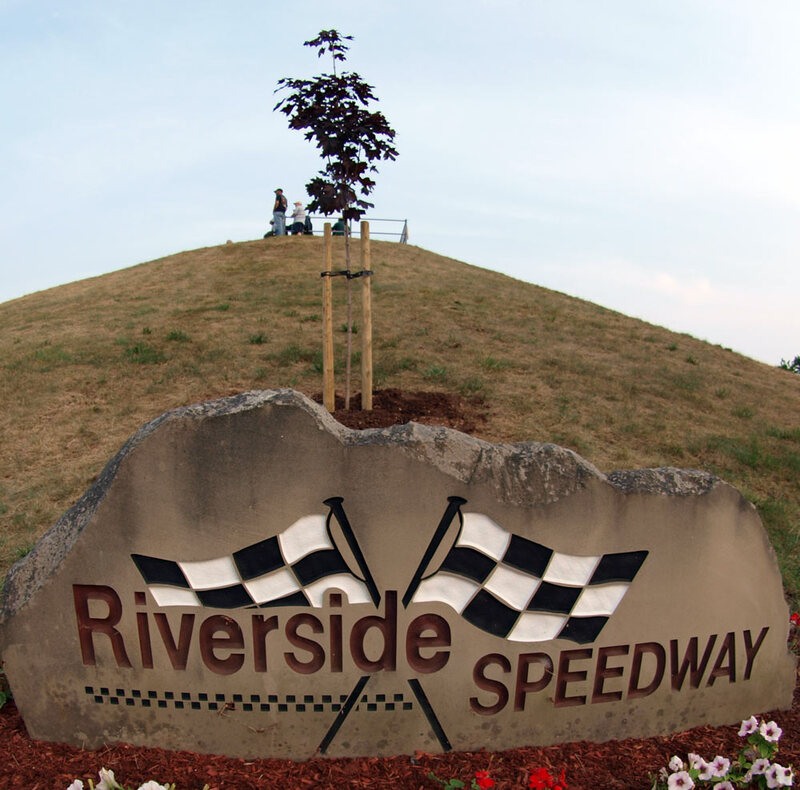 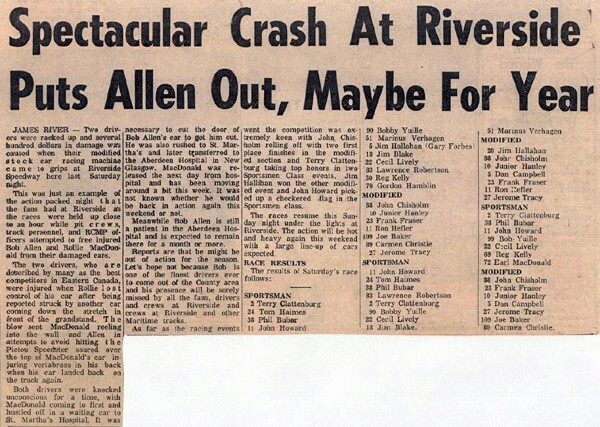 August 19 – After 8 1/2 months of rebuilding it is time to reopen Riverside! 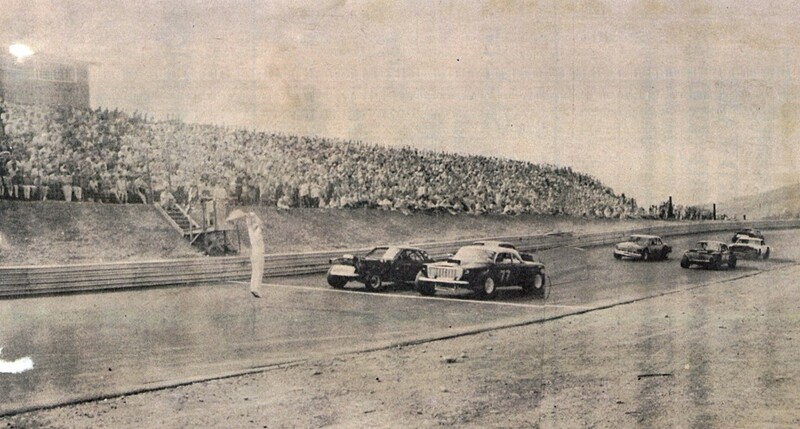 August 19 – Parking was at a premium with a sellout crowd on hand. 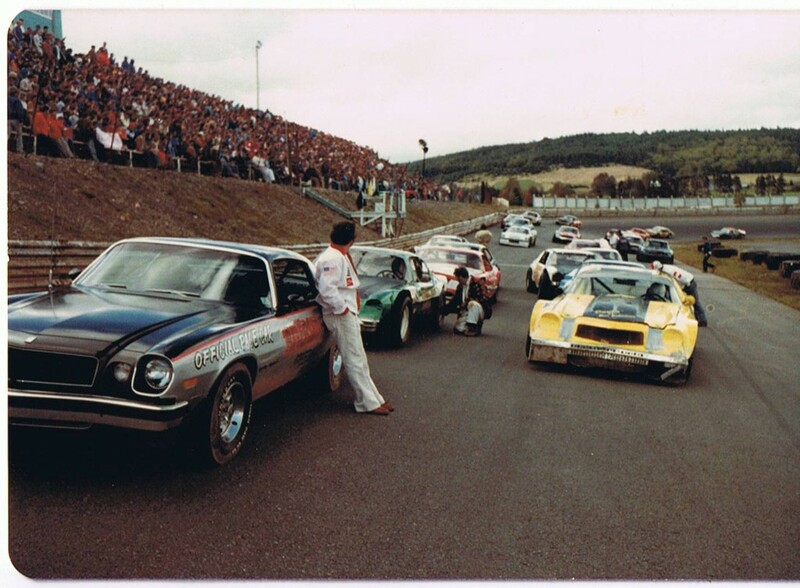 August 19 – Gentlemen start your engines! 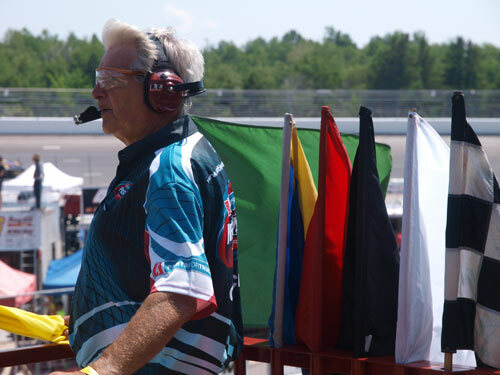 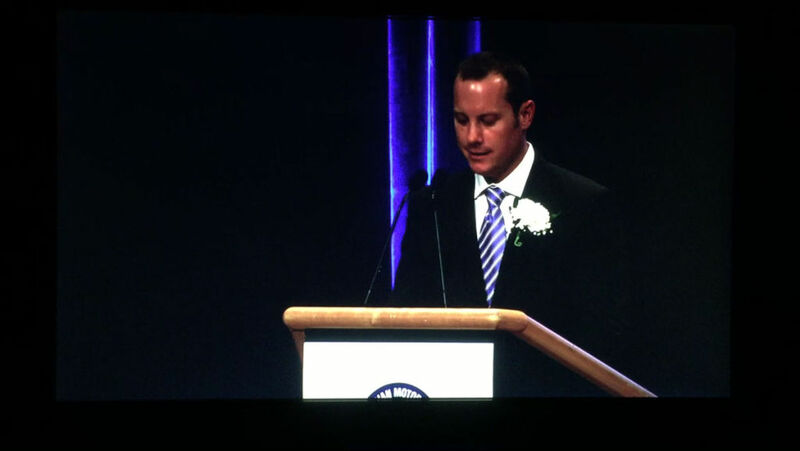 August 19 – John Chisholm reflects during opening ceremonies. 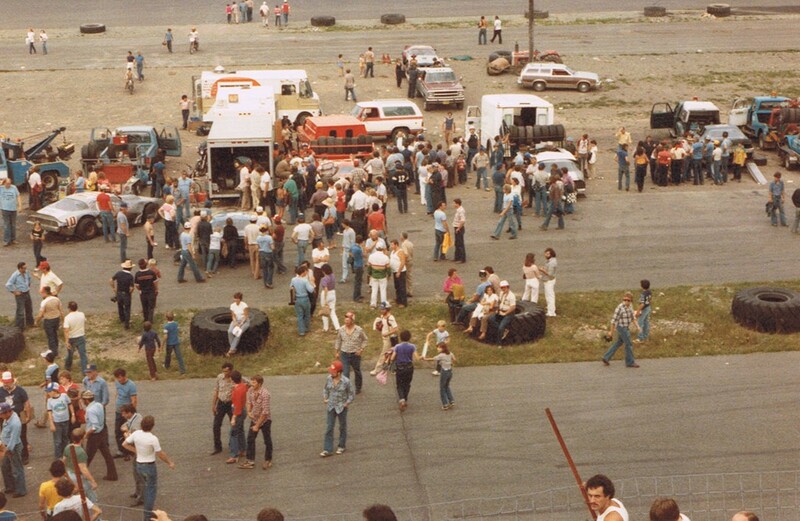 August 19 – Fans are eager for the show to start. 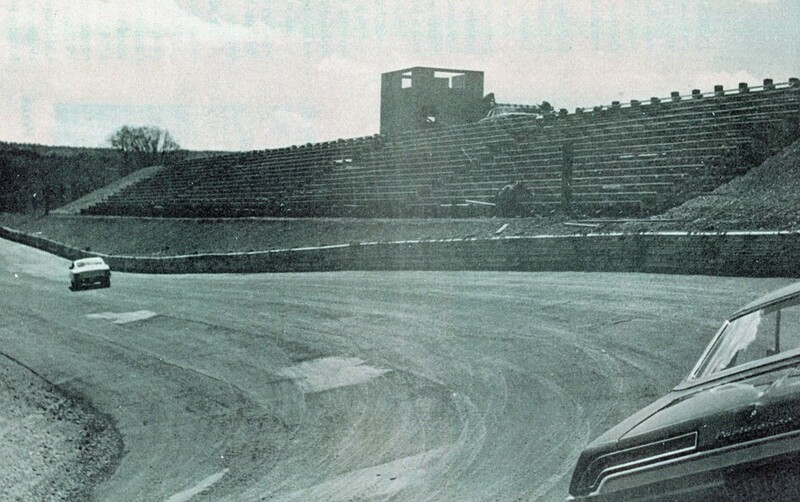 August 19 – The first turn on the first lap at the new Riverside. 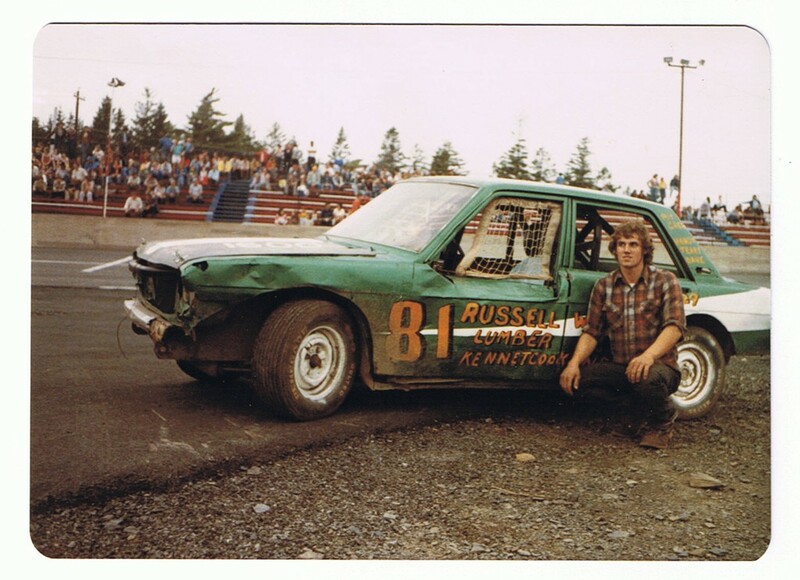 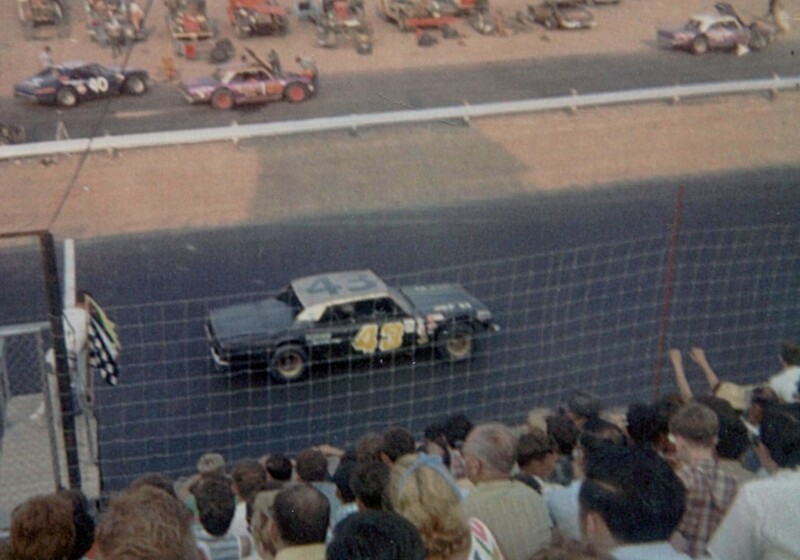 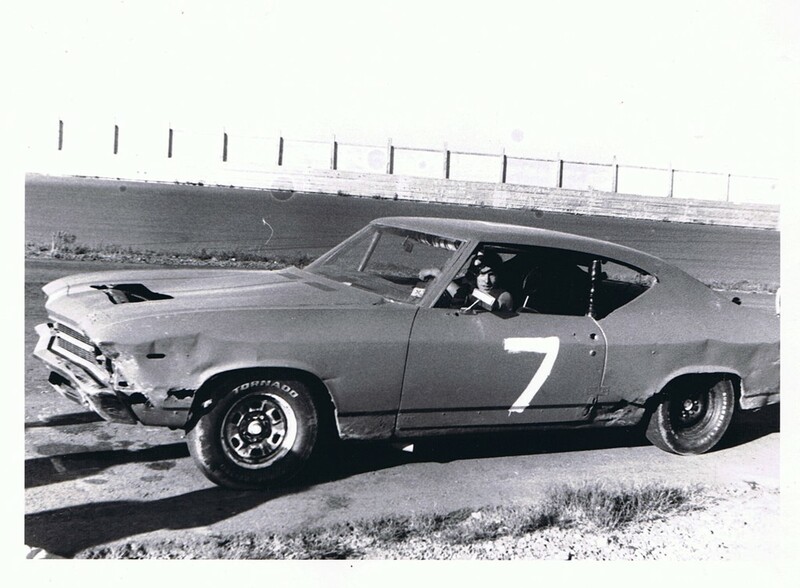 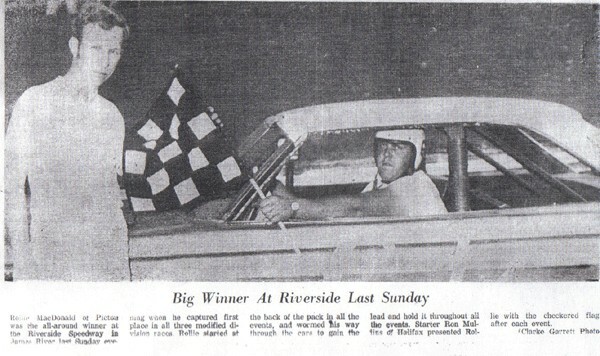 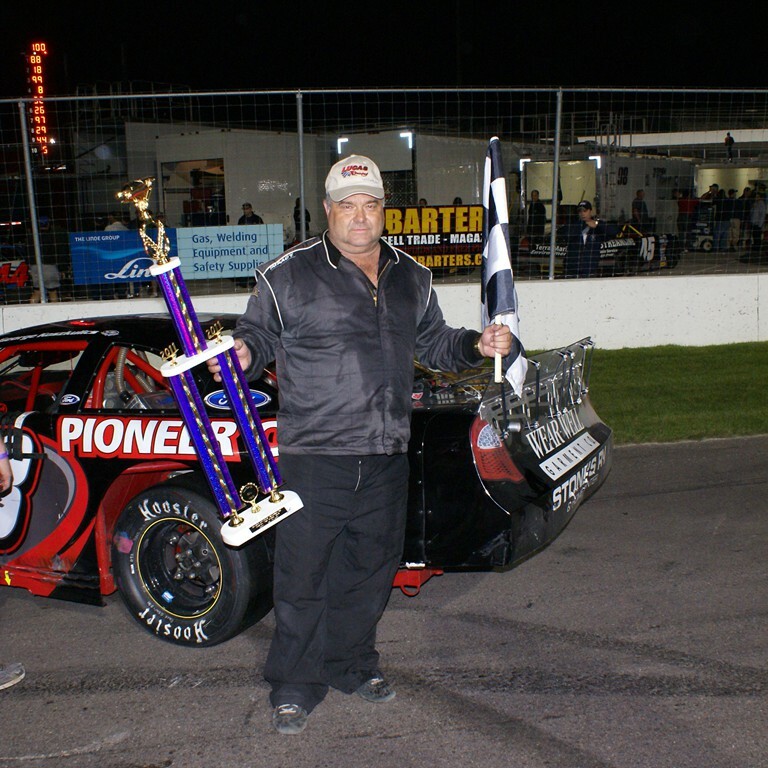 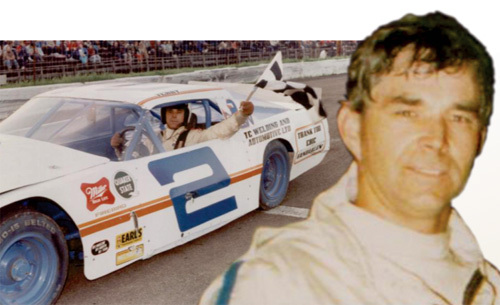 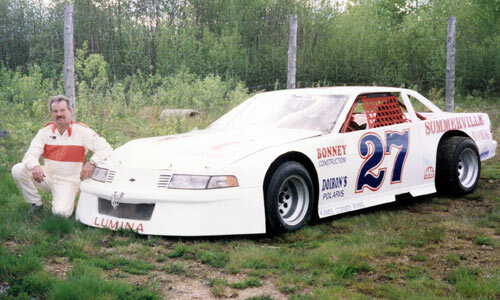 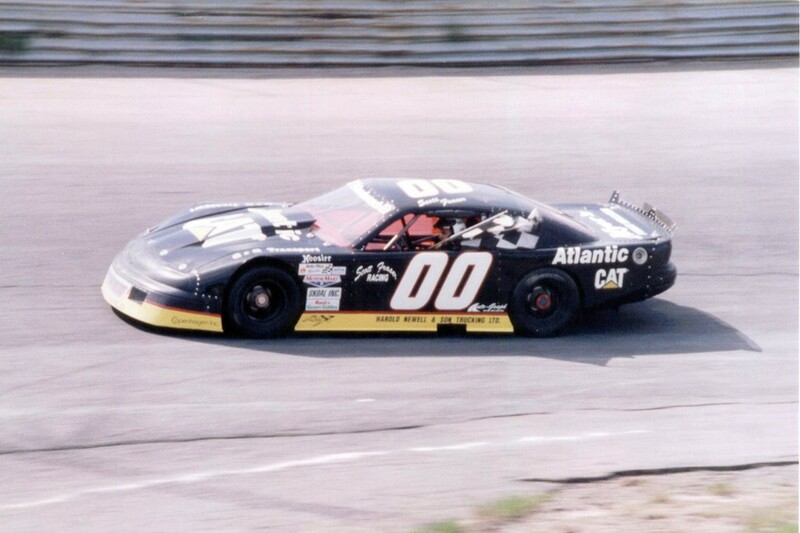 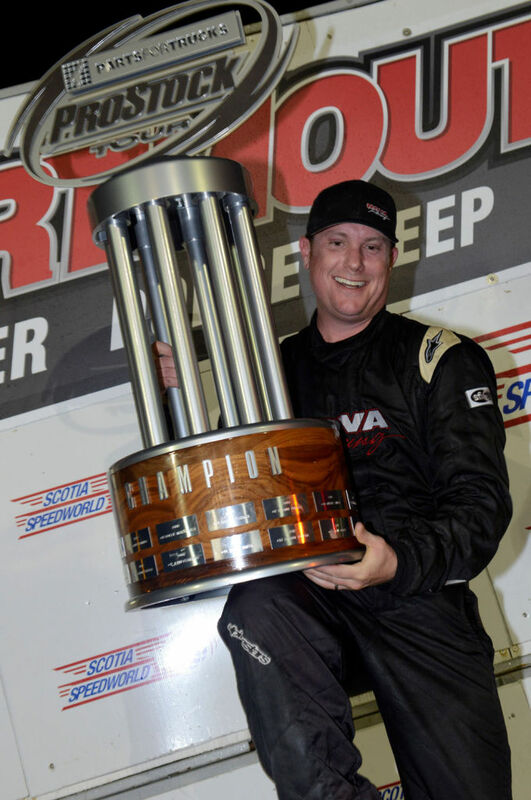 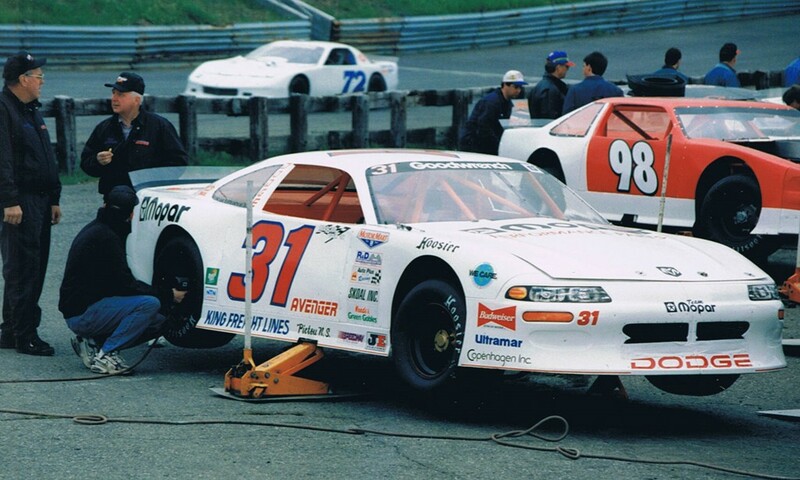 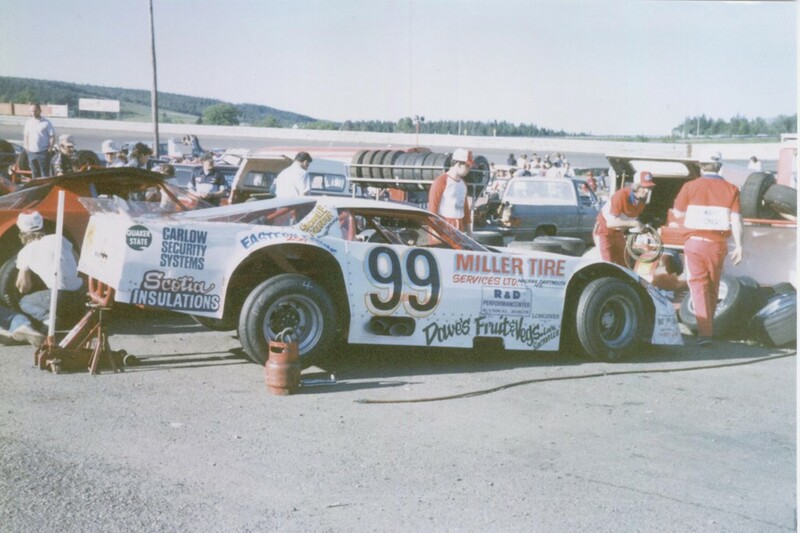 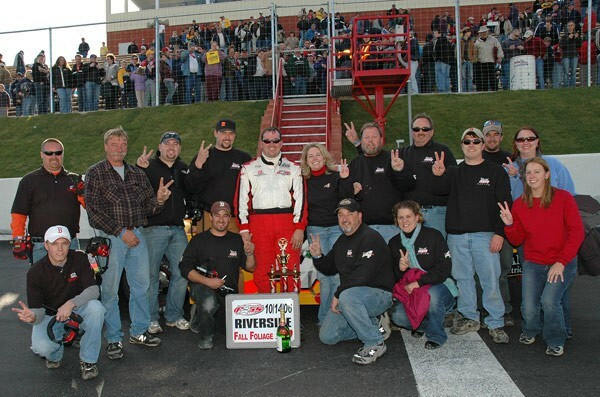 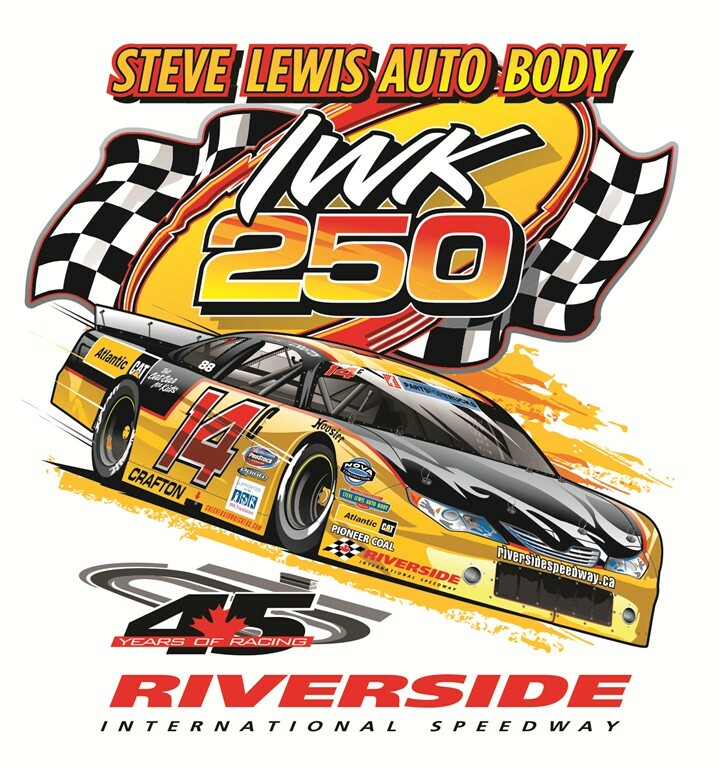 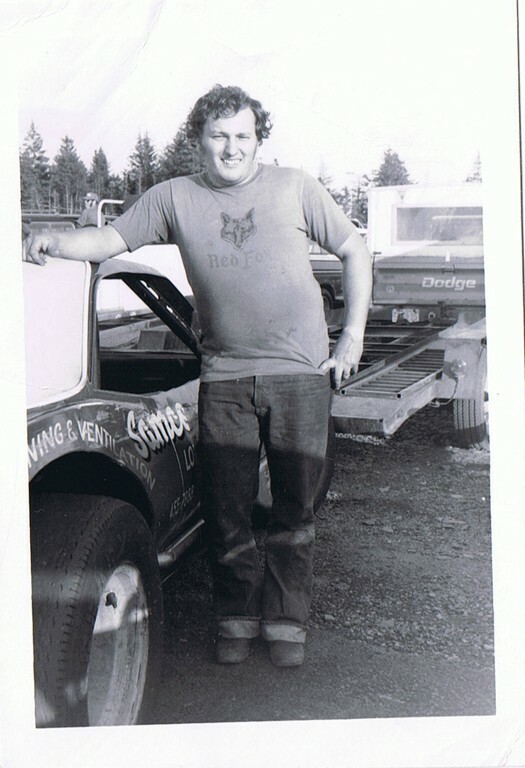 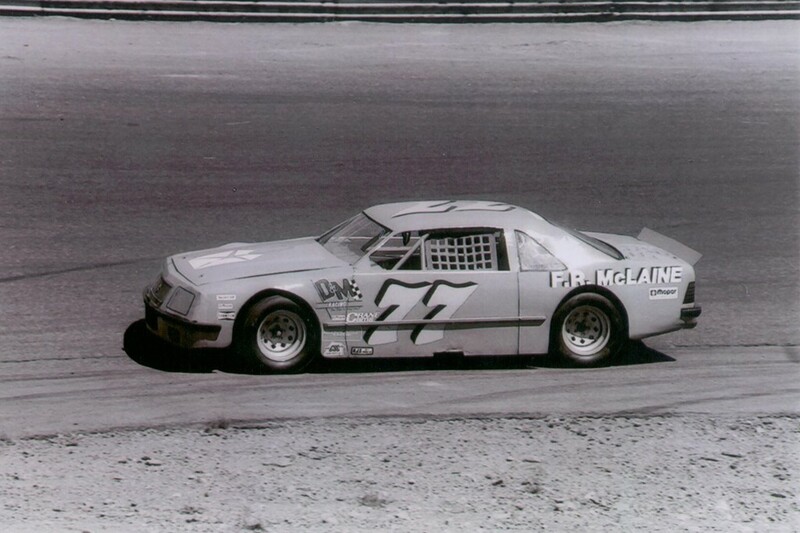 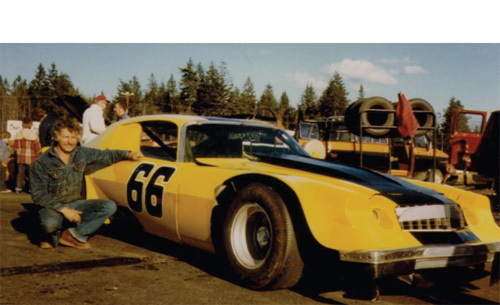 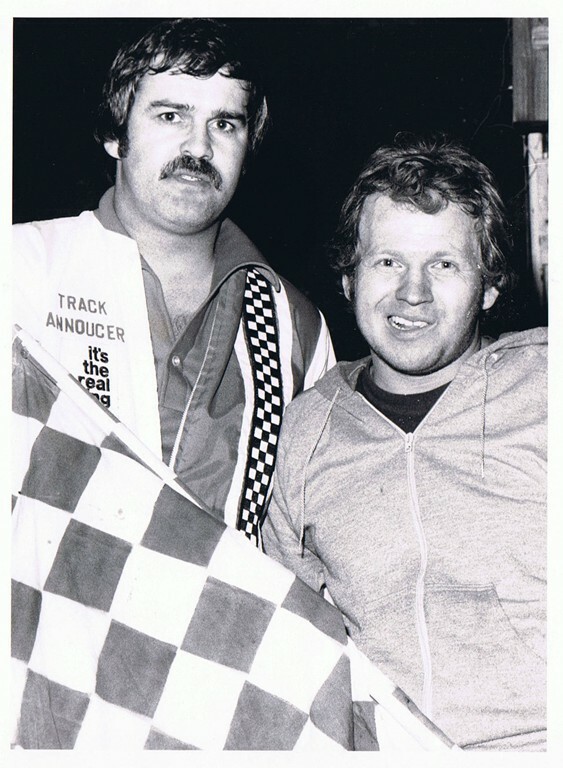 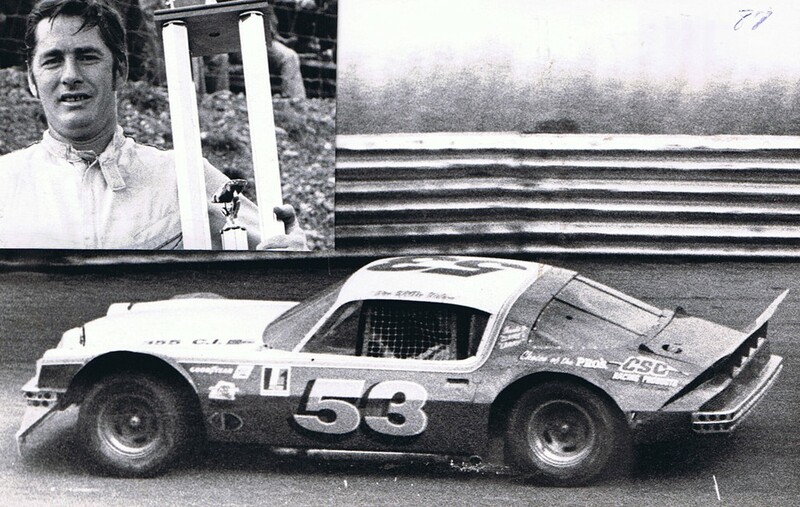 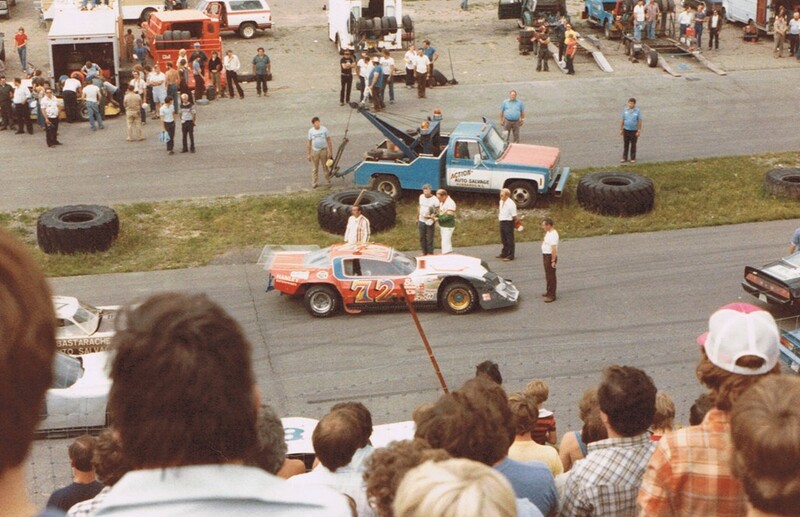 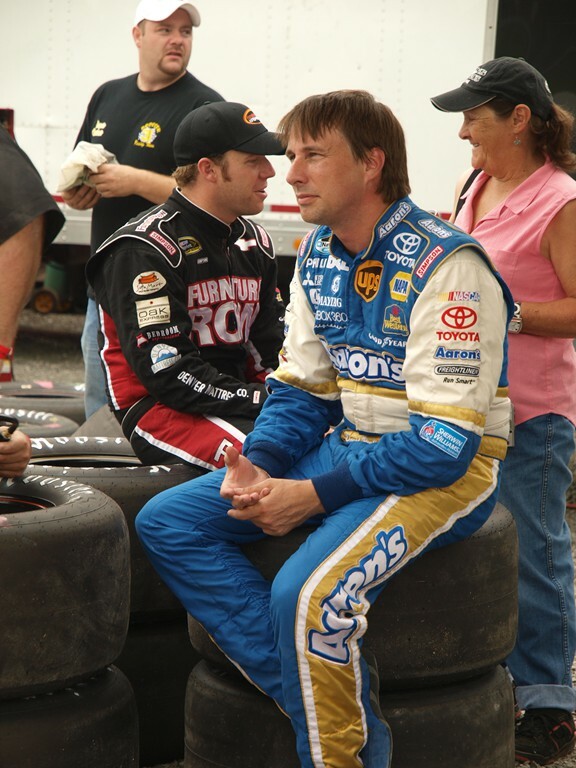 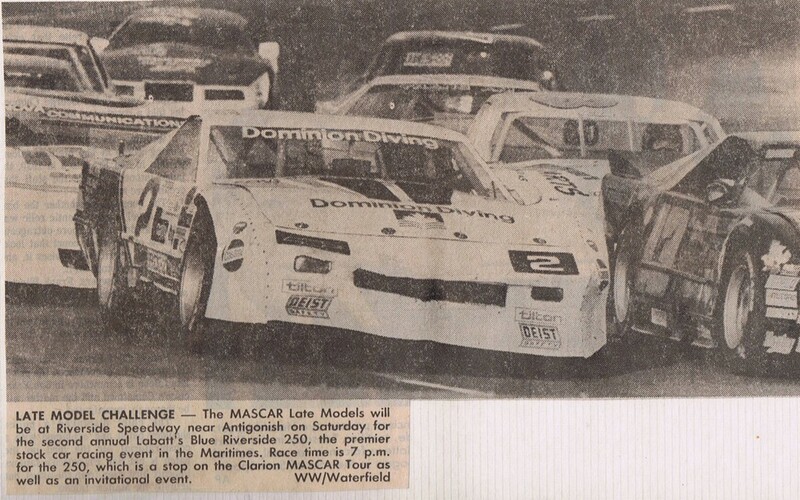 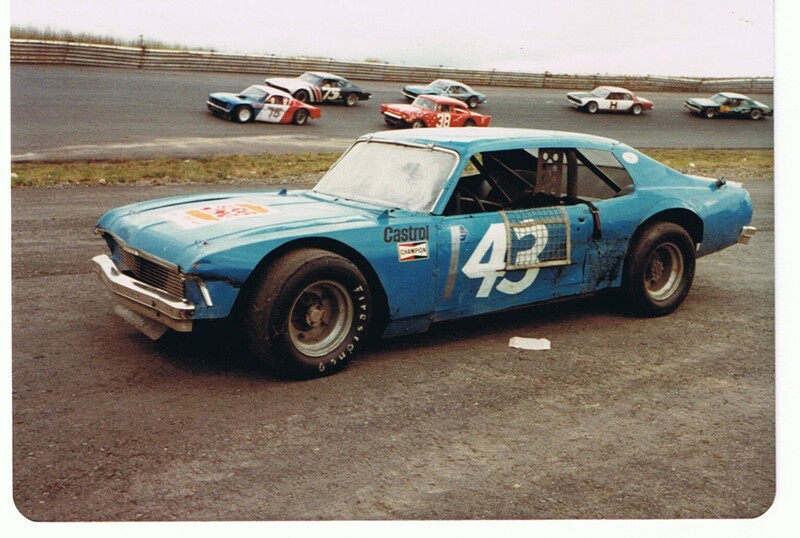 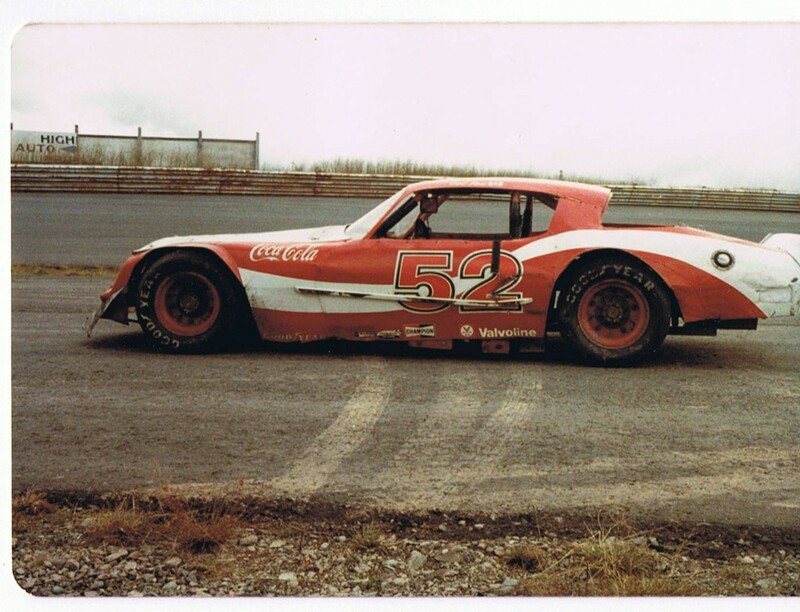 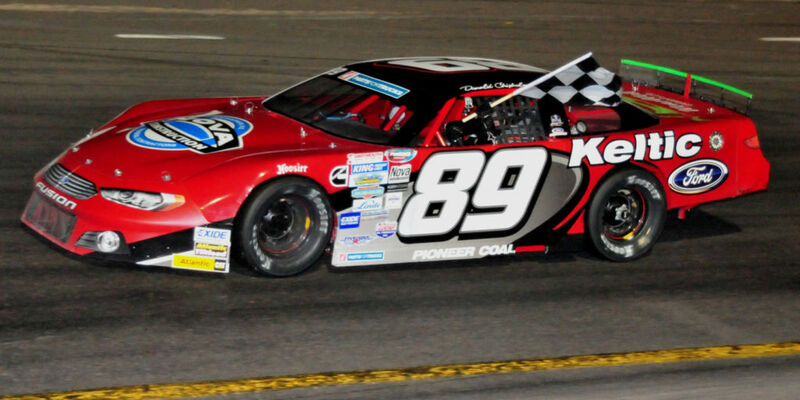 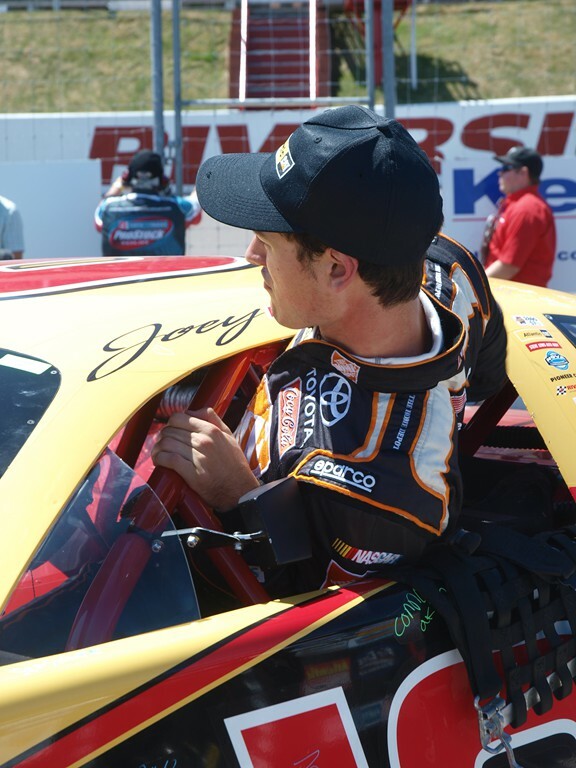 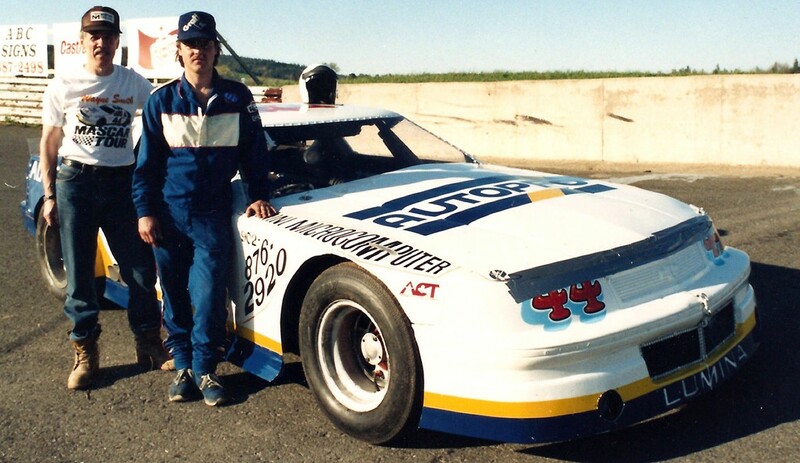 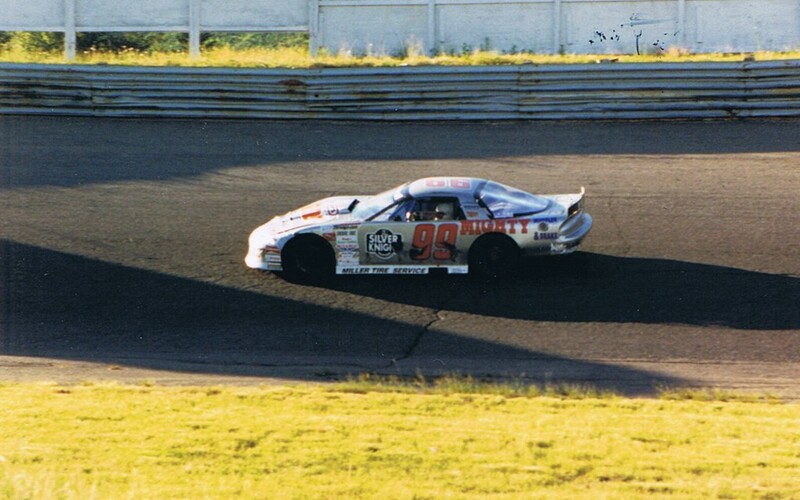 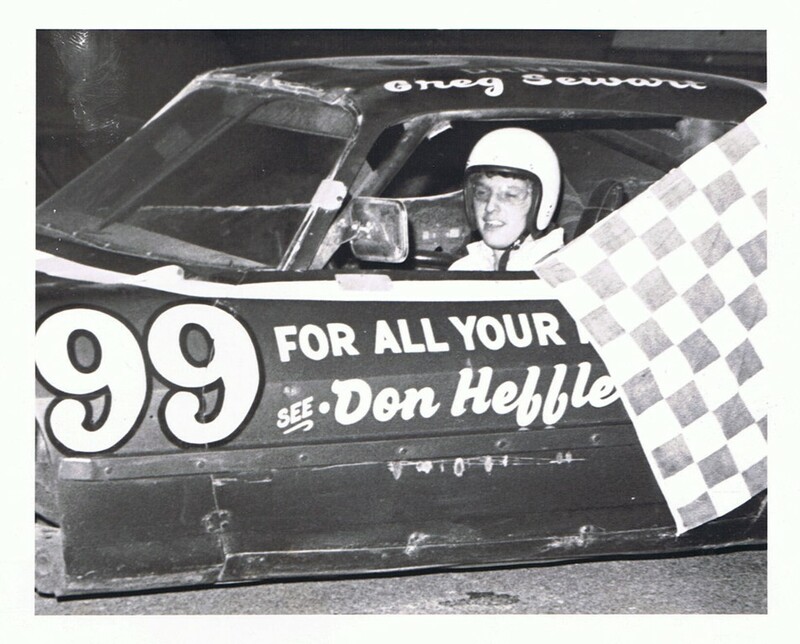 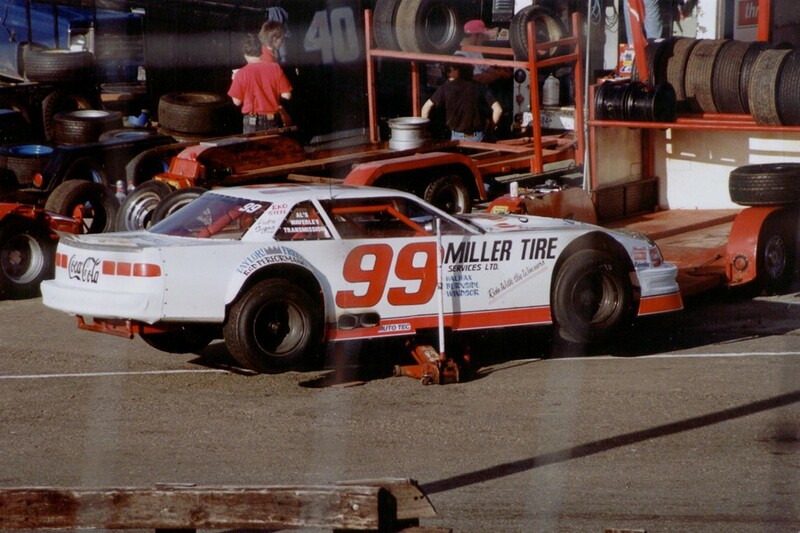 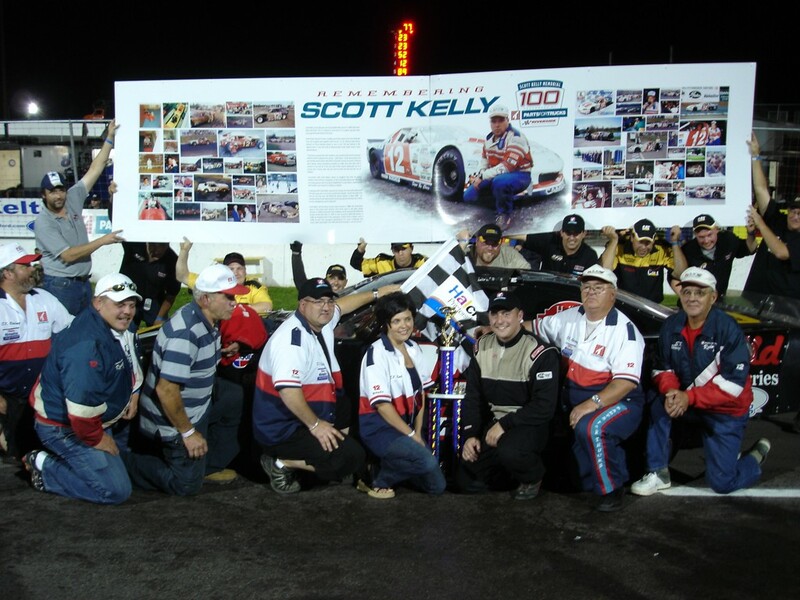 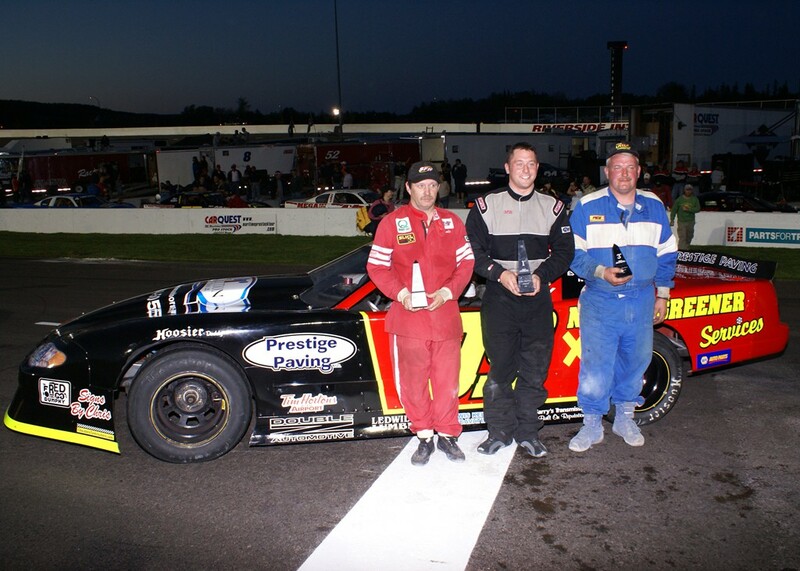 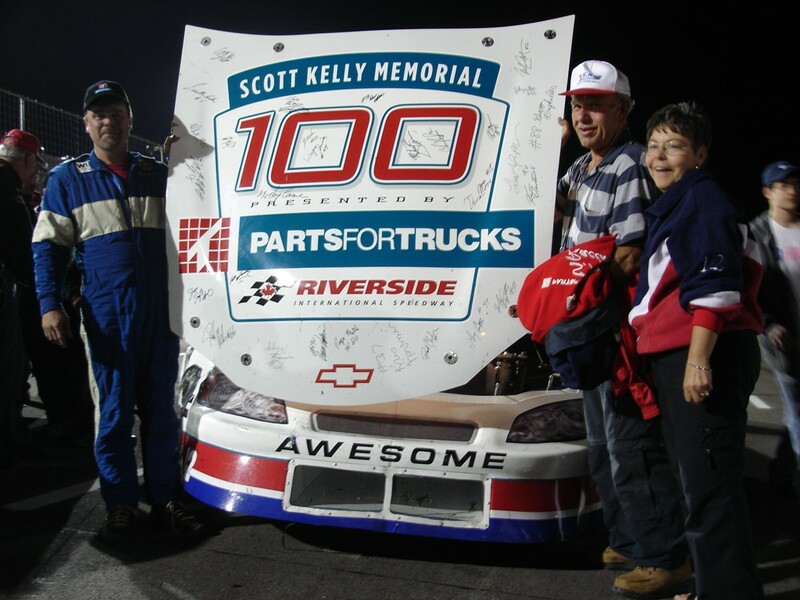 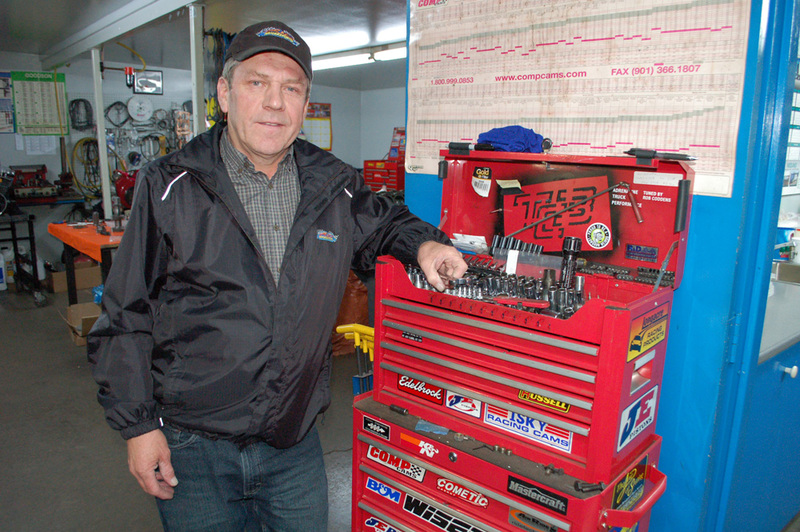 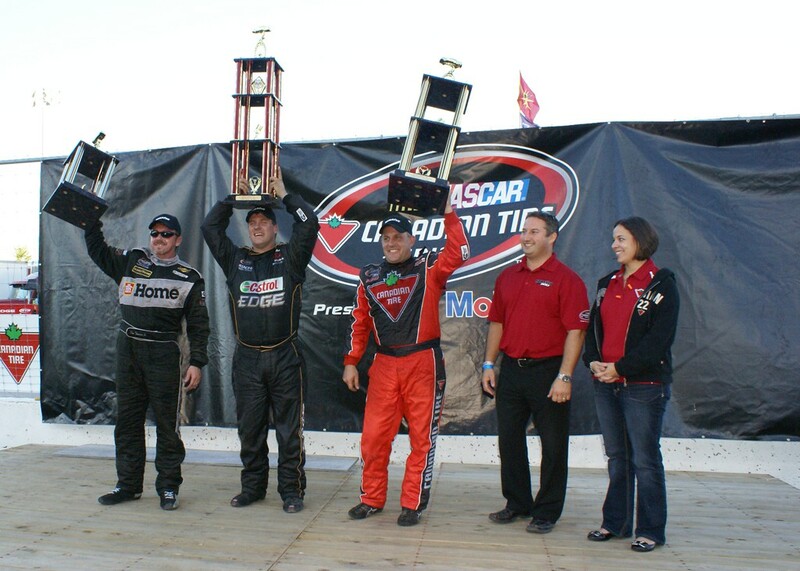 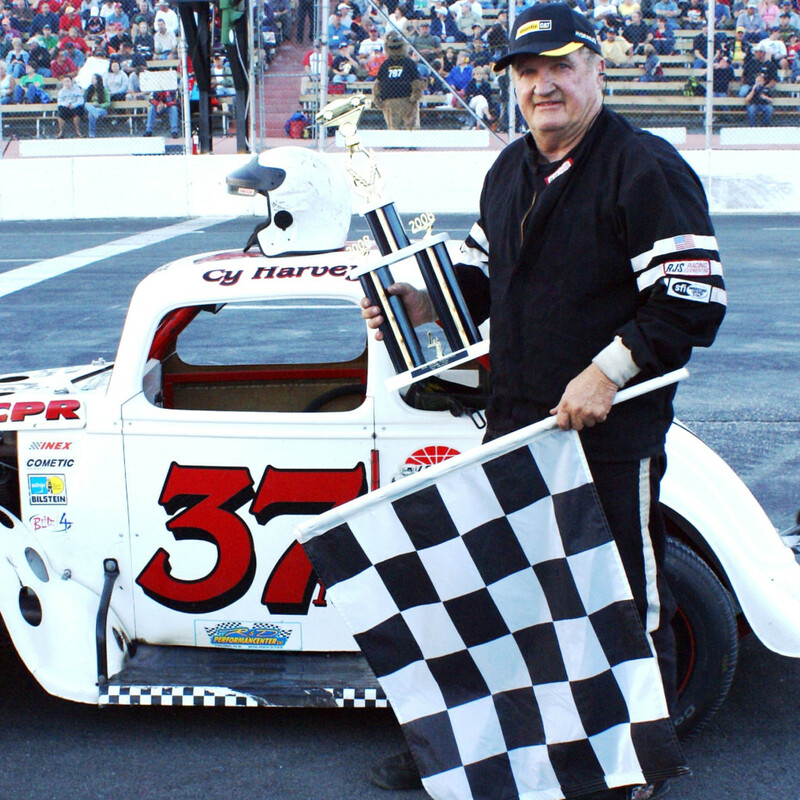 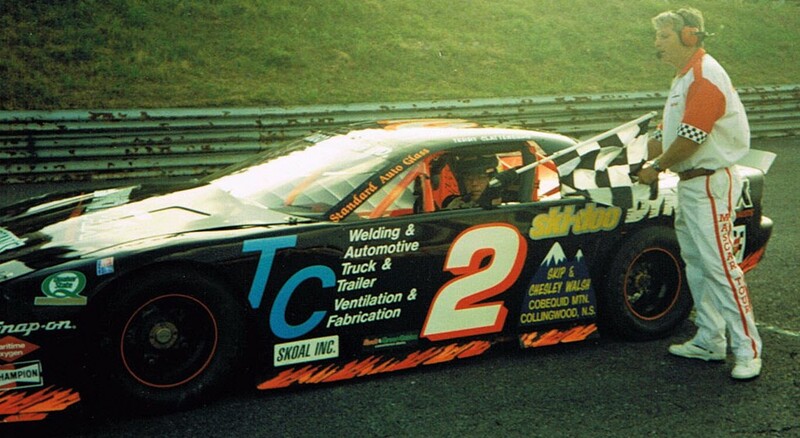 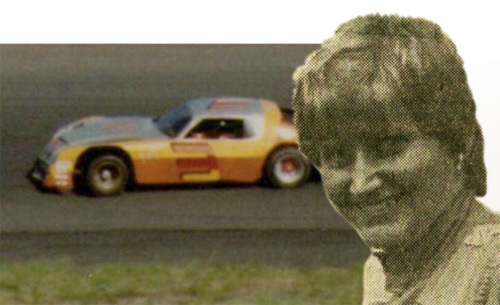 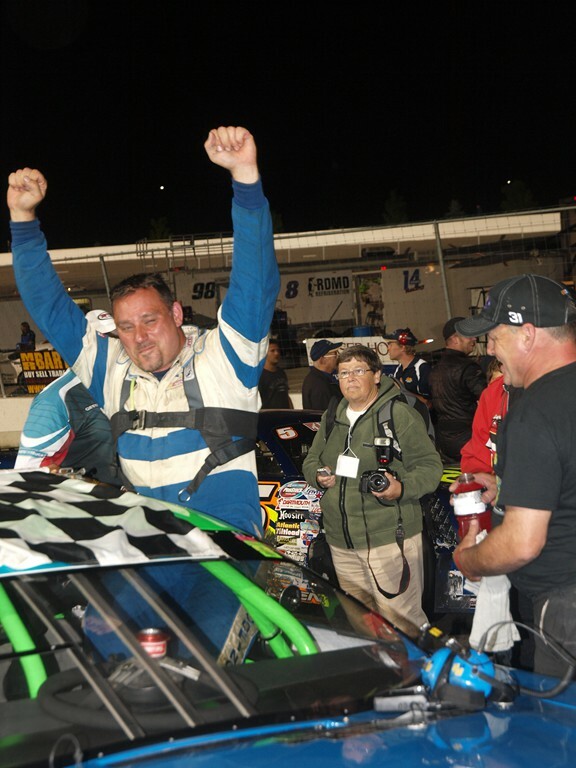 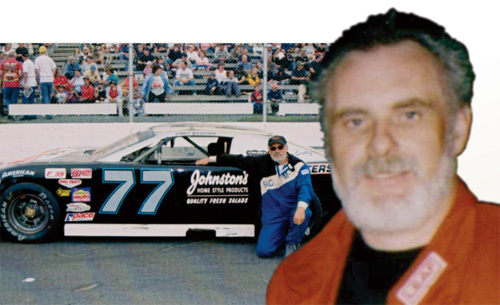 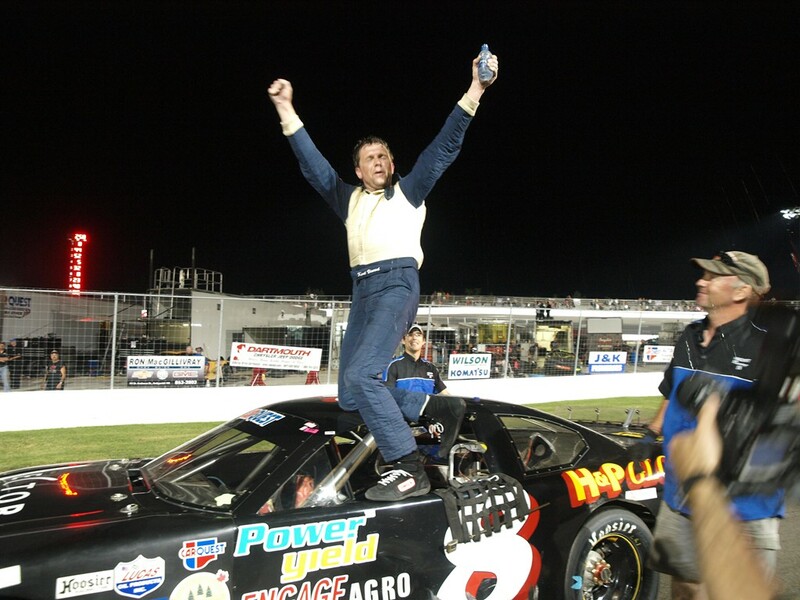 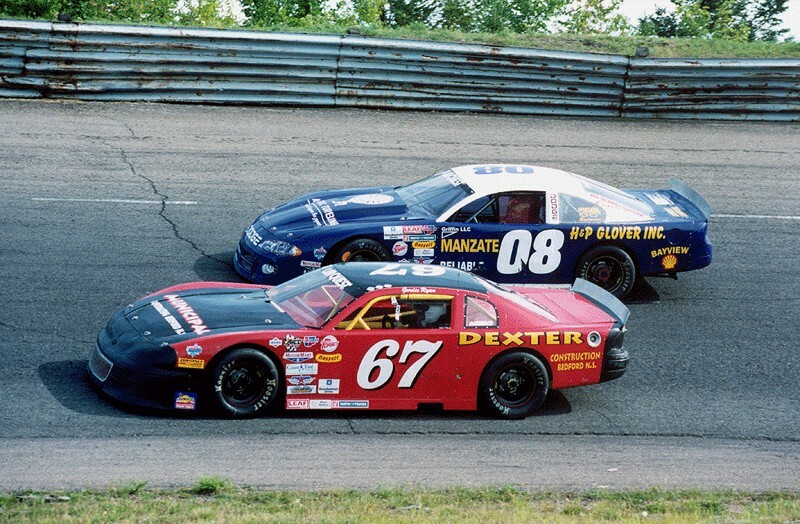 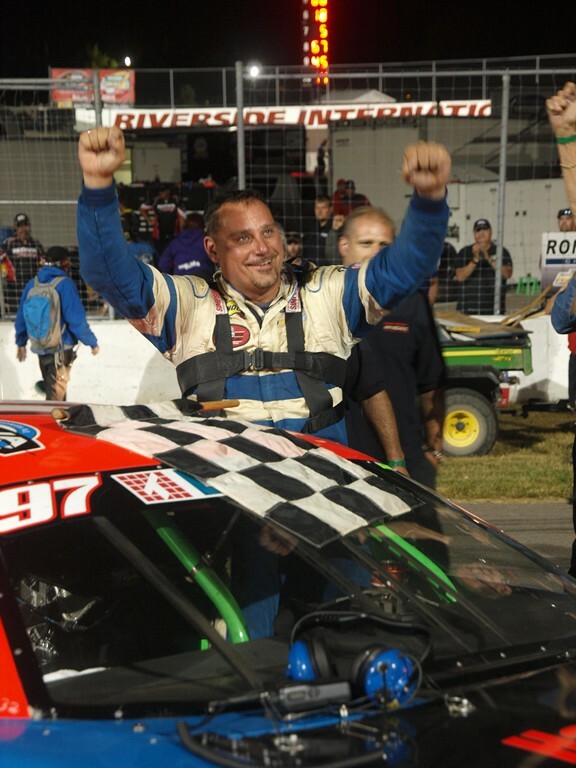 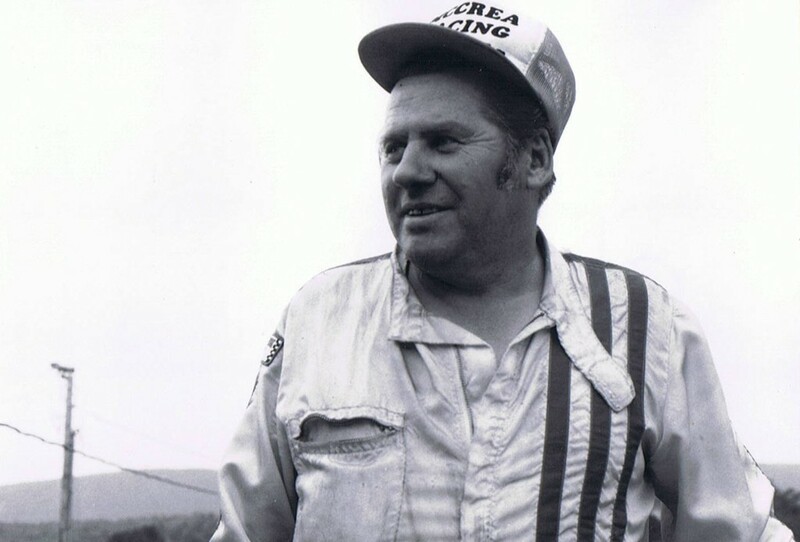 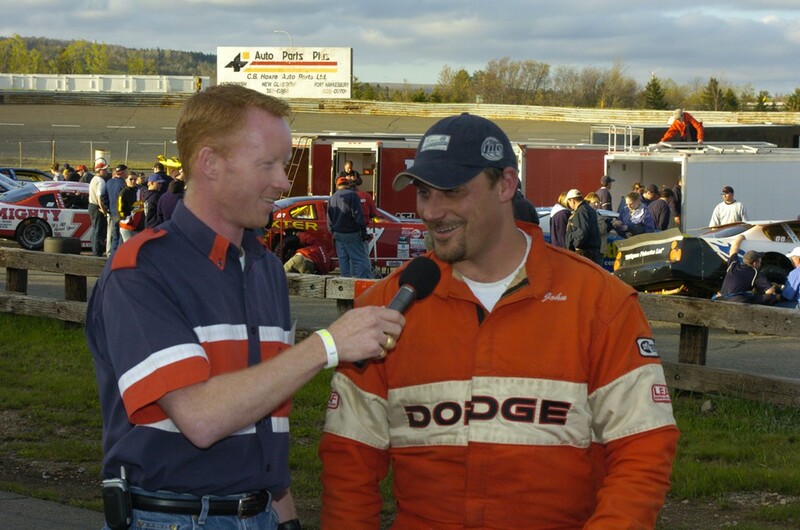 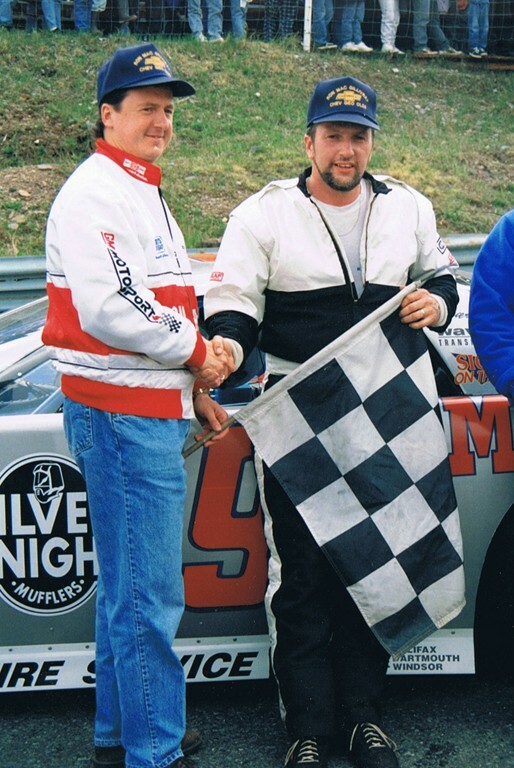 August 19 – Shawn Turple won the reopening race – in a car prepared by the crew of the late Scott Fraser, the winningest driver ever at Riverside.